These were the stalls who attended the 2018 Deepdale Christmas Market, over 130 stalls joining the permanent shops & cafe of Dalegate Market. 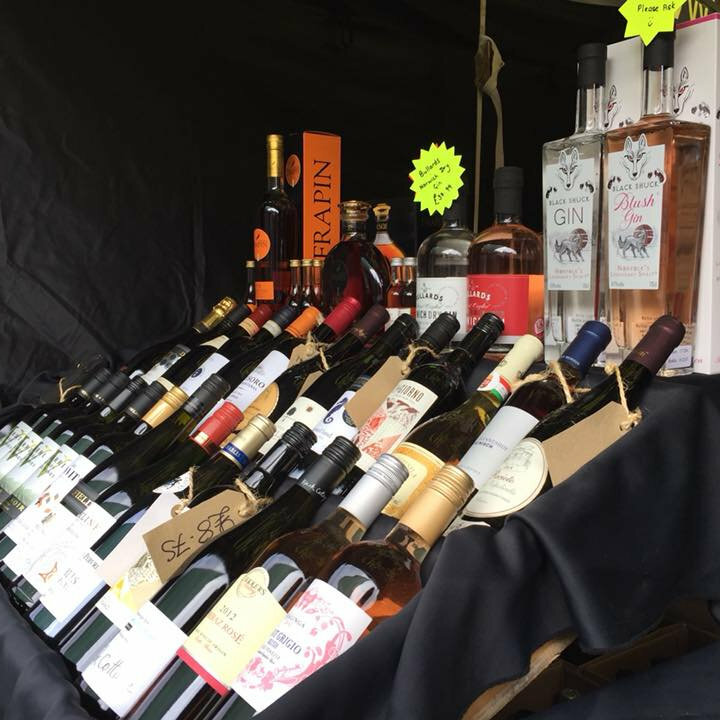 We host the stalls in 3 large marquees around the Dalegate Market site, in the Brick Barn of Deepdale Backpackers & Camping and also in St Mary's Church across the road. We'll announced the 2019 stalls nearer the event, however we can tell you now that there will be everything you can think of - Great food & drink, clothing, wildlife & nature, art & crafts, real ale, jewellery, penguin pictures, home furnishings, cards, stained glass and more - Put simply, a great selection of Christmas shopping for presents, decorations and great food & drink! 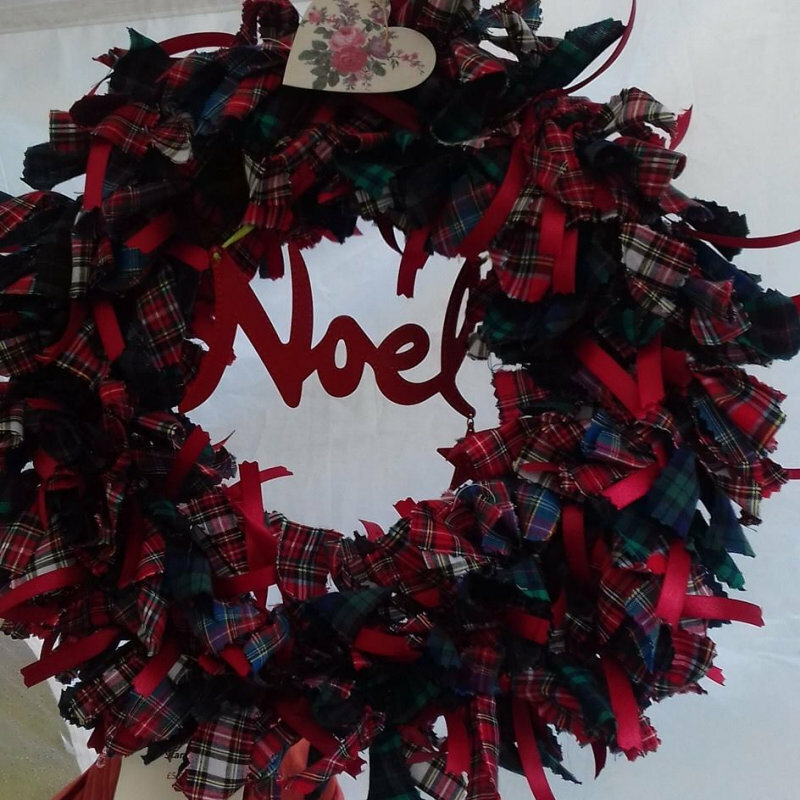 See you at Dalegate Market | Shopping & Cafe on Friday 29th, Saturday 30th November and Sunday 1st December 2019. 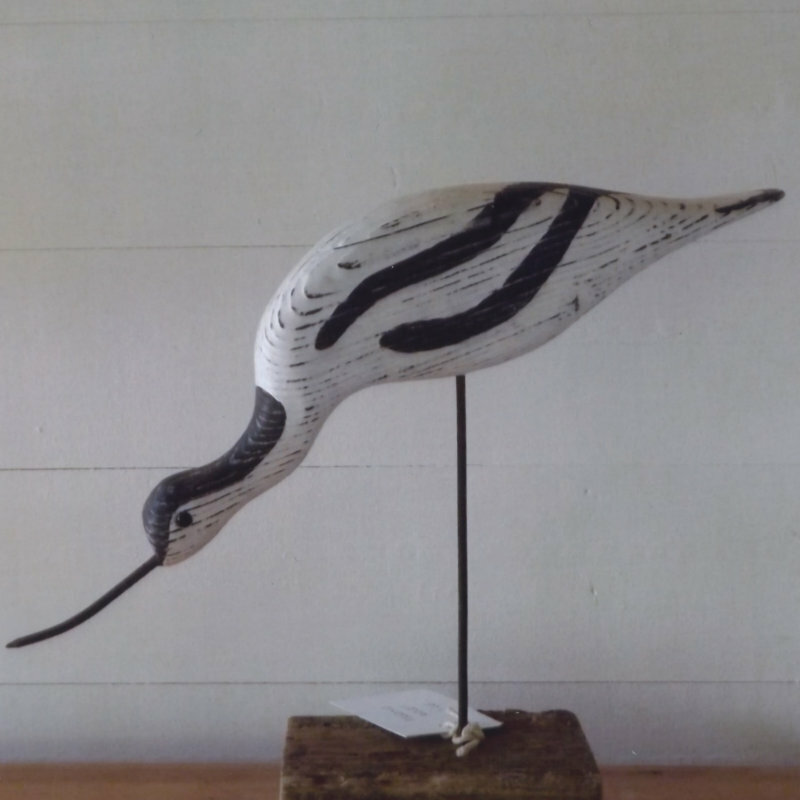 Bringing the outside and Nomad & the bowerbird have come together to bring you a mix of coastal flavoured, globally sourced, and found objects for both lifestyle and home, all carefully curated and showcased with a creative eye. 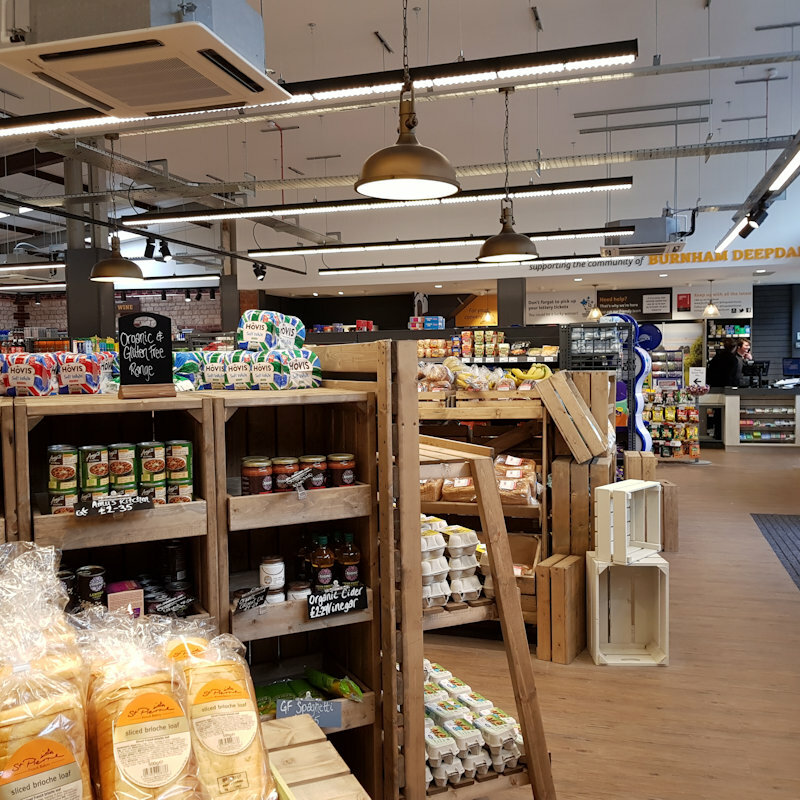 More than just a filling station with a shop, Deepdale Stores offers the full service of a Supermarket, with a free ATM, off-licence, fresh fruit & vegetables, a wide range of provisions, not forgetting the essential bread, milk & newspapers. 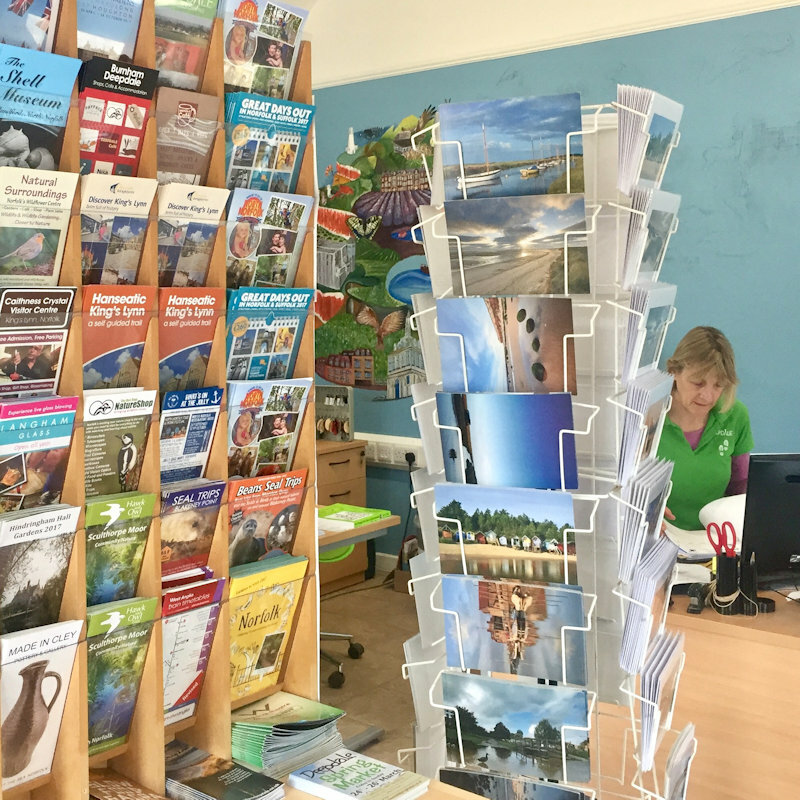 Looking to combine shoppping at Deepdale Christmas Market with a visit to the beautiful North Norfolk Coast, then pop in and we’ll help you explore this wonderful part of the world. 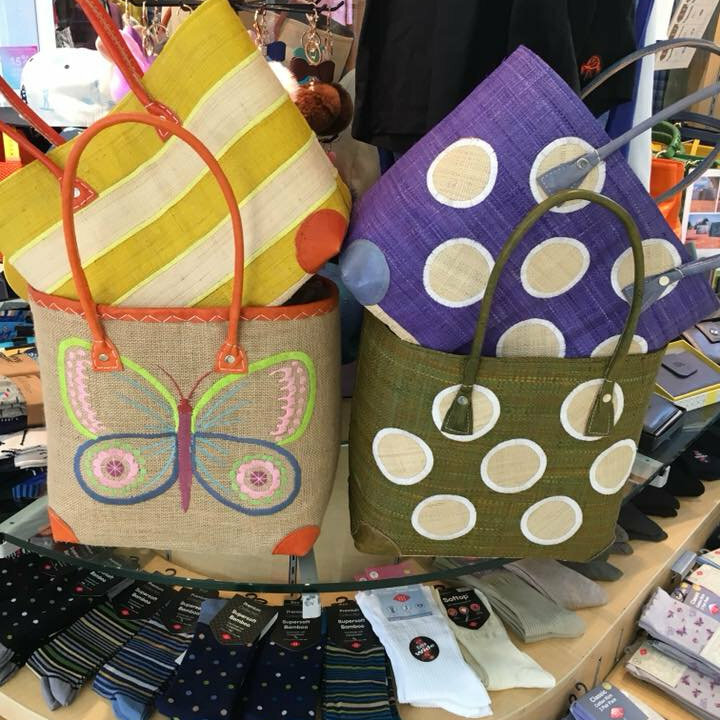 Truly British independent business who create unique and colourful giftware and clothing all designed with a sniff of the sea and a cheeky winkle. 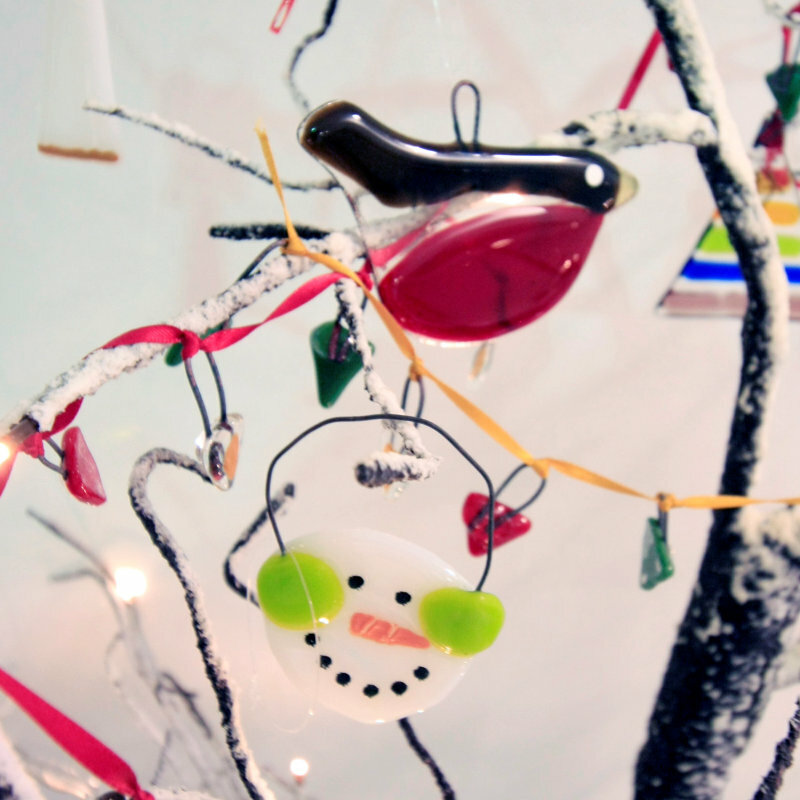 Dont get your tinsel in a tangle this year - come and shop with us for a bit of ho! ho! ho! 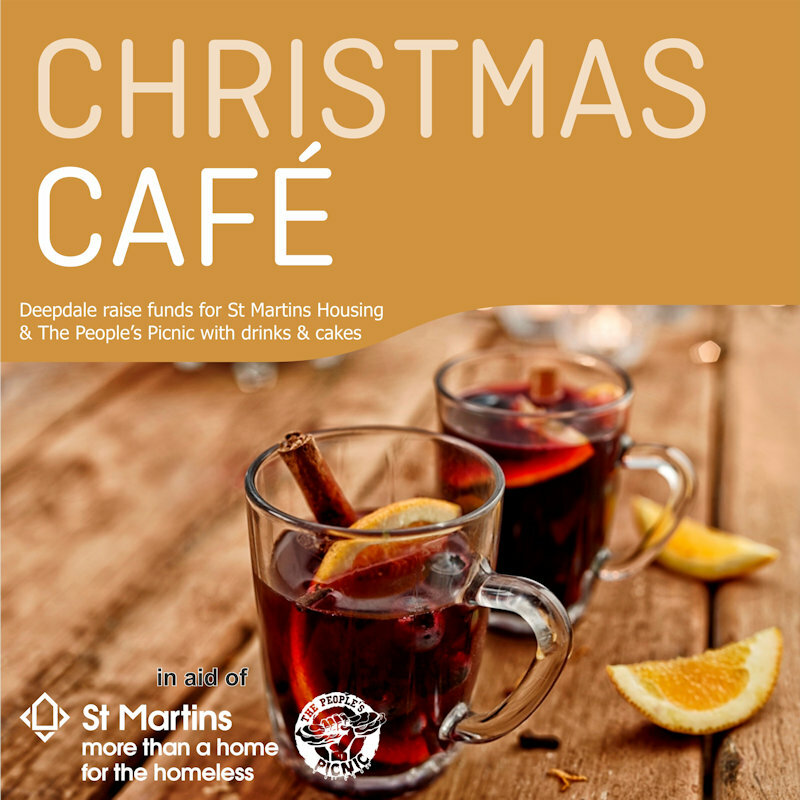 Deepdale Backpackers & Camping friendly team will be serving hot drinks, mulled wine and homemade cakes from the Backpackers Courtyard to raise money for St Martin’s Housing & The People’s Picnic. Est 2013 and still providing great locally sourced Coffee and Tea along with our own homemade cakes and festive treats. 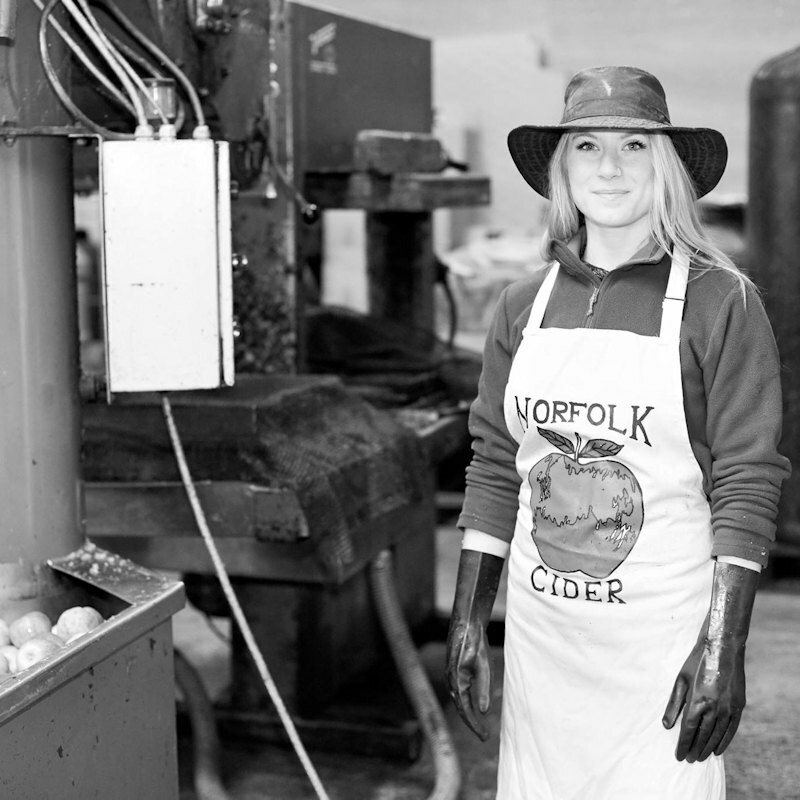 A hand-pressed gourmet pie company based in North Norfolk. 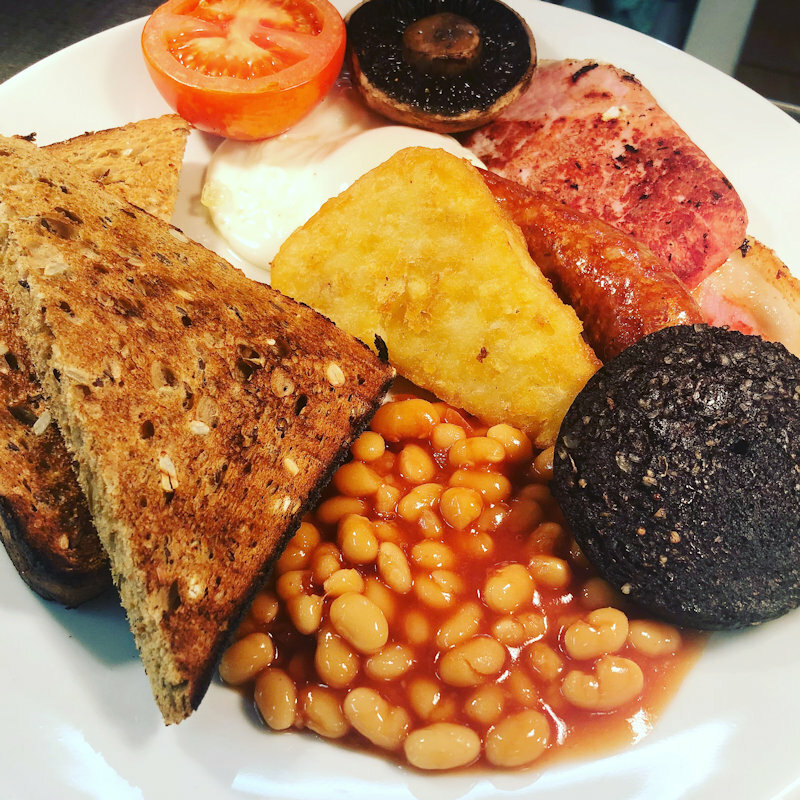 We use only free-range meat; tasty vegetarian & vegan options too. 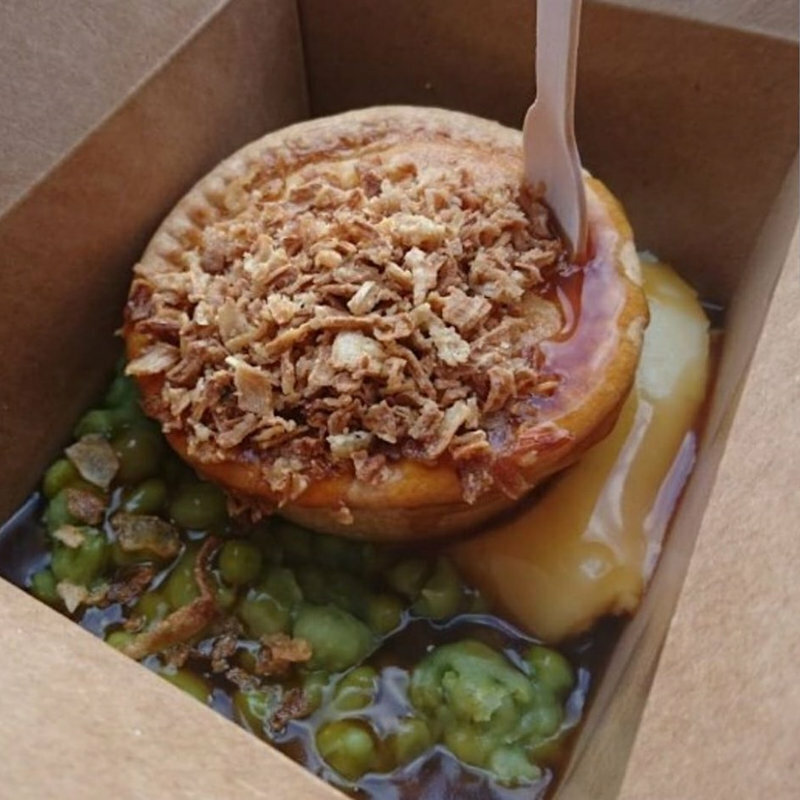 Served with buttery mash, smashed minted peas, gravy and crispy shallots. Authentic Middle Eastern street food. Freshly fried falafel & grilled halloumi wraps, with crispy sweet potato fries, and delicious spicy soups. 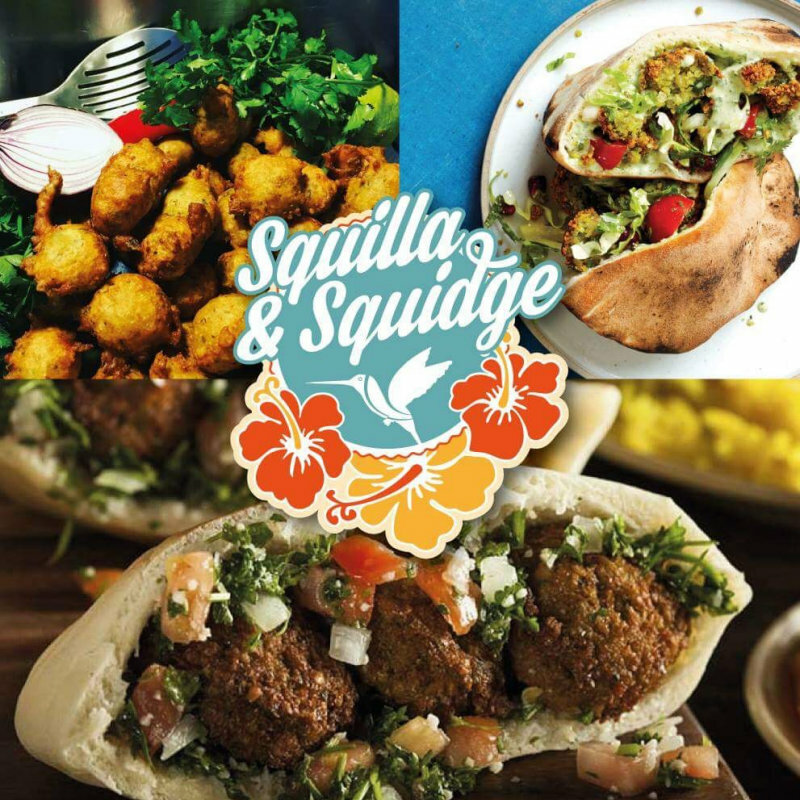 Vegetarian & vegan food at it’s best! 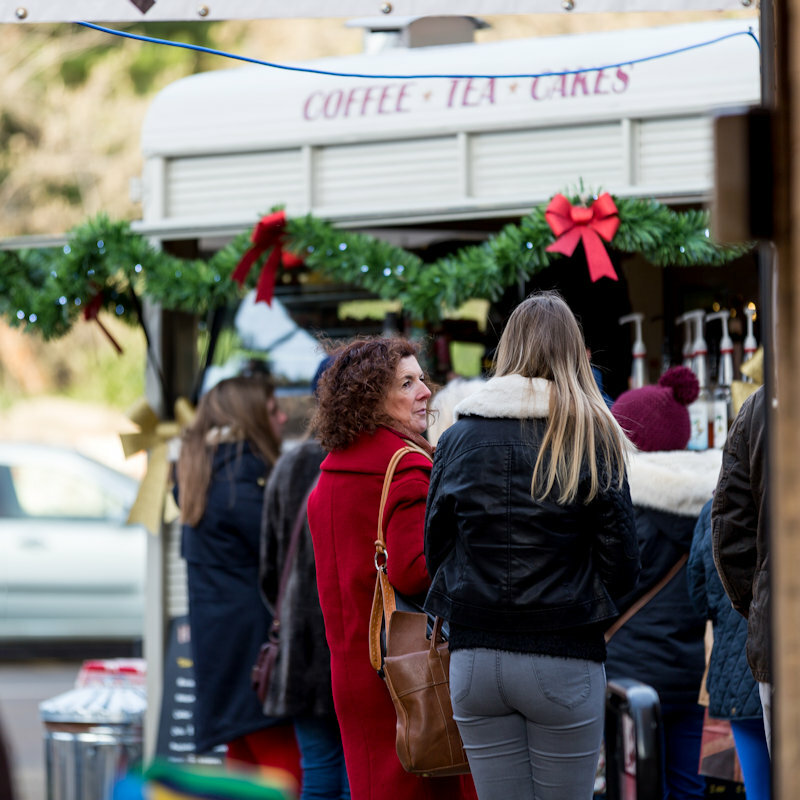 Serving hot drinks, including tea, coffee & hot chocolate with biscuits, cakes etc. 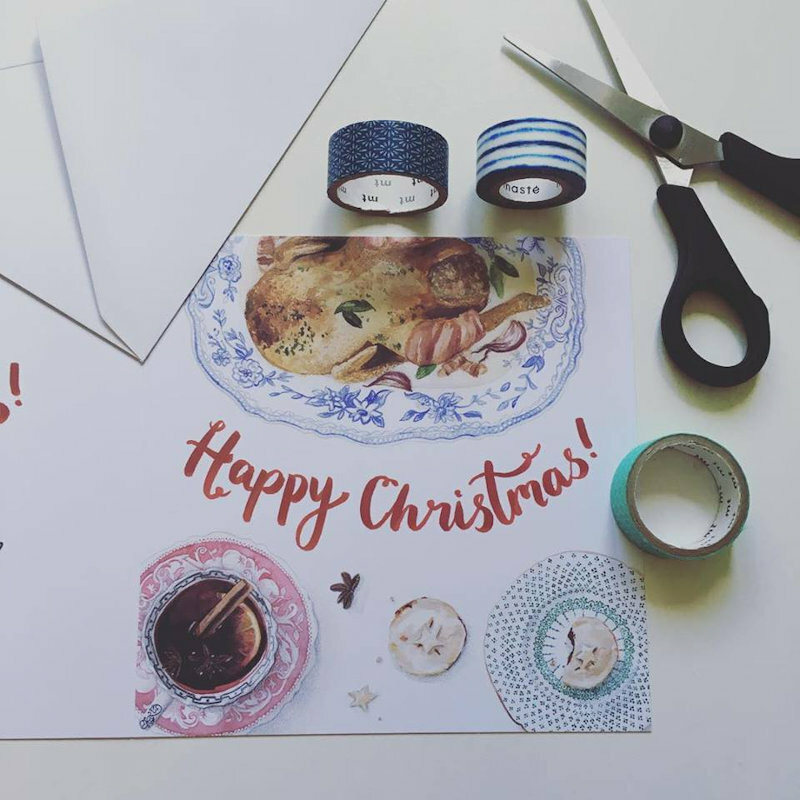 Home-made Christmas goodies. 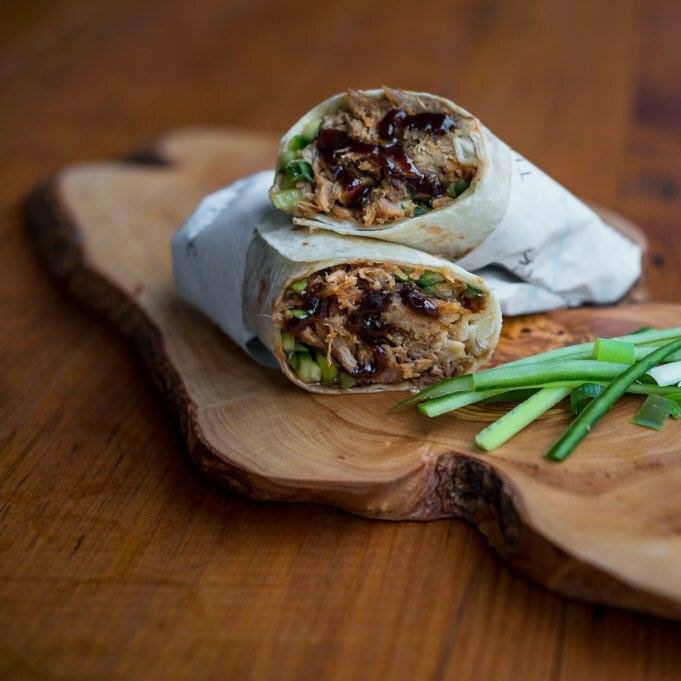 Crispy duck wraps- aromatic crispy duck, cucumber,spring onion and hoisin sauce, wrapped in a warm tortilla. 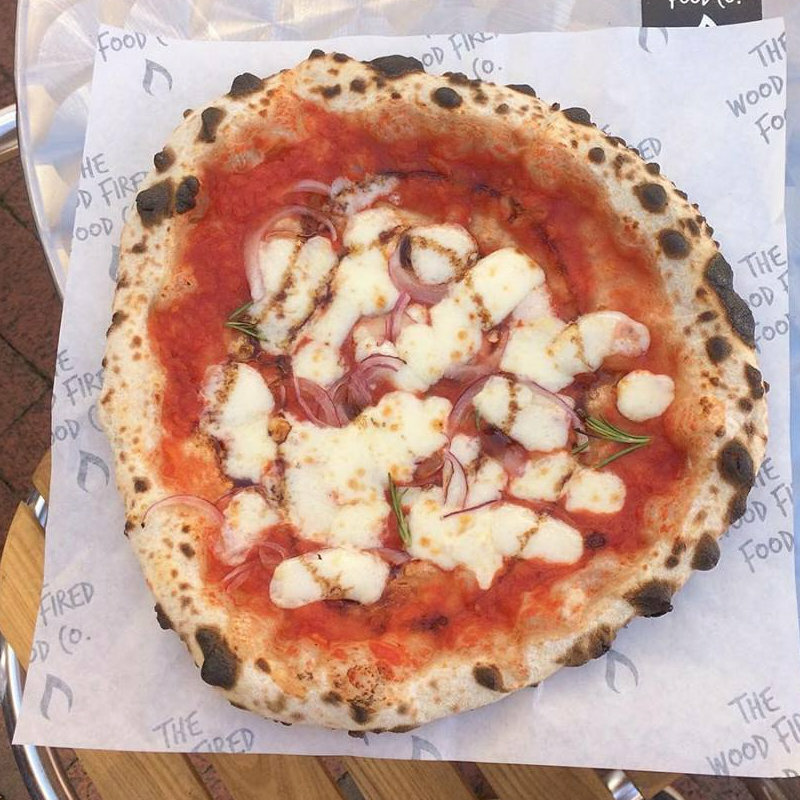 The Wood Fired Food Co.
Norfolk’s finest wood fired sourdough pizzas, made using only the highest quality ingredients and cooked in 90 seconds. We are is a Family run Wine business and specialise in great wines at good prices. We also offer Mulled Wine, cocktails floater coffee but most of all, over Christmas we are the 4th Emergency service. 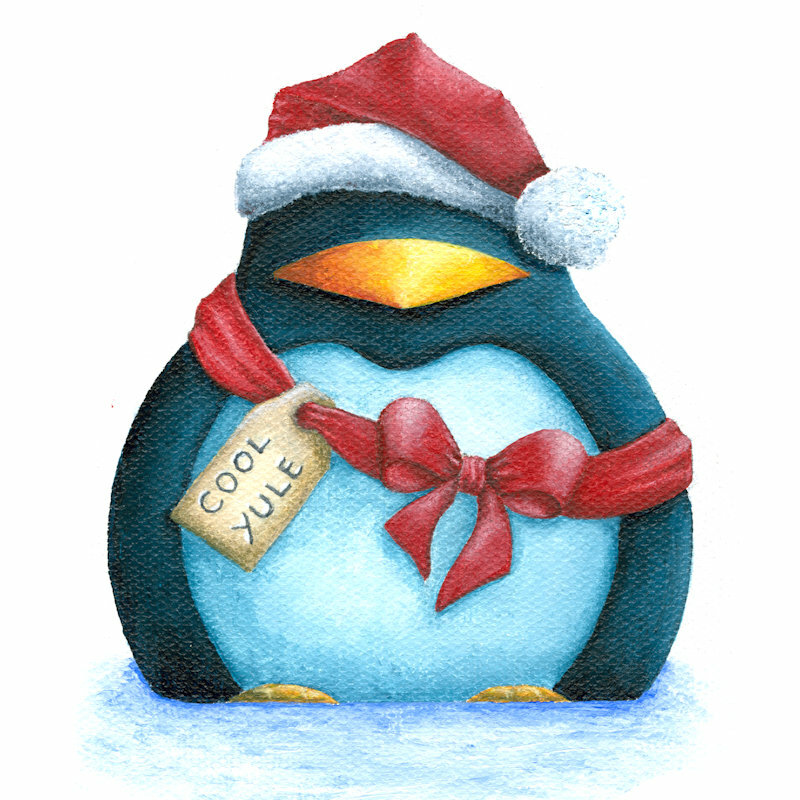 Once again James returns with his charming & humorous Penguin Paintings, Cards and Hand Painted Mugs. Work created here in his Deepdale ’Pop-Up Studio’ during August Bank Holiday will also be on sale. 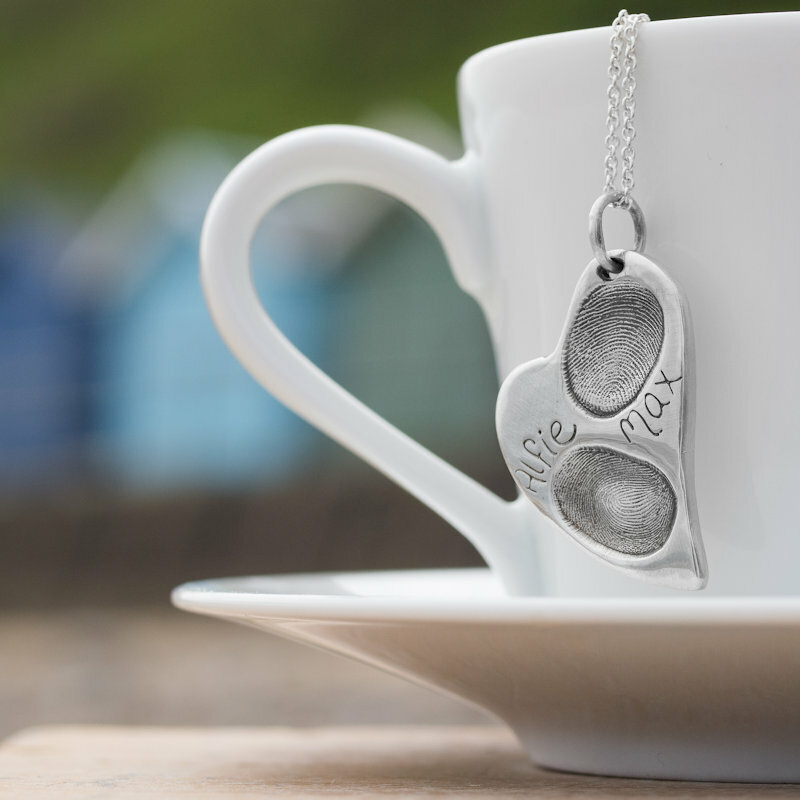 Jewellery personalised with your loved one’s fingerprints, hand, foot and even paw prints, baby scans or to mark a special occasion. Truly thoughtful keepsakes you can treasure forever. 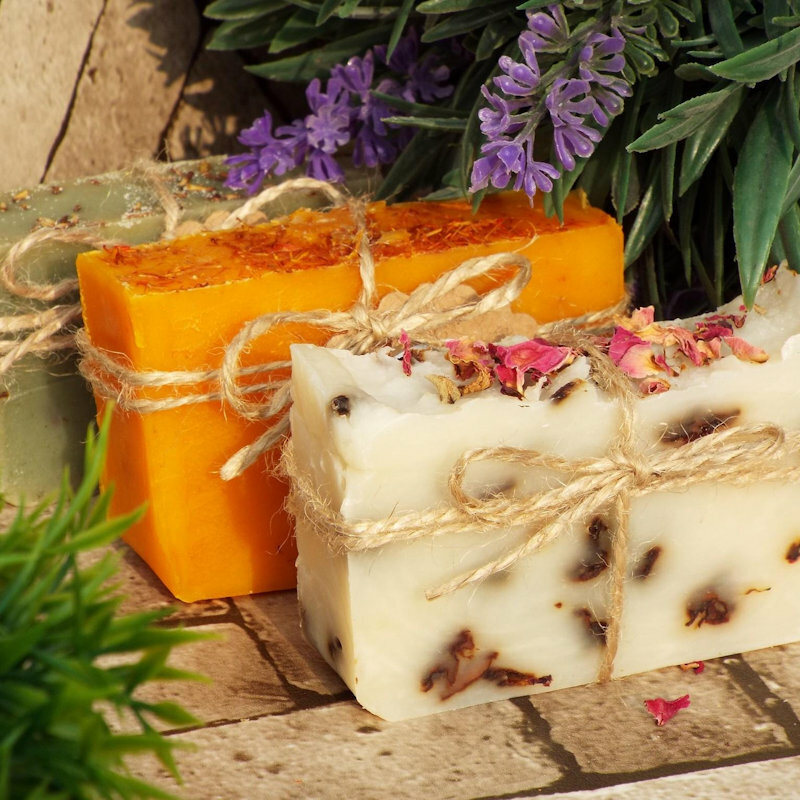 Natural handmade soaps and skincare with rustic charm, lovingly crafted by Leanne at the North Norfolk coast. Range includes bath tea, body butters, scrubs and bath melts. 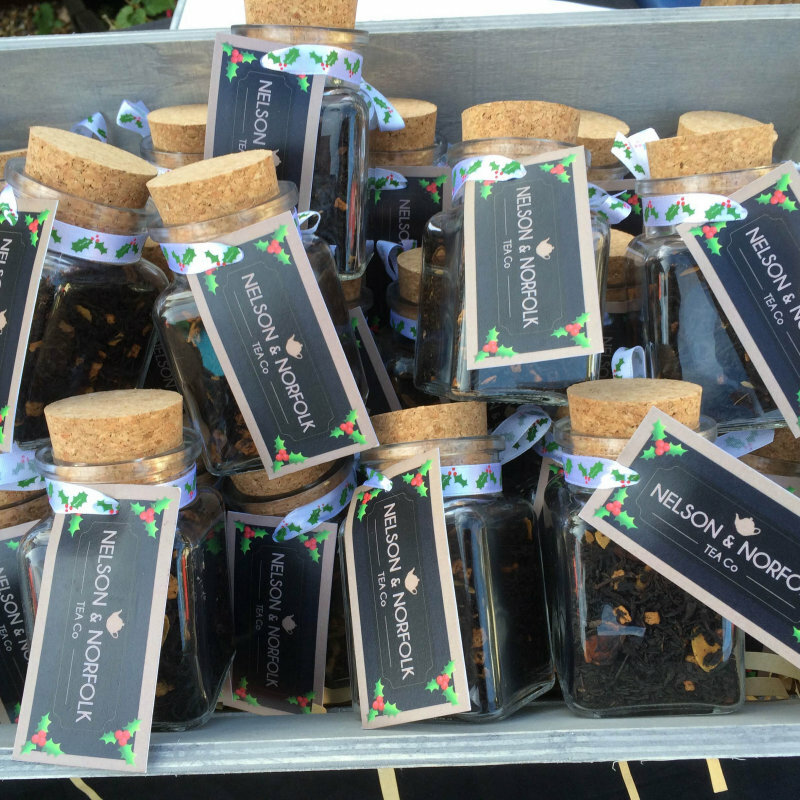 Artisan biscotti, bruschetta and authentic Moroccan couscous blends. 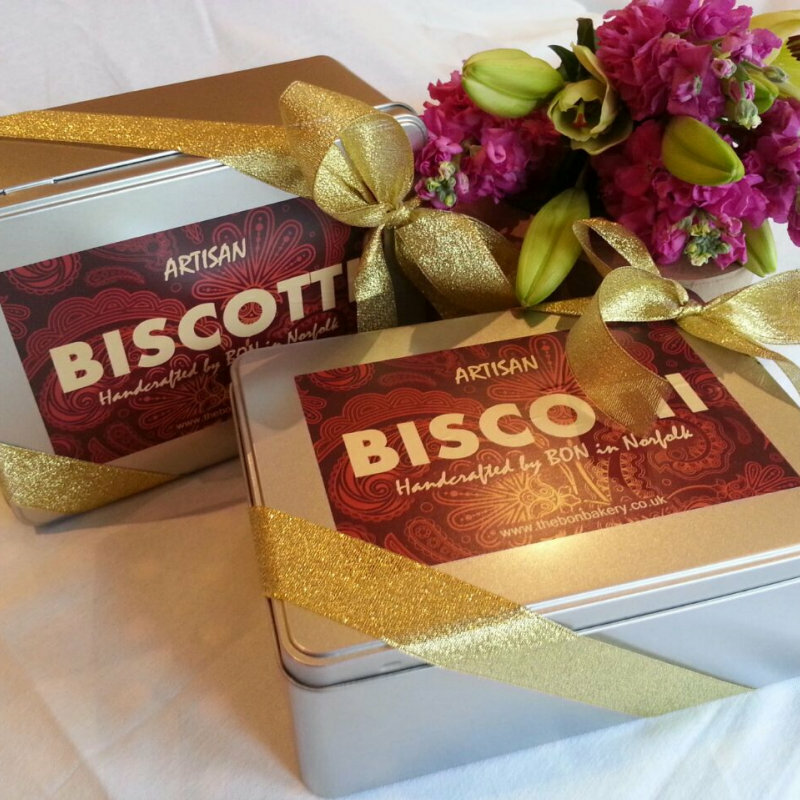 Not to mention our popular biscotti gift tins. 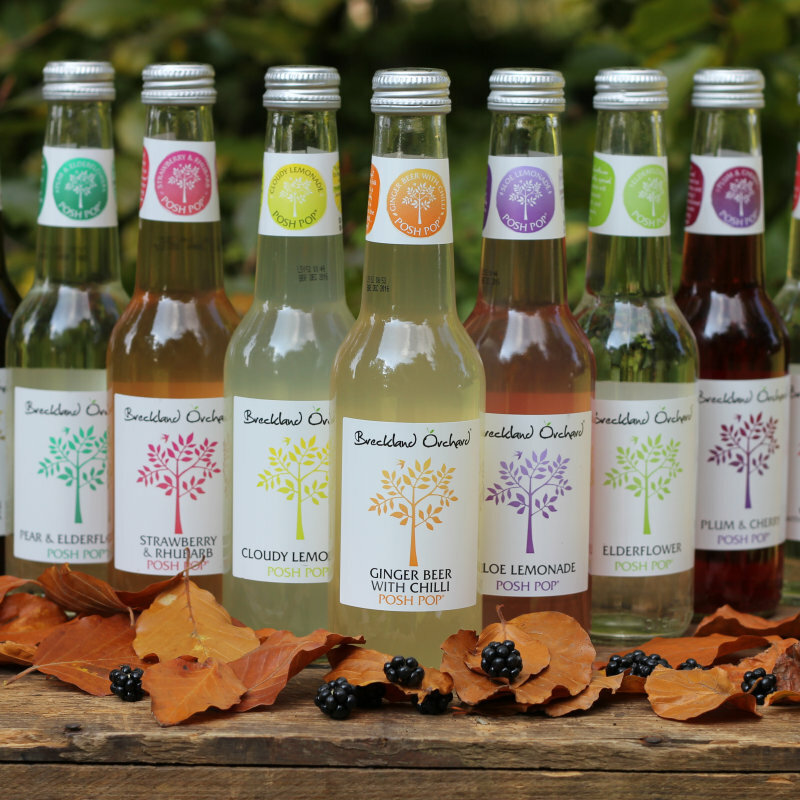 All handcrafted and packaged in Norwich. 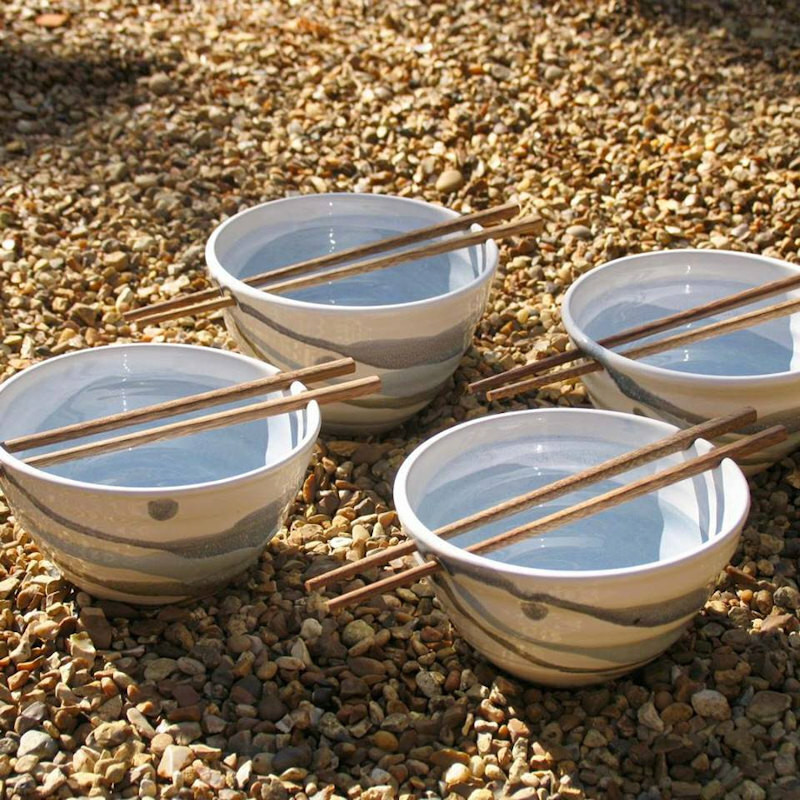 Honeypie Handmade make functional and decorative wares for the home utilizing ceramics, glass and wood. 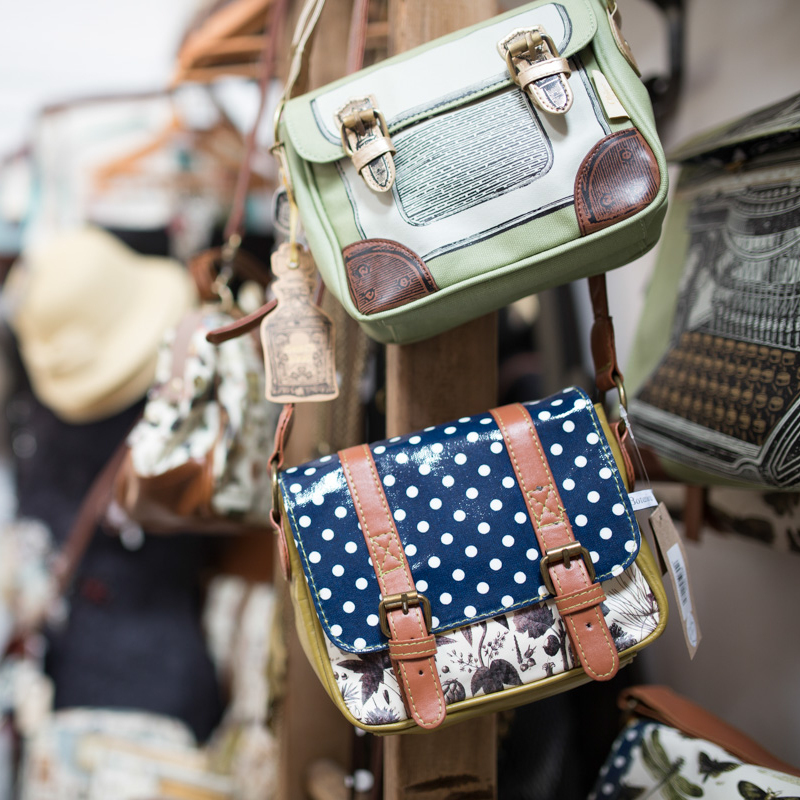 One of our key objectives when creating our pieces is to use recycled and salvaged materials. 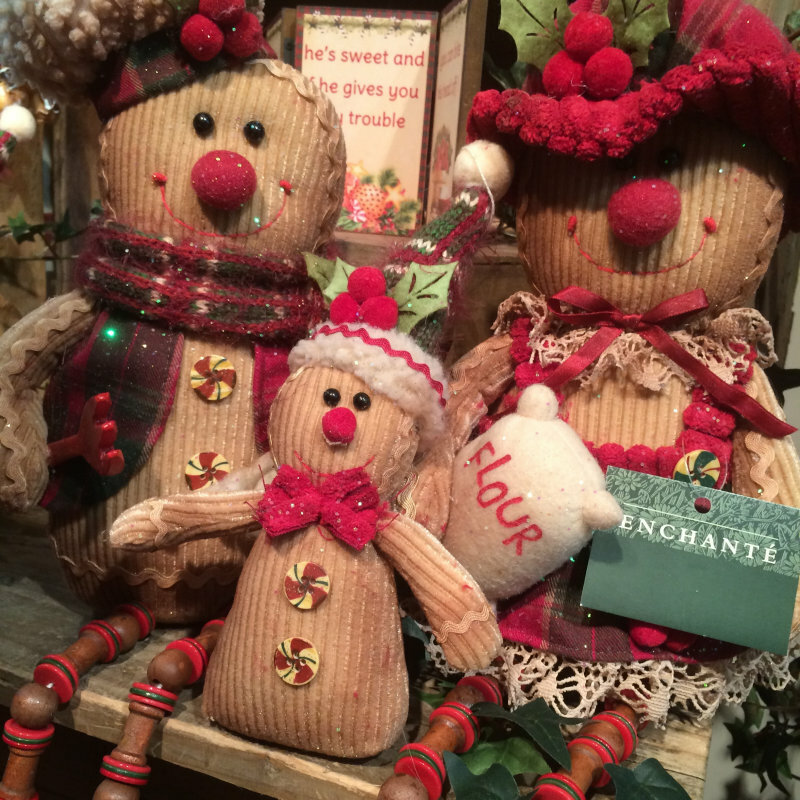 Family-run business specializing in handcrafted wooden Christmas decorations. We pride ourselves on the high quality of our products, made by traditional methods of woodworking. 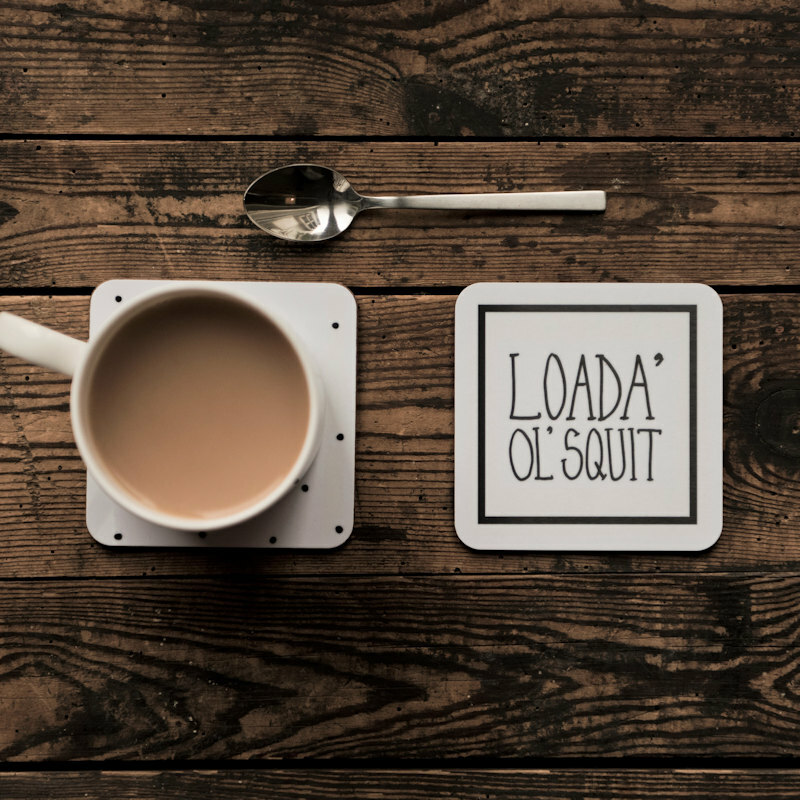 Norfolk’s leading specialist tea and coffee retailer, we bring you the very best in hand-crafted tea and locally roasted coffee. Local handmade charcuterie with provenance. We make small batches of salami, chorizo, sliced meats & biltong using Holkham Estate Venison & South Creake Pork. 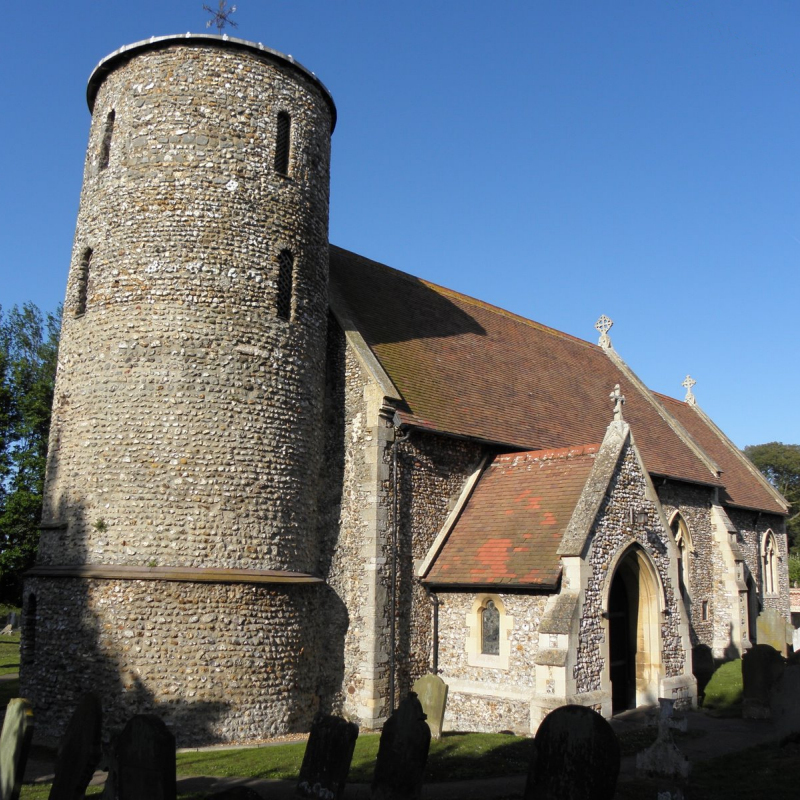 Based in Burnham Thorpe. 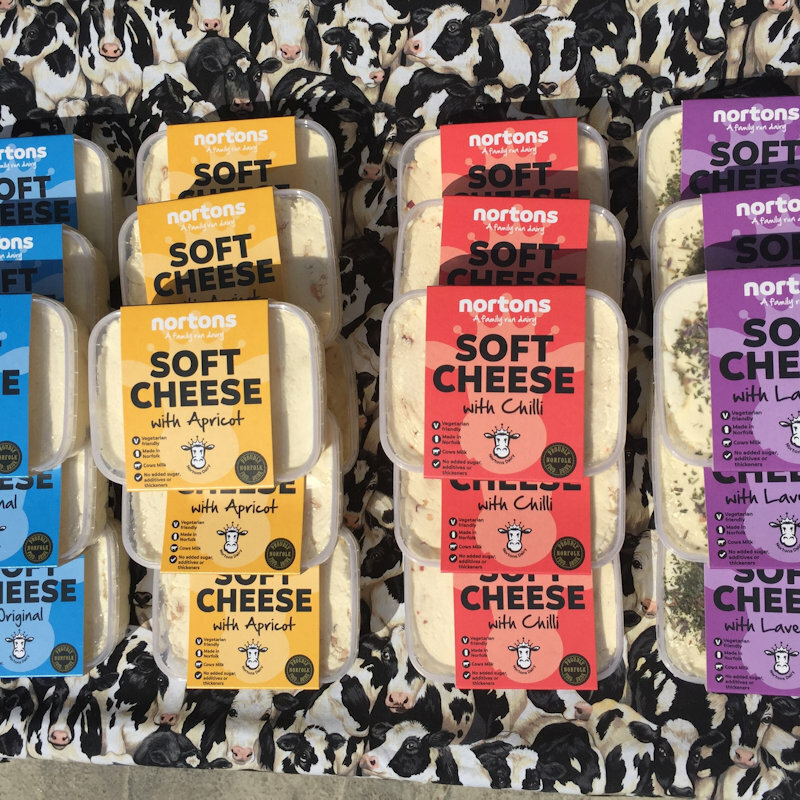 At Nortons’ Dairy, we pride ourselves on producing award-winning cheeses and yoghurt. Winner of Best Flavour Added Cheese at the British Cheese Awards 2017, our lavender cheese is a must-try! Beautifully crafted wooden home and kitchenware designed and made by us. 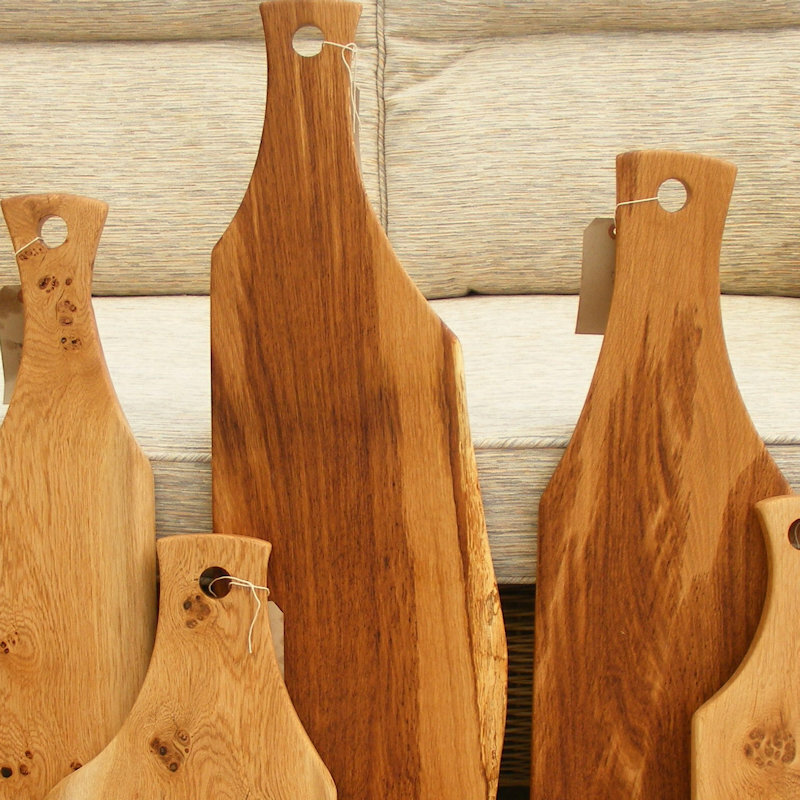 The range includes garden tags, trugs and boxes, egg trays, pinch pots and doorstops through to stunning oak chopping boards. 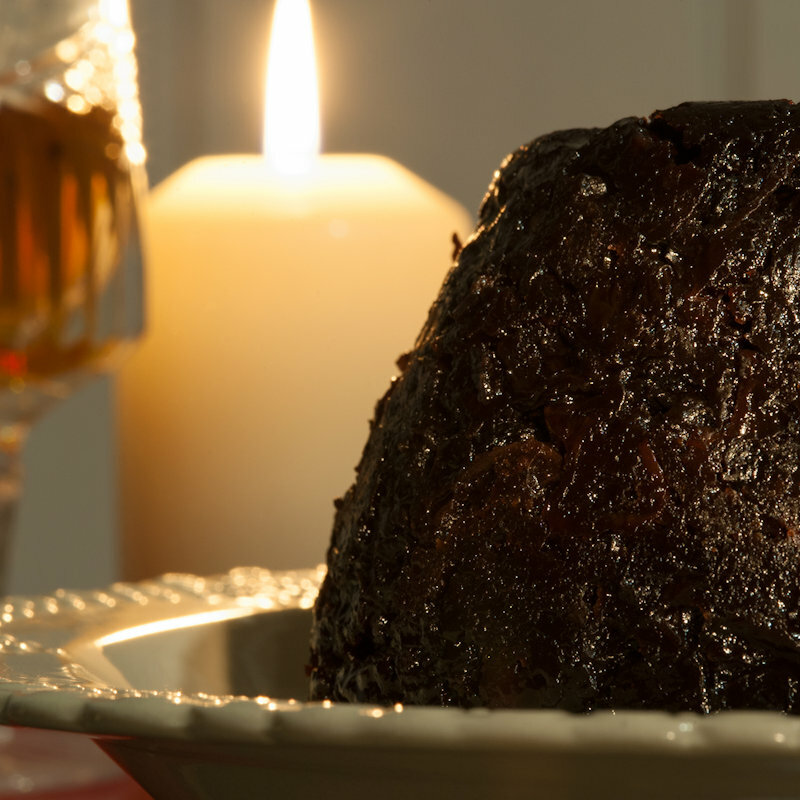 A range of Great Taste award-winning puddings in classic flavours including a fine Christmas pudding. All puddings come in three sizes. 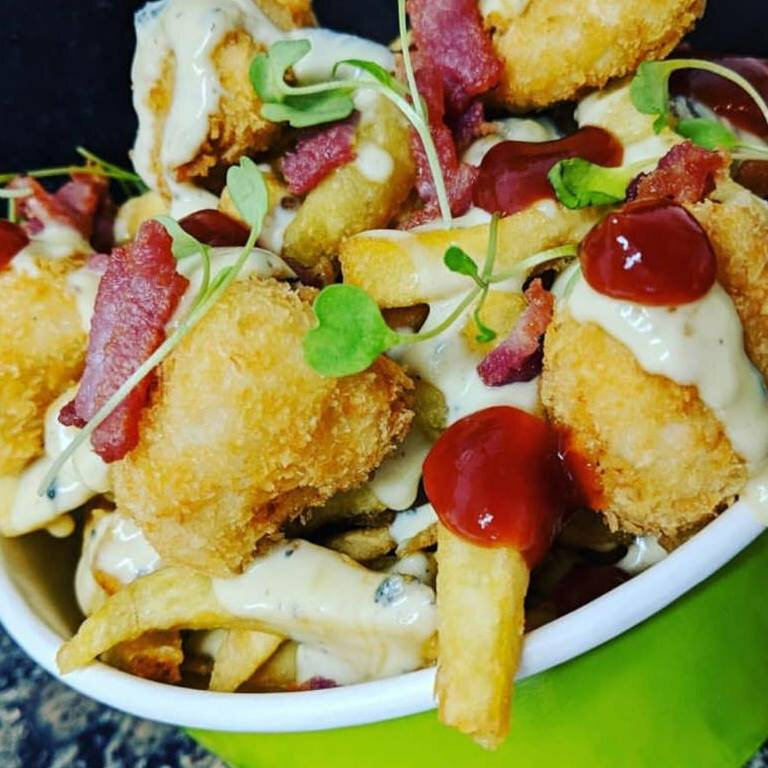 Perfect for sharing with family and friends! 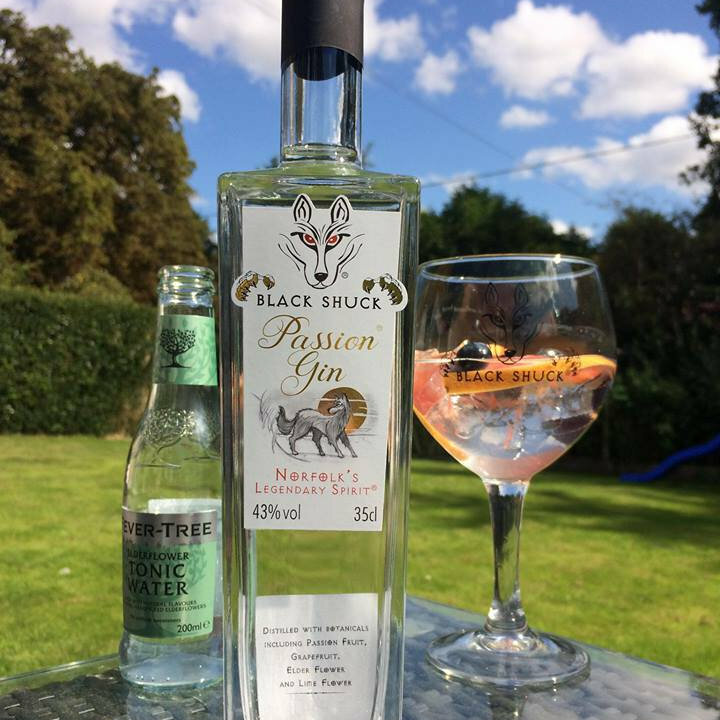 Distilled in Norfolk, St Giles is a remarkable gin of exceptional quality. 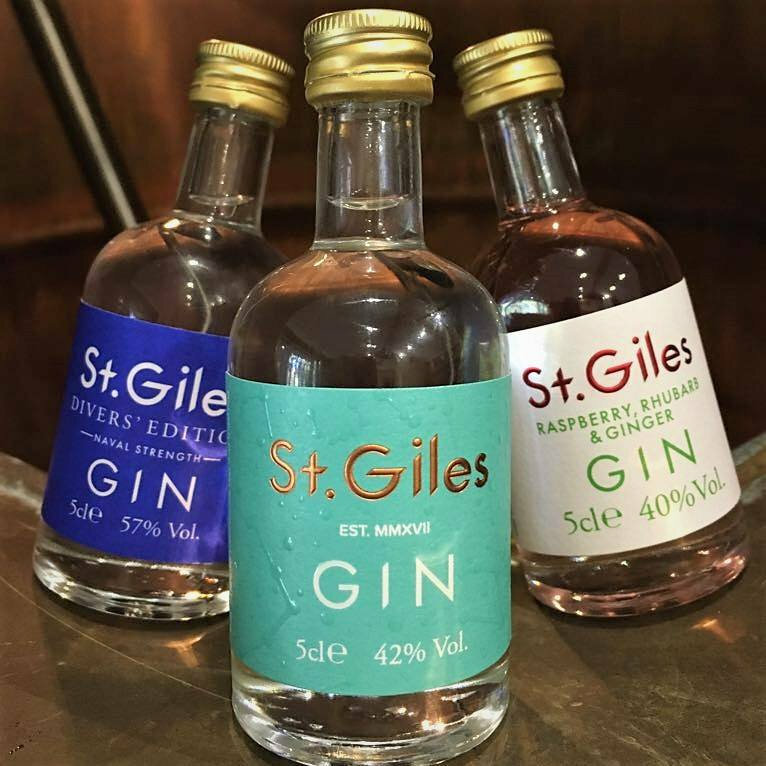 With a perfect balance of citrus, floral and spicy notes, St. Giles is exceedingly smooth, light and refreshing. 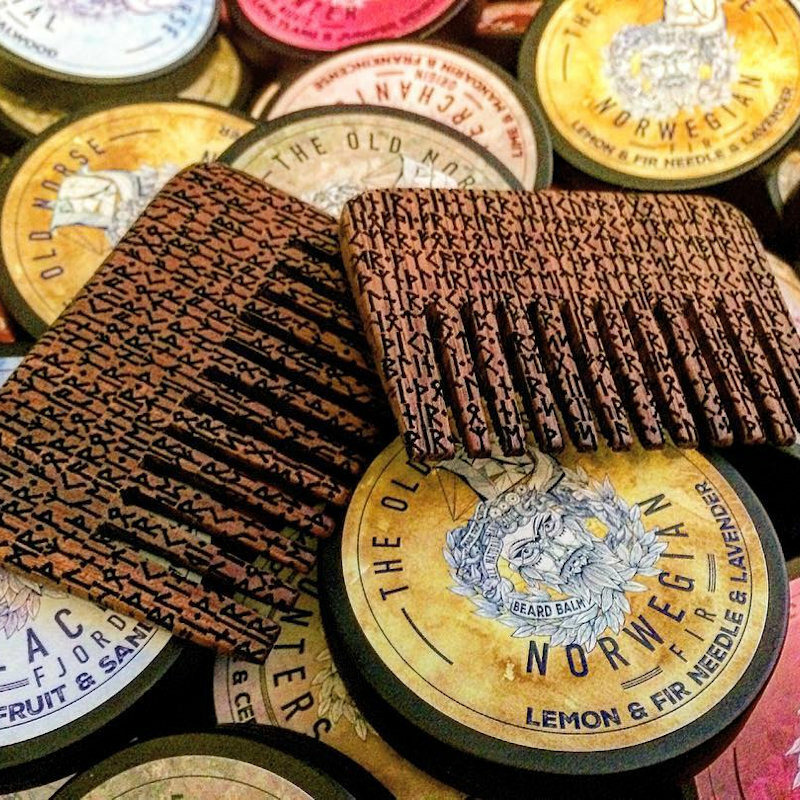 We hand produce all natural Mens grooming from the finest ingredients. Everything is made in small batches with a focus on quality, care and attention to give our customers the best results possible. 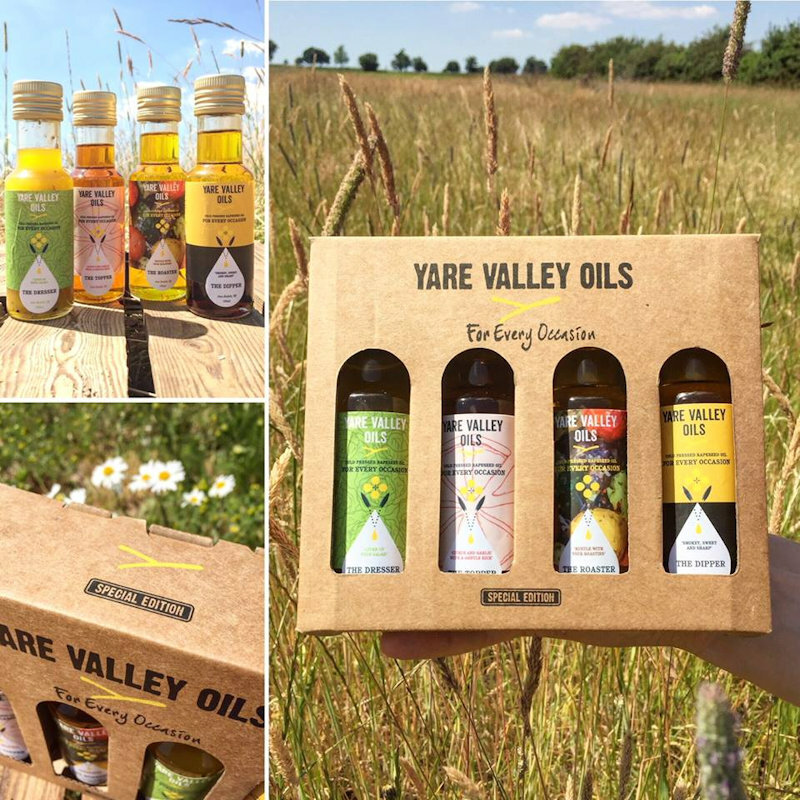 Producers of premium quality, award winning, cold-pressed rapeseed oil, infusions, dressings and balms. 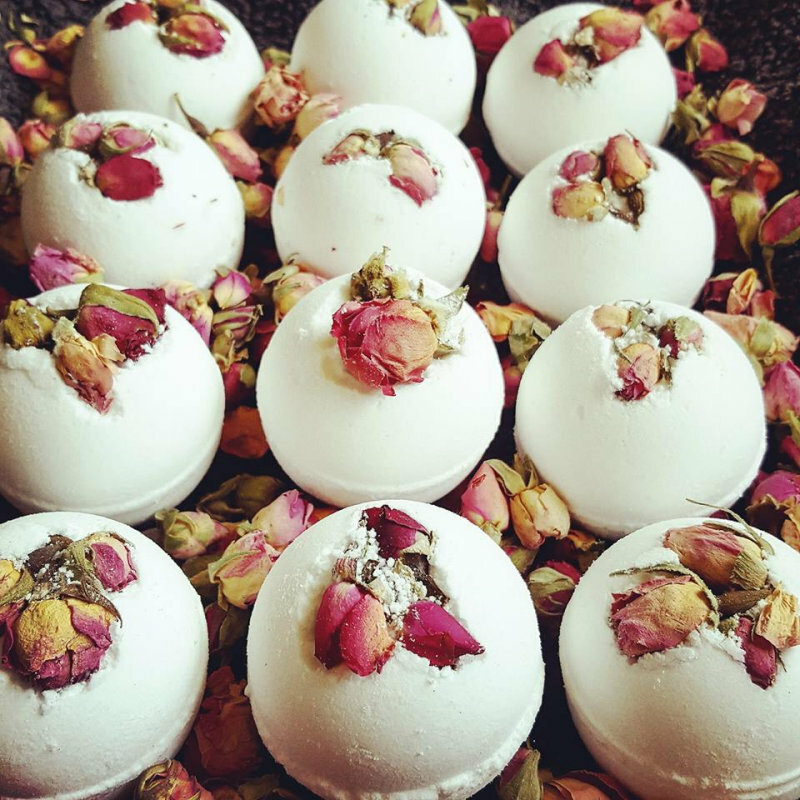 Handmade BathBombs, Body Scrubs and Bubble bars. All made using natural ingrediends to nourish skin. 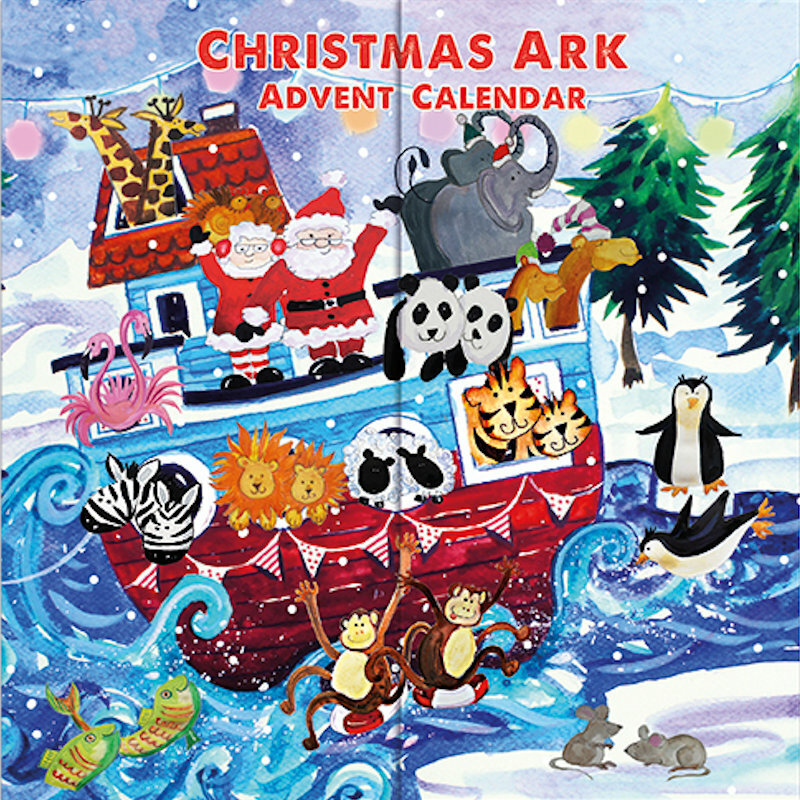 Available in gift boxes and gift bags, great Christmas stockingfillers!!! 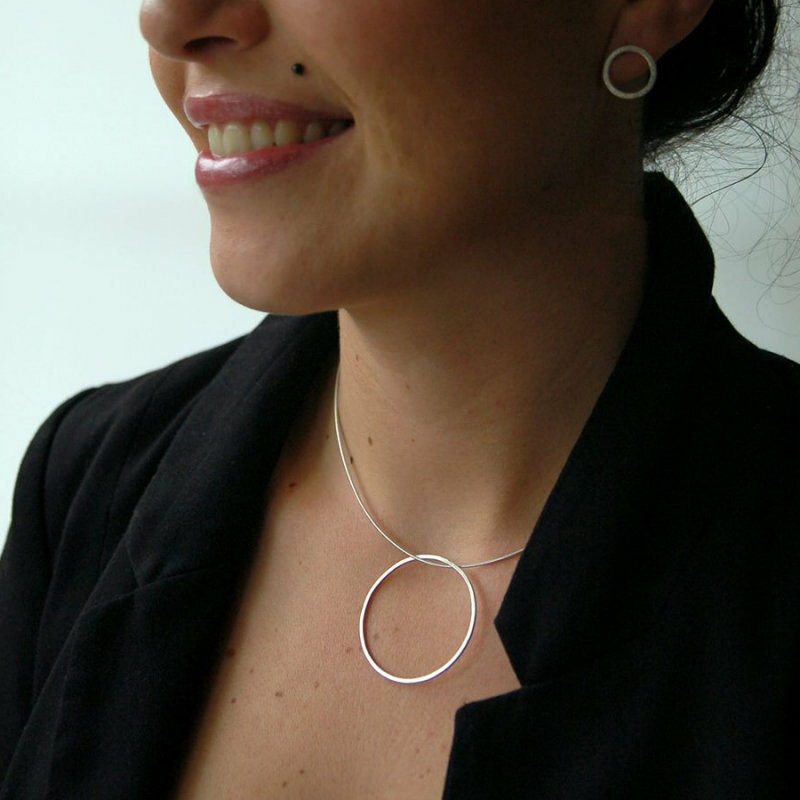 Contemporary, Simple and Organic jewellery. The beauty of simplicity. Designer silver jewellery made in Norwich using the highest quality 925 Sterling silver, natural stones and fresh-water pearls. 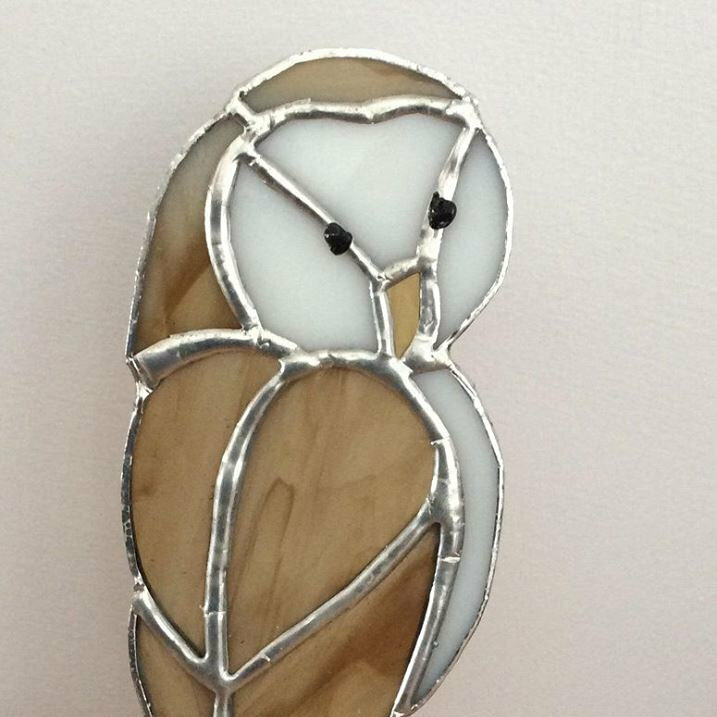 A constantly evolving and eclectic mix of coastal crafts using sea glass, shells and driftwood in unique pictures and jewellery I also make other gifts items using local maps. 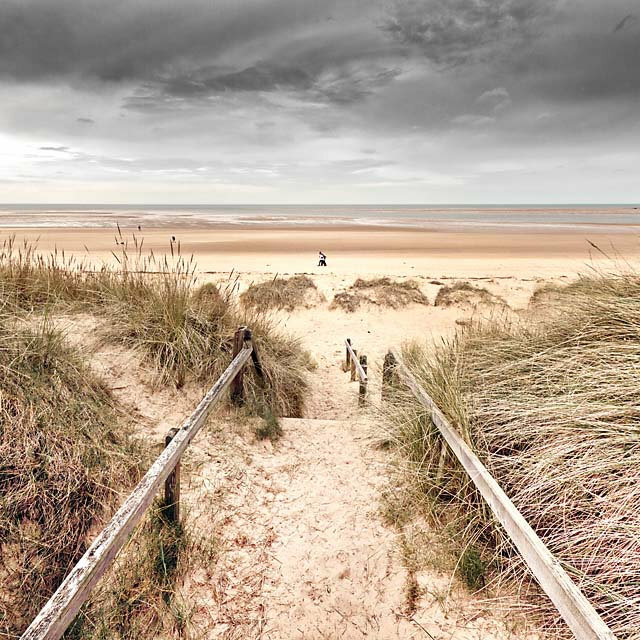 Taking inspiration from the North Norfolk coastline and countryside. 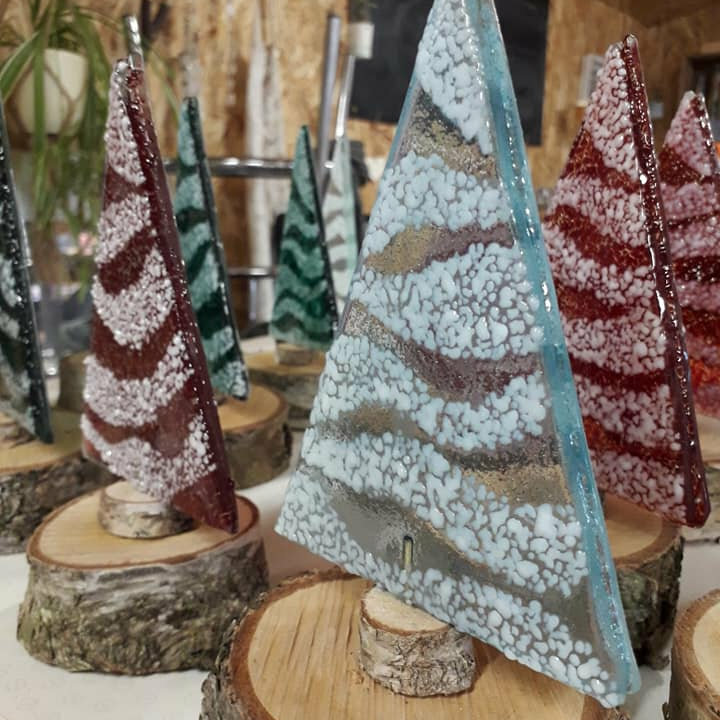 D.W.G.S use vibrant colours in their glass capturing the beauty of Norfolk, so you can take a little bit of Norfolk back home. 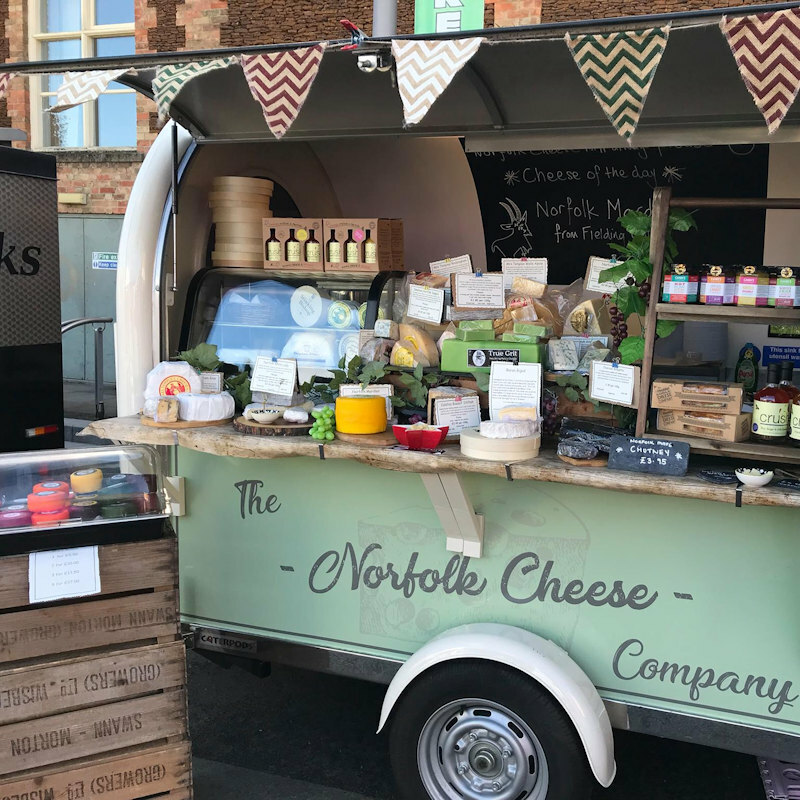 We produce handmade cheeses from Norfolk raw milk - Norfolk Tawny, Norfolk Dapple and Smoked Dapple. 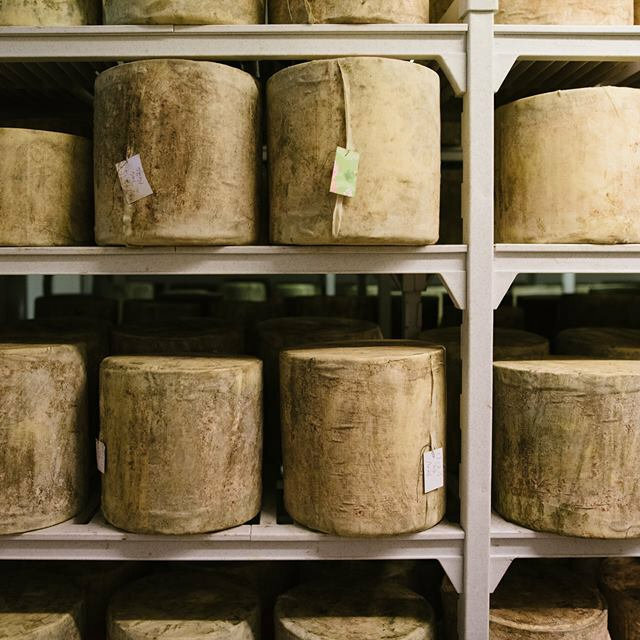 All our cheese is produced from the milk the cows of Abbey Farm in Binham. 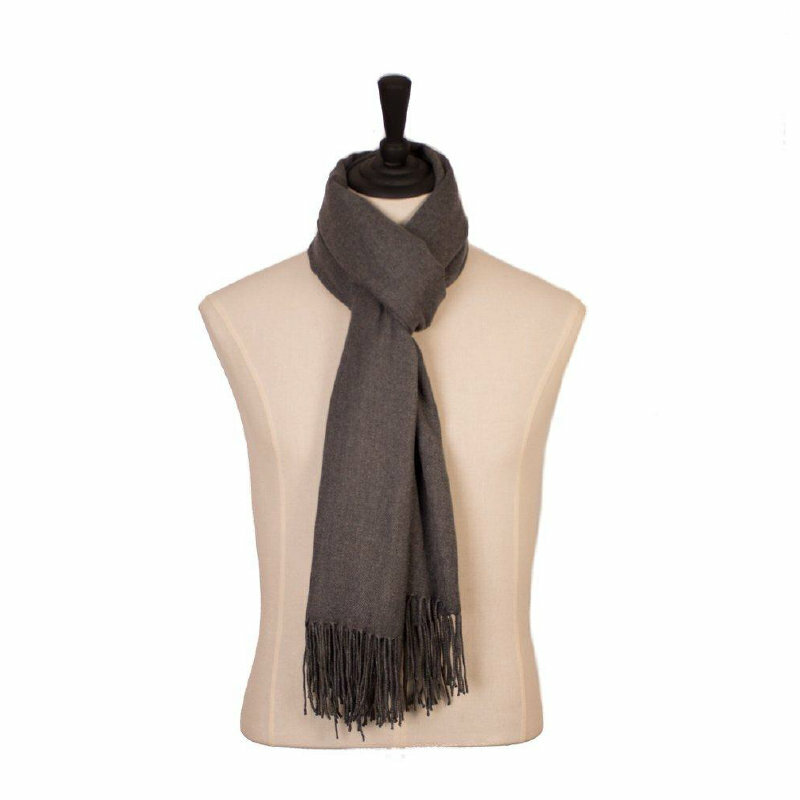 Amazing range of scarves, hats and gloves to keep the cold out and to keep you warm made from wool, and a range of non wool ones too. Silver plated antique & vintage cutlery handcrafted items for both the home and garden. I use pre-loved, ornate decorative pieces from the past to create quirky, useful and interesting gifts. 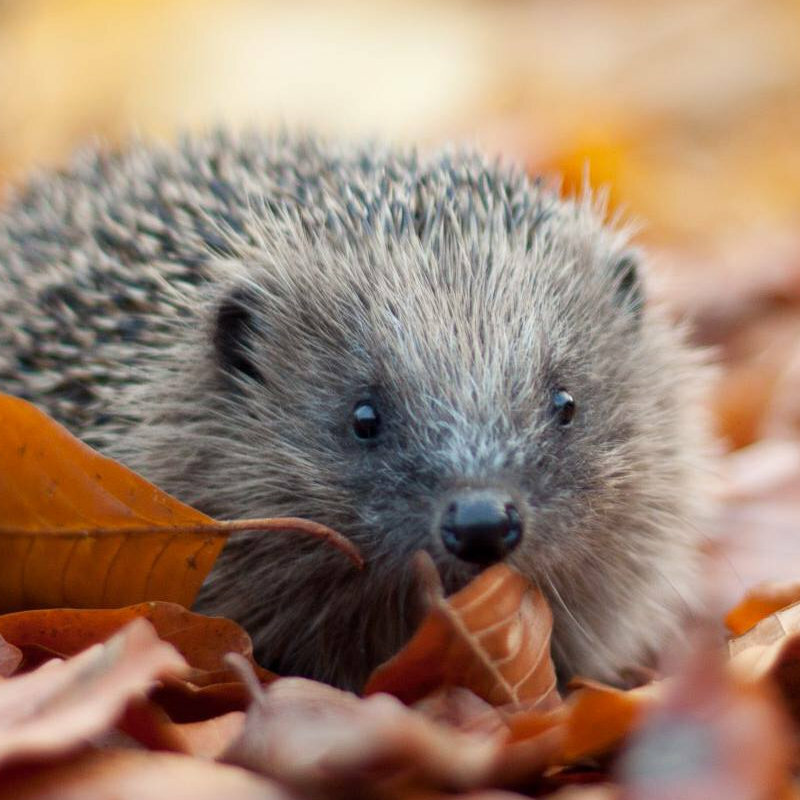 Love Country is a colourful range of heartwarming wildlife artwork, greeting cards, coasters, prints, gorgeous frames, aprons, cushions and other gifts. Each design has its own poem by the artist. 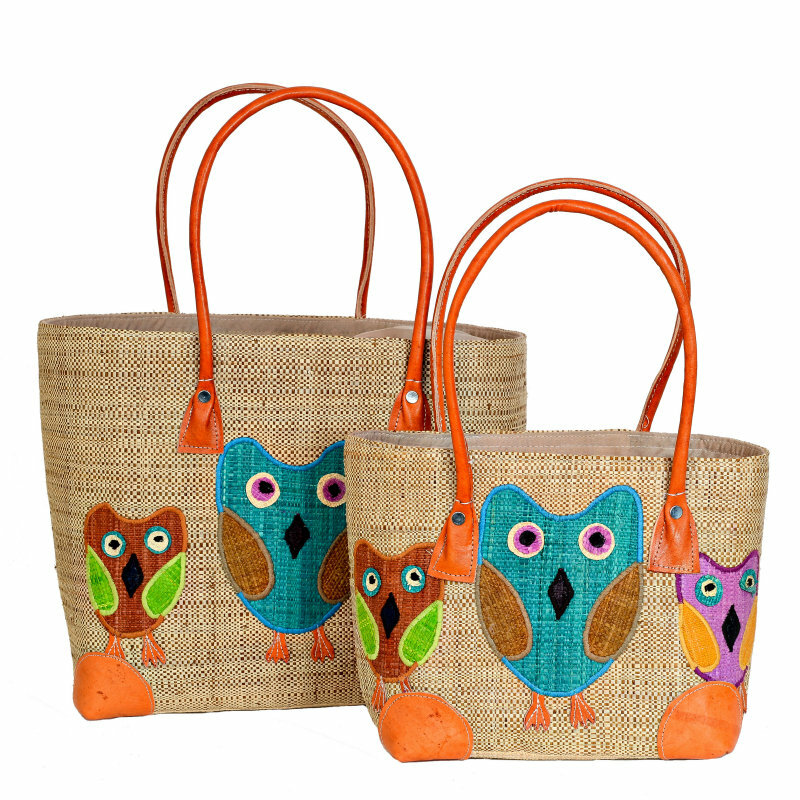 Our beautiful eye-catching bags and baskets are designed in Norfolk and handmade by talented artisans in Madagascar. 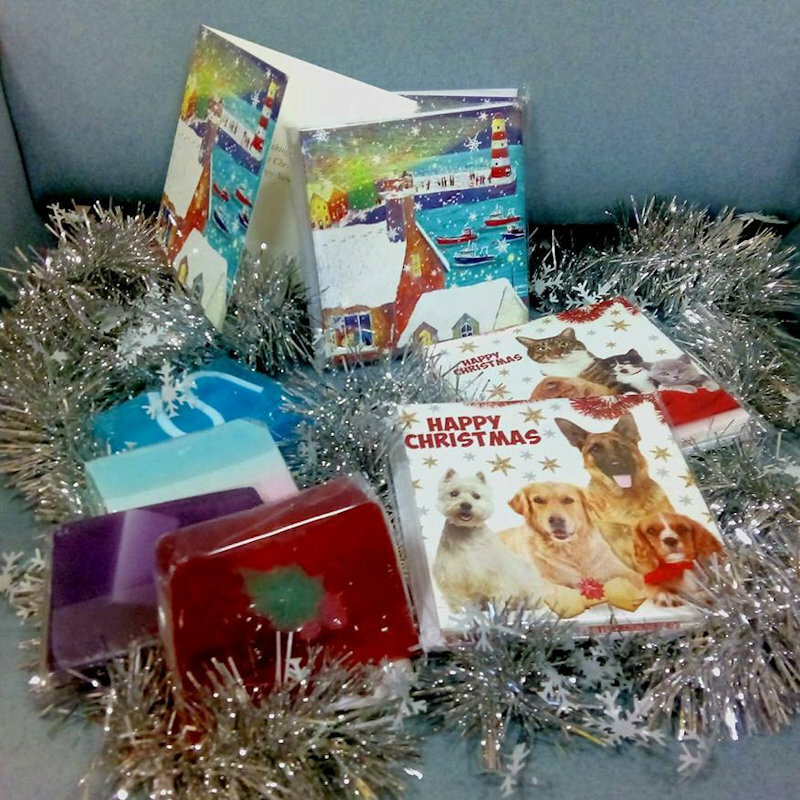 We also have a great range of wallets and purses for that perfect Christmas gift. 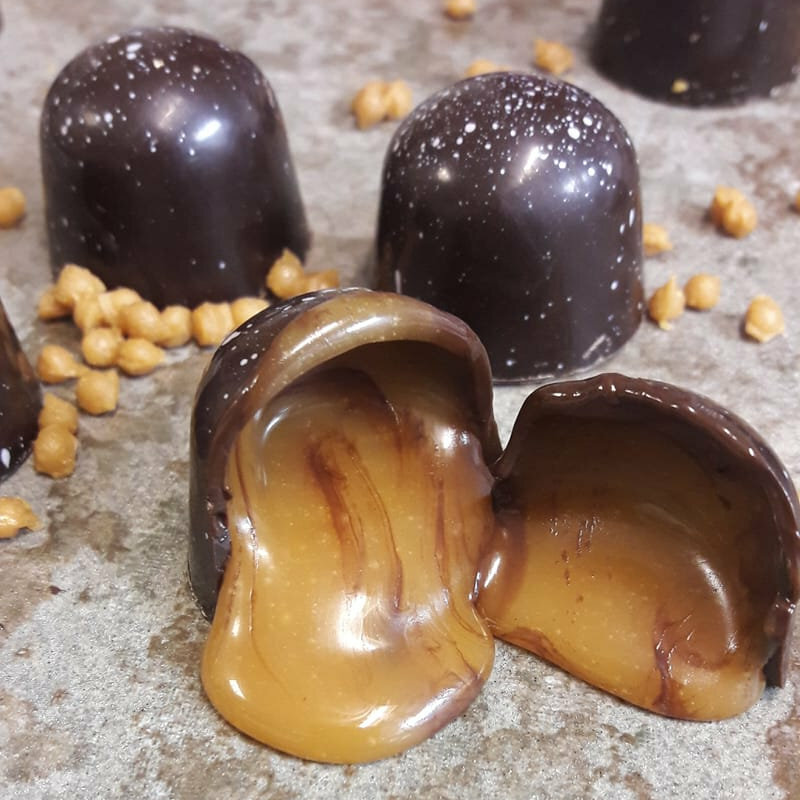 We are recognised as artisan chocolatiers as we are passionate about what we do. We make everything by hand using only quality ingredients. Watch us making our chocolates in our shop near Norwich. 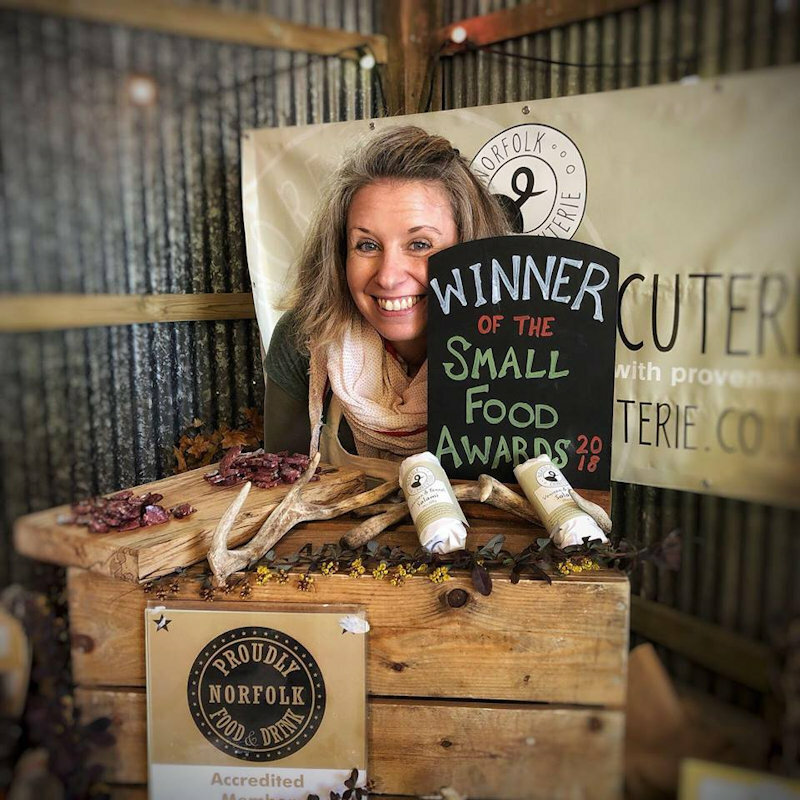 Ethically produced food from our award winning Norfolk smallholding. 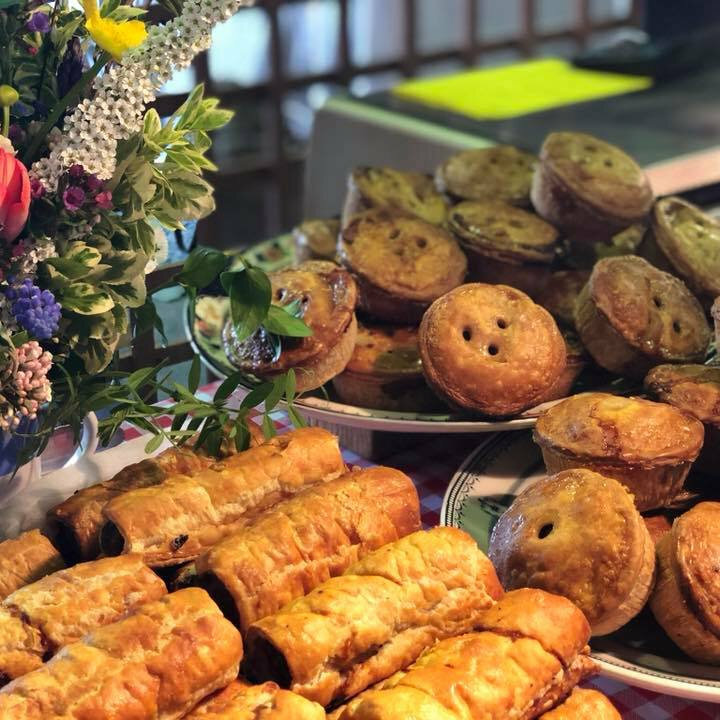 Great Taste Awards for our pork pies. All our pork is free range Gloucester Old Spot, from happy Norfolk pigs. 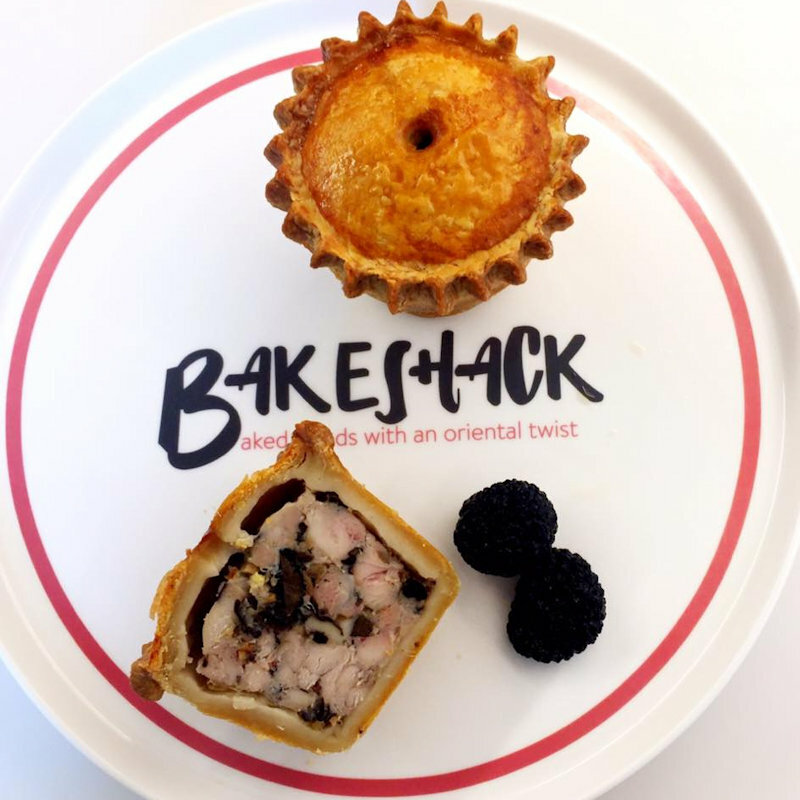 Bakeshack bakes with an oriental twist. Goosefat hot water pastry encasing aromatic duck spring onions plum sauce, chicken with chopped black truffle, pheasant goji berries Chinese bacon in port etc. 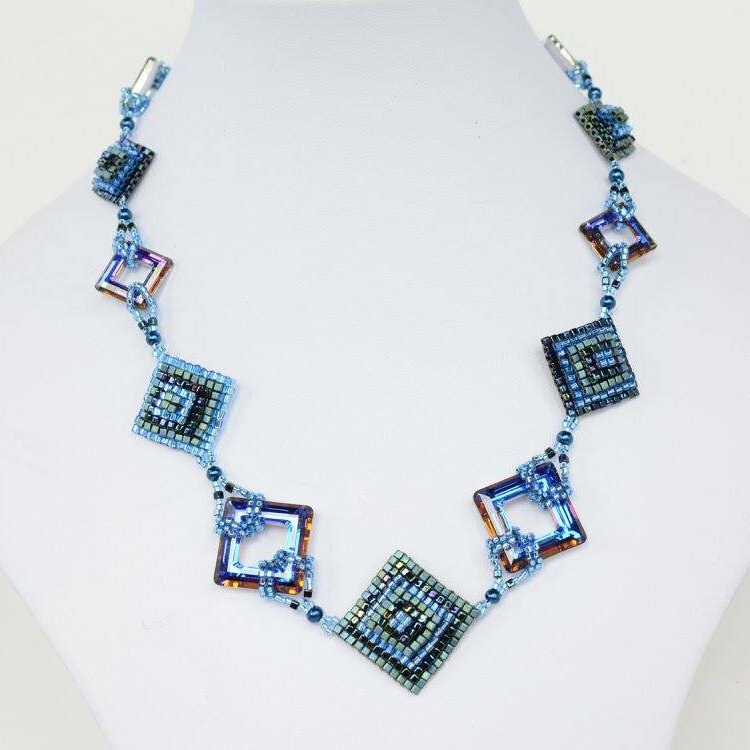 Unique Beaded Jewellery and Ornaments Designed and Made in Norfolk using Swarovski Crystals and Japanese Glass Seed Beads. Individual commissions undertaken. 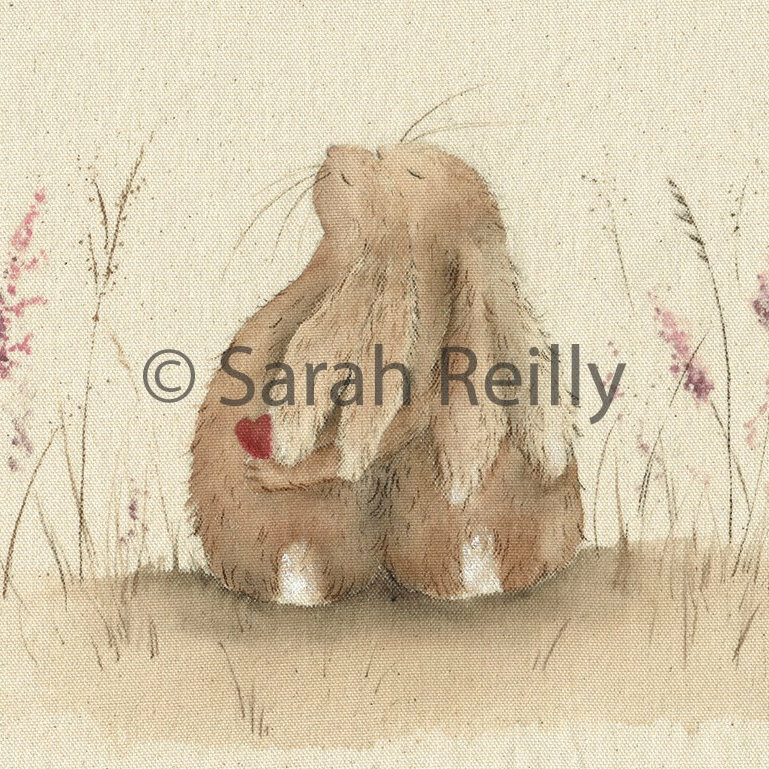 Foodie watercolour illustrations, beautifully reproduced on cards, prints, aprons, tea towels and more! Original, pure British knitwear. Exclusively grown and manufactured in England, from British wool. Jerseys, hats, gloves and scarves. Also beautiful wool fat soap. Bringing you Christmas in the unique BTOI style. 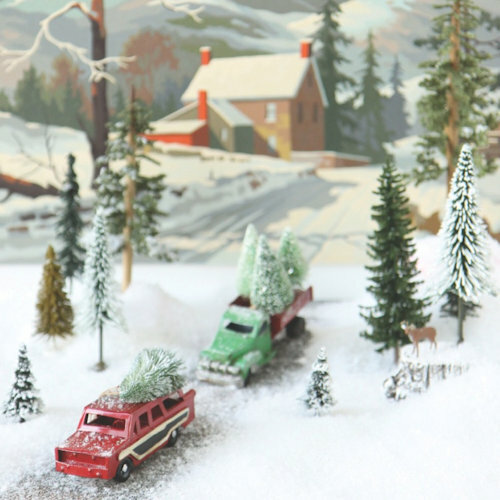 You will find a range of decorations and gifts inspired by the great outdoors. 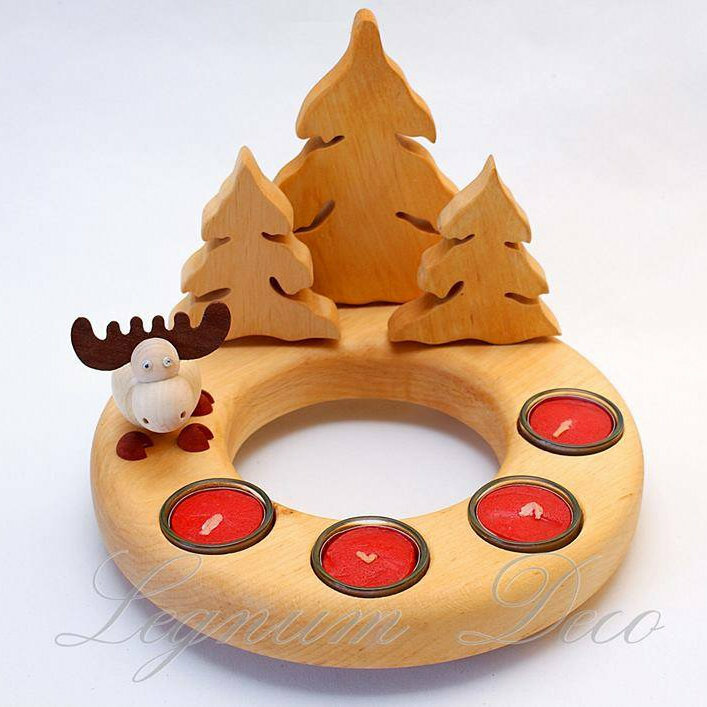 Handmade wooden toys,games and puzzles including the unique family trees and memory boxes. 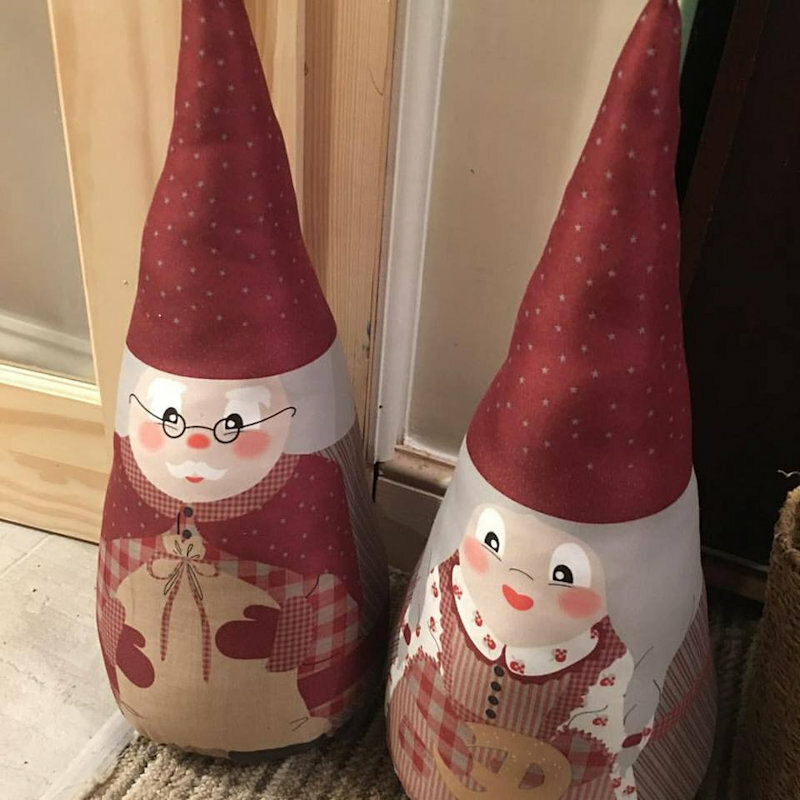 My customers like the individual and unique nature of my handmade products. 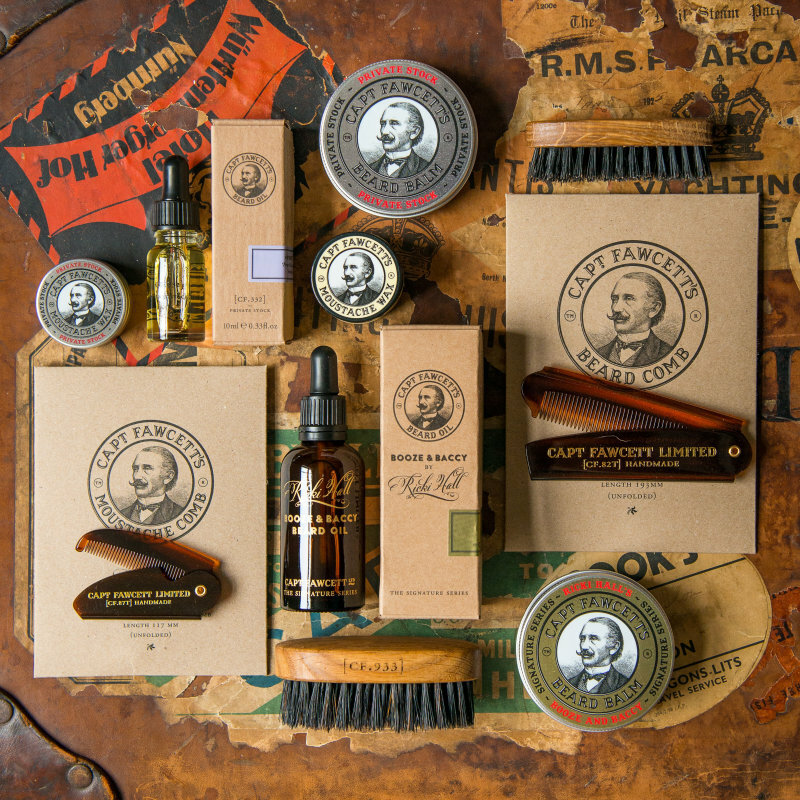 Captain Fawcett’s Emporium, home to a simply delectable range of First Class Gentleman’s Grooming Requisites. Bird Baths, Belly Pot Tables, Giant Jugs. 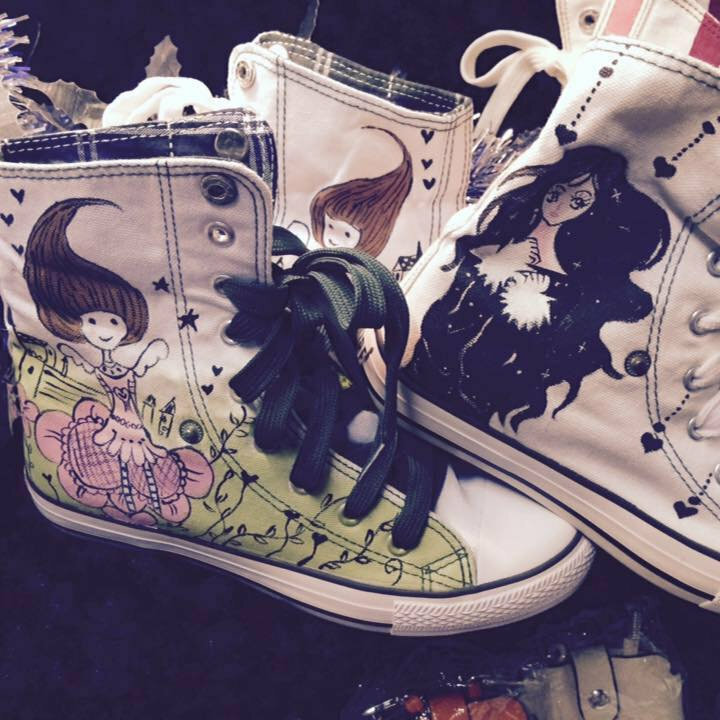 All handmade and totally individual. 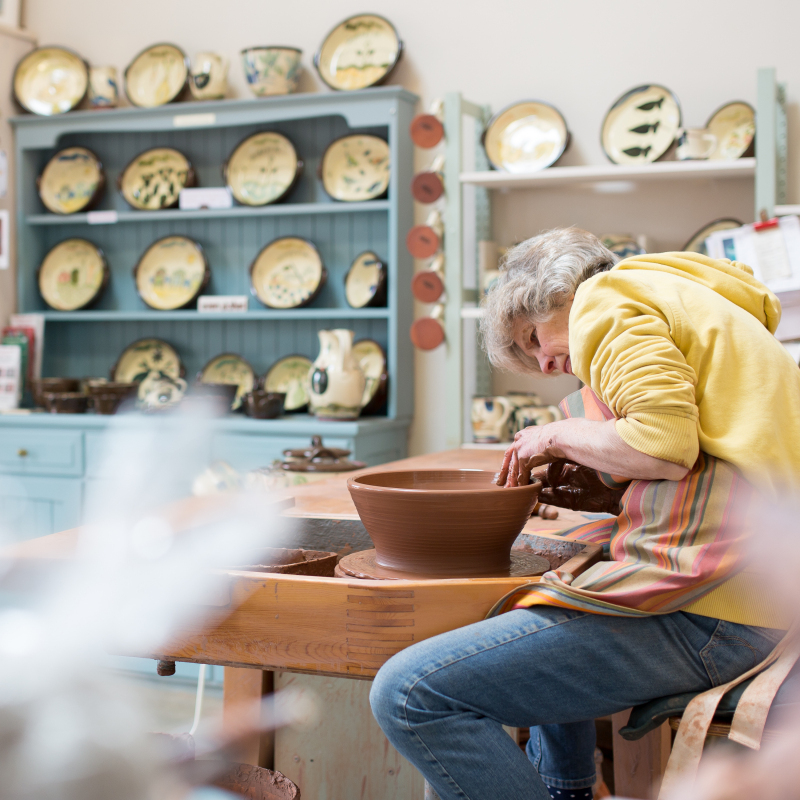 Also, practical, decorated hand made bowls, plates, pots and jugs. DB Craft Creations handcraft unique beautiful pieces of jewellery upcycled from very old or antique solid silver cutlery some are over 200 years old. All handcrafted locally in Kings Lynn. 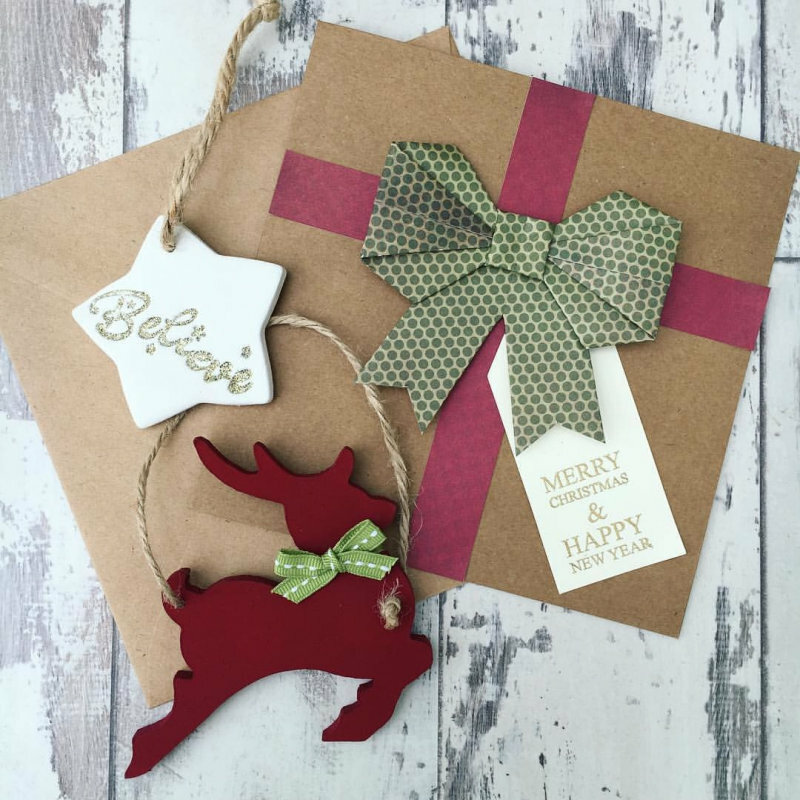 Handmade wire and wood Signage and personalised Christmas Decorations. As always, we will be personalising pieces in our modern calligraphy style on the day for you to take away! 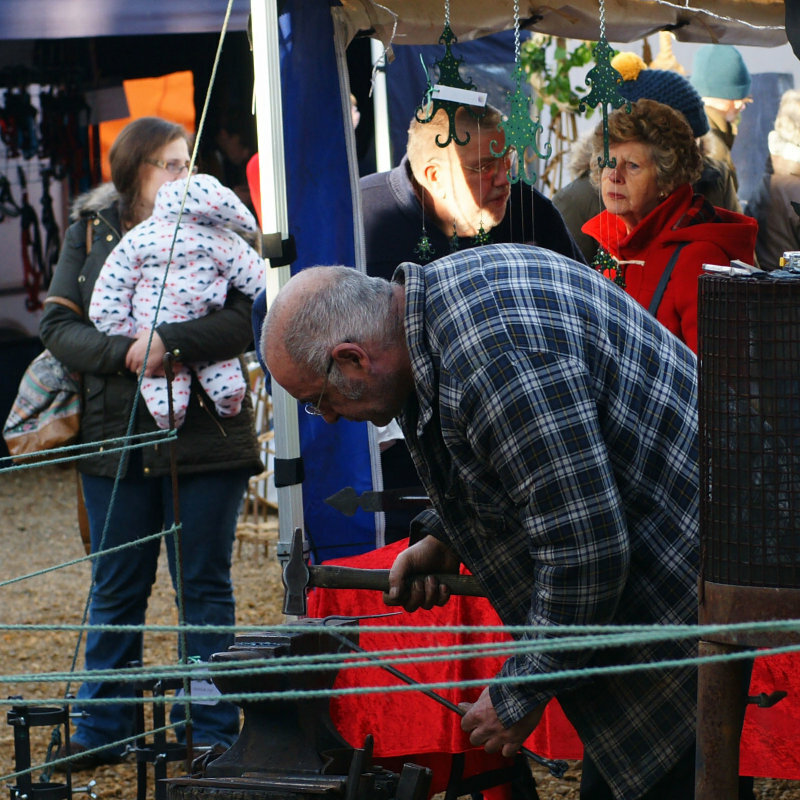 We are Artist Blacksmiths working in the forge on the Holkham Estate. We create small pieces for fairs, undertake commissions, restorations and strive to show the beautiful possibilities of steel. 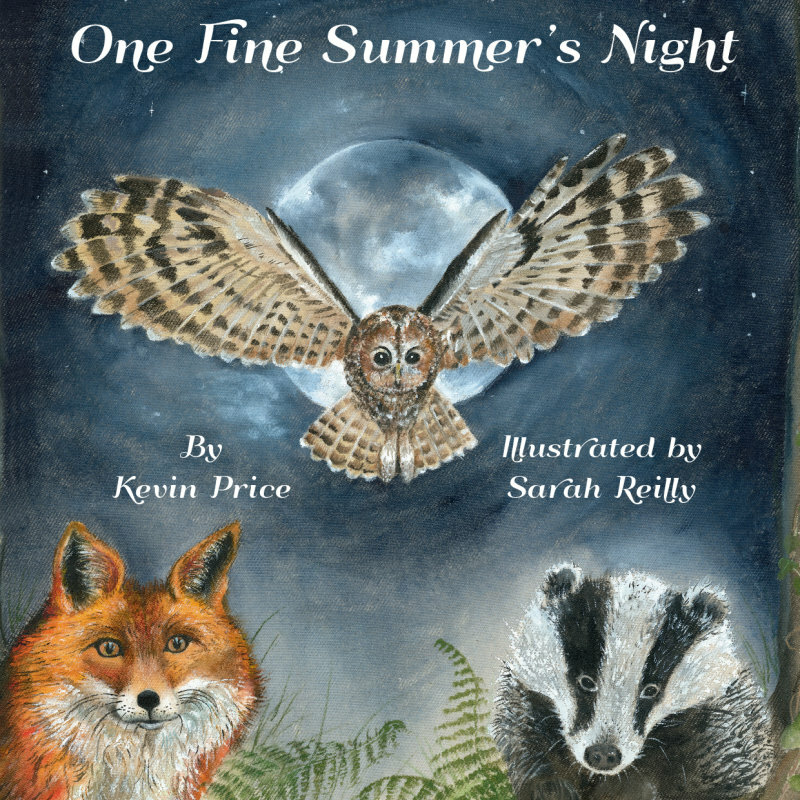 KAMA Publishing is a small children’s book publisher based in Norwich and the home of children’s author Kevin Price. 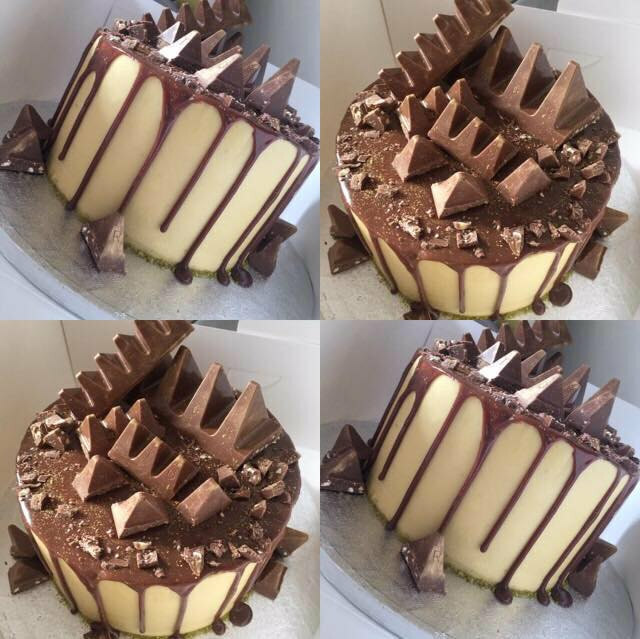 A Norfolk based cake business specialising in handcrafted products using high quality ingredients. An enticing range of cakes, biscuits, cheese straws and popular slices. 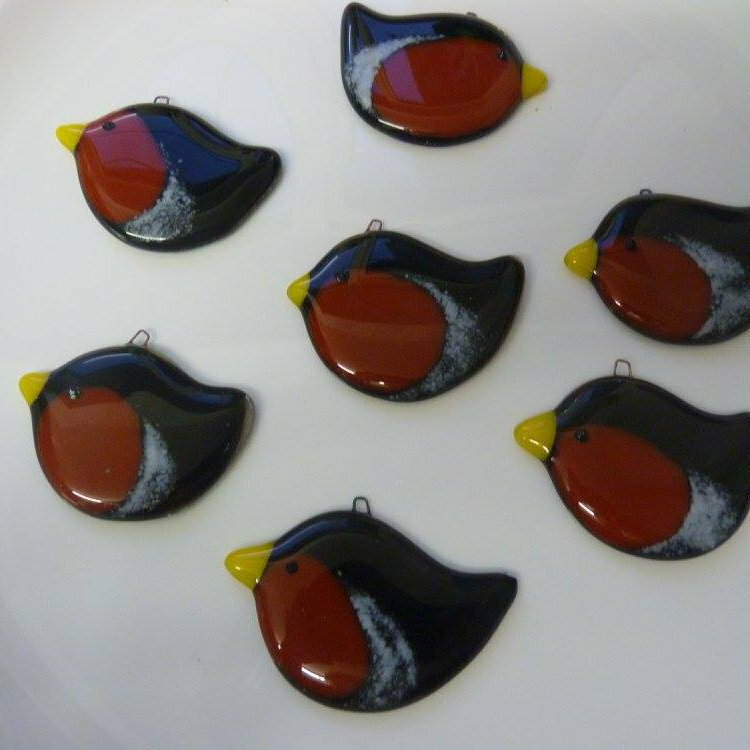 Original handmade fused glass gifts at reasonable prices. 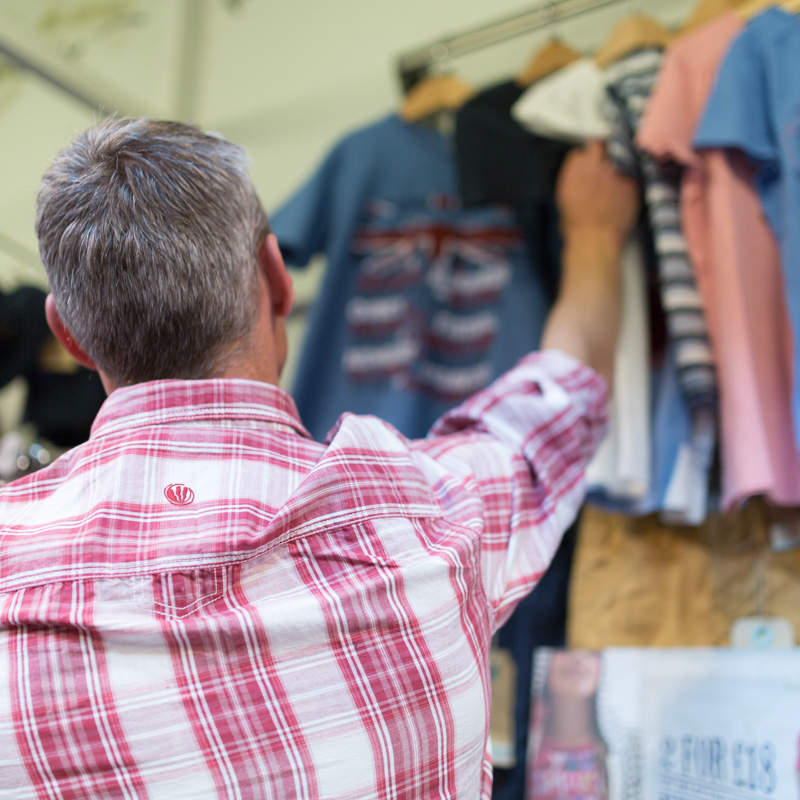 All items are made to a high standard and not available on the high street. Inspired by the landscape and colours of Norfolk. 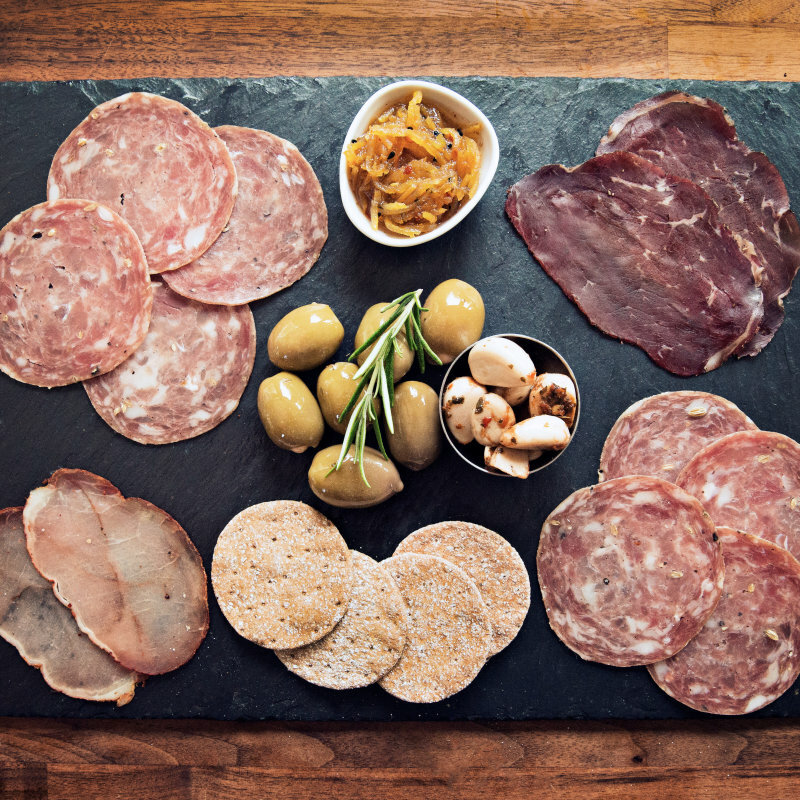 Free range & rare breed, handmade, salami, chorizo, air dried meats & beef jerky. Other than our Jerky all of our products are wheat, gluten and lactose free. 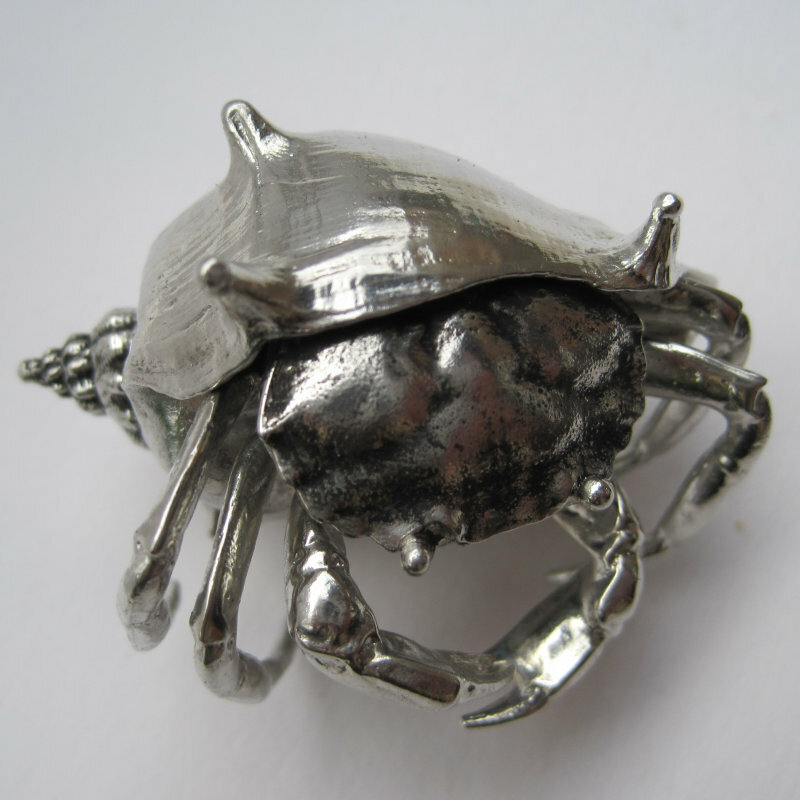 I am a jewellery designer and maker based on the North Norfolk coast. 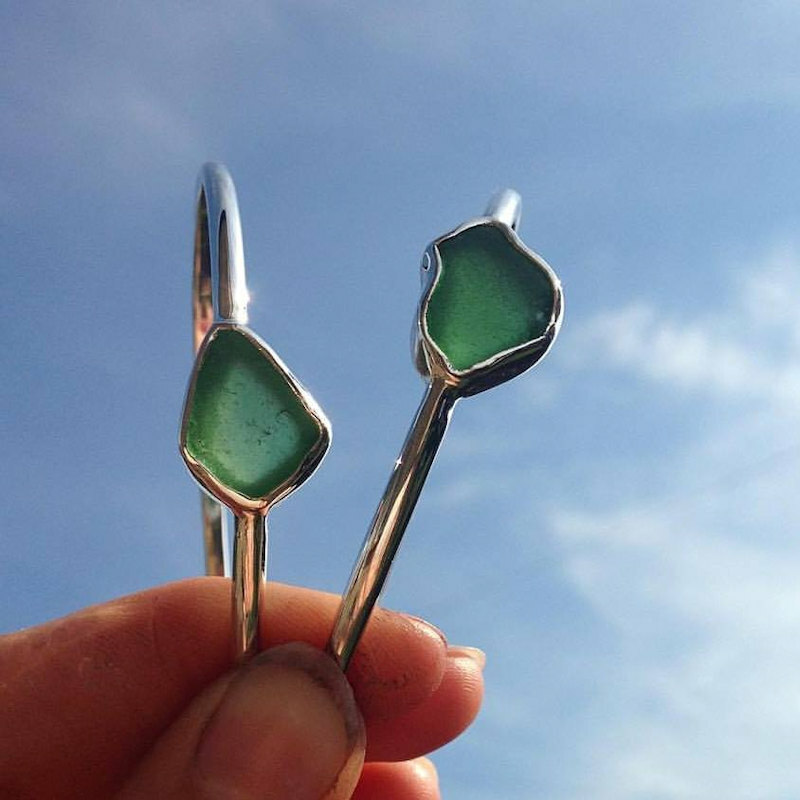 I create one of a kind sterling silver and sea glass jewellery inspired by beach combing gems. 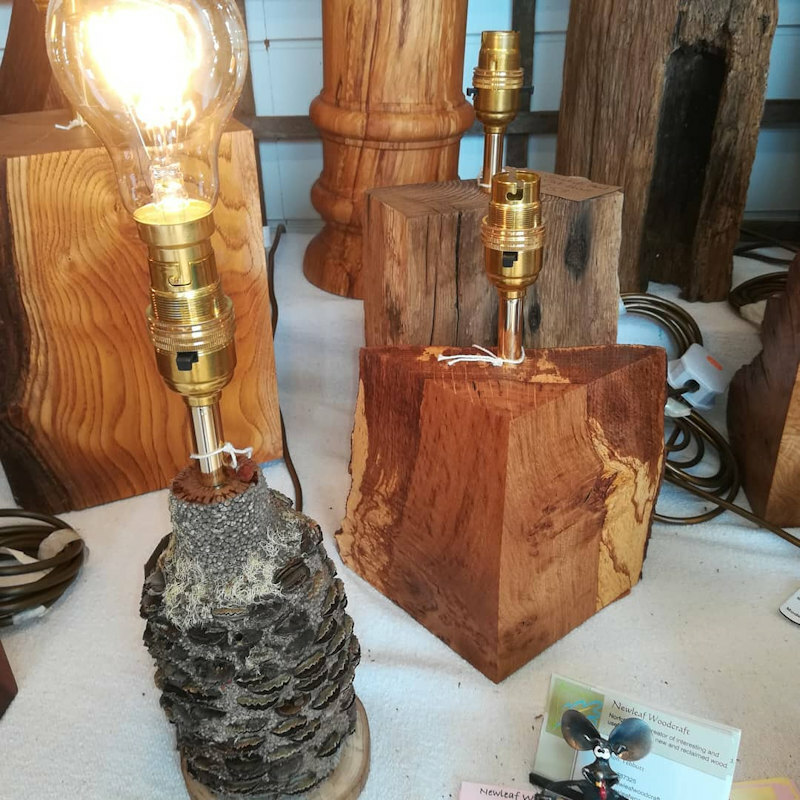 Norfolk based creator of unique wooden items for the home and garden. 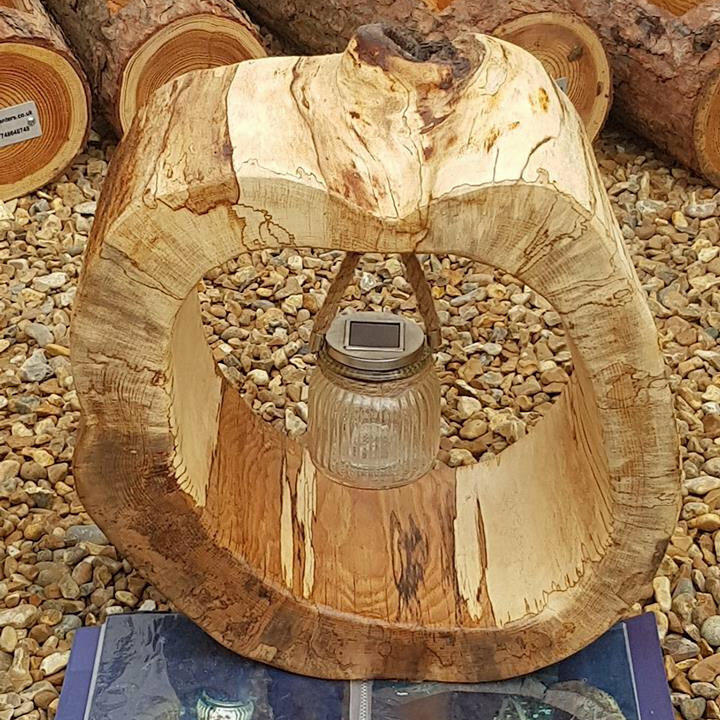 From table lamps to tea light holders, via framed mirrors, door stops & plant labels, all hand made from reclaimed and new woods. 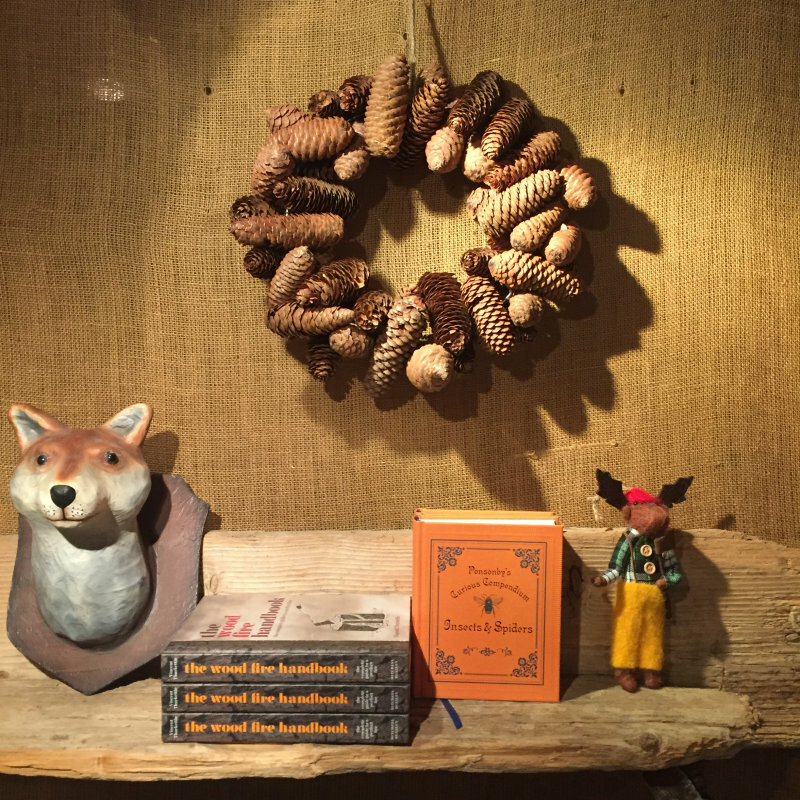 A selection of products from the Nomad’s travels including decorations from Denmark, America and Estonia. 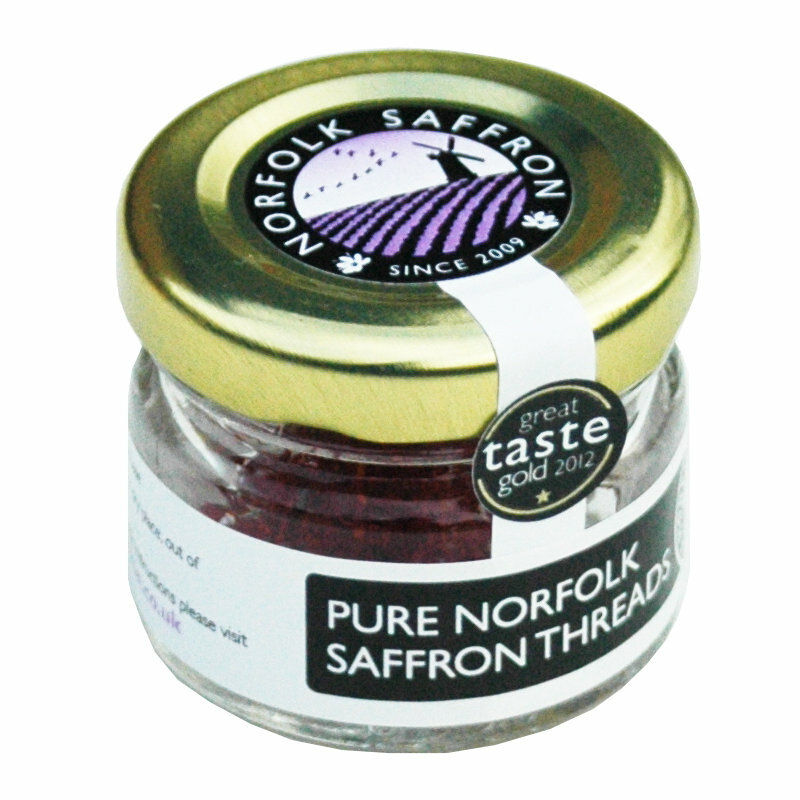 Norfolk’s only saffron-growers, featured on Radio 4’s Food Programme. 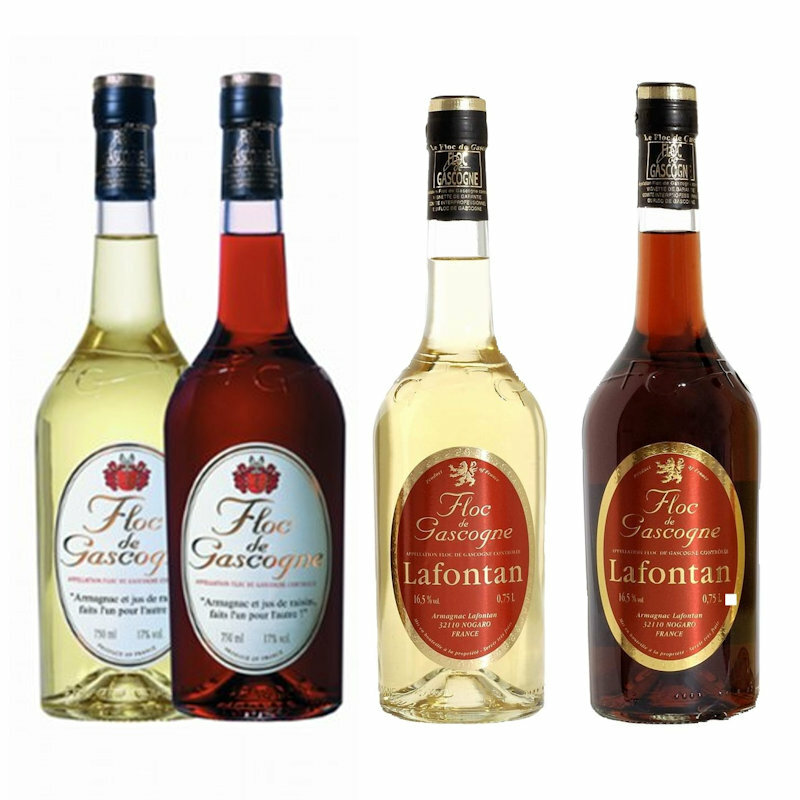 We produce award-winning, world-class saffron, & unique products: smoked saffron, a liqueur, a flavoured vodka & saffron flour. 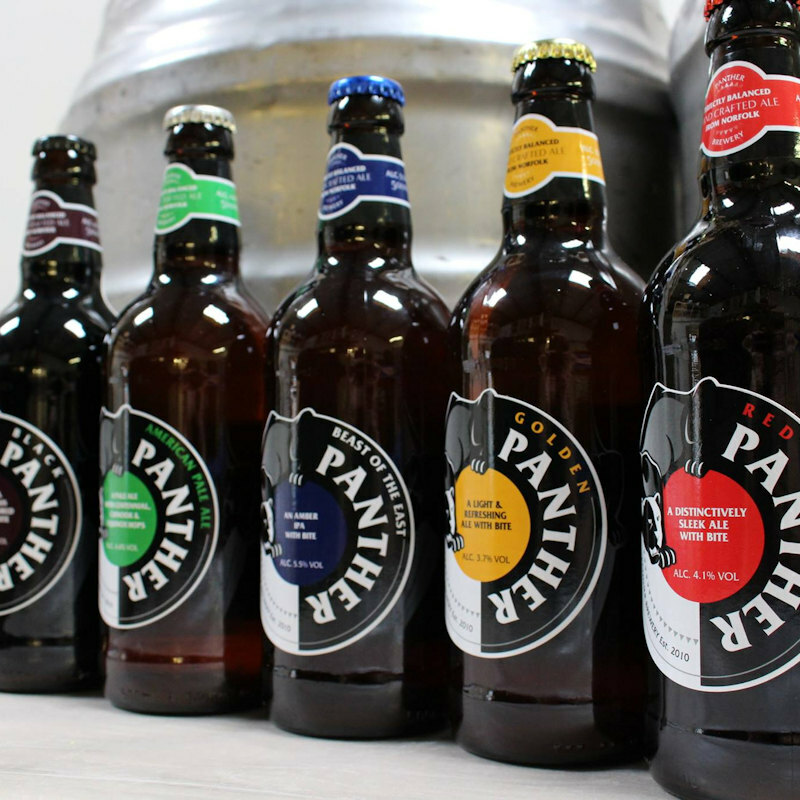 A fine selection of bottle-conditioned real ales all brewed in our award winning North Norfolk micro brewery. Smart presentation boxes with your own choice of bottles make an ideal Christmas gift. 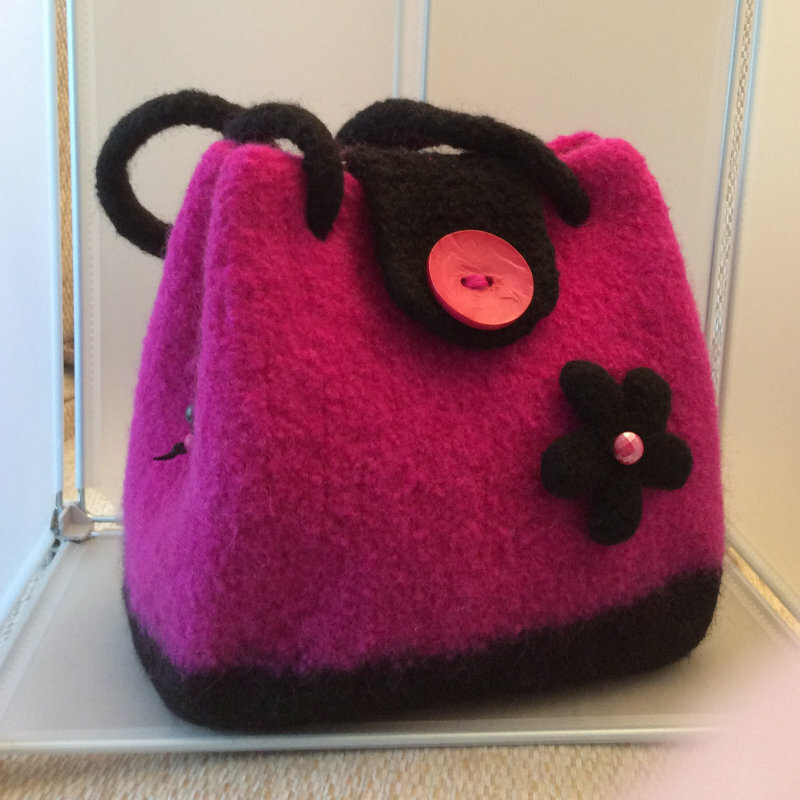 Quality handmade textiles including felted handbags designed and made by Polly, as well as hand knitted socks and hand crochet scarves. 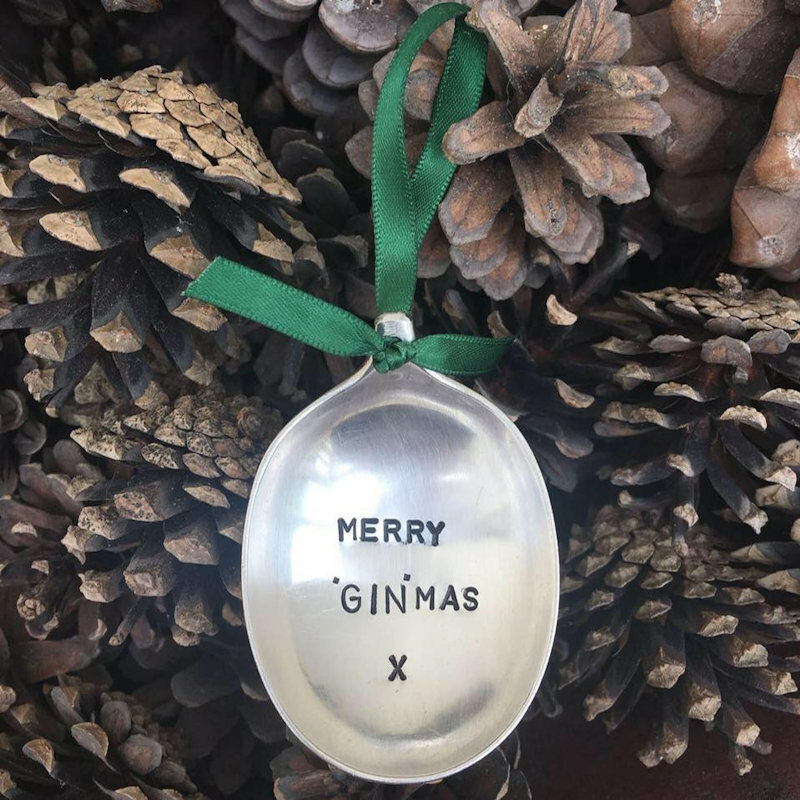 Based in Norfolk, a pop up gift shop with a lovely range of Traditional, Nordic and Rustic Christmas decorations, and beautiful accessories for you and your home. 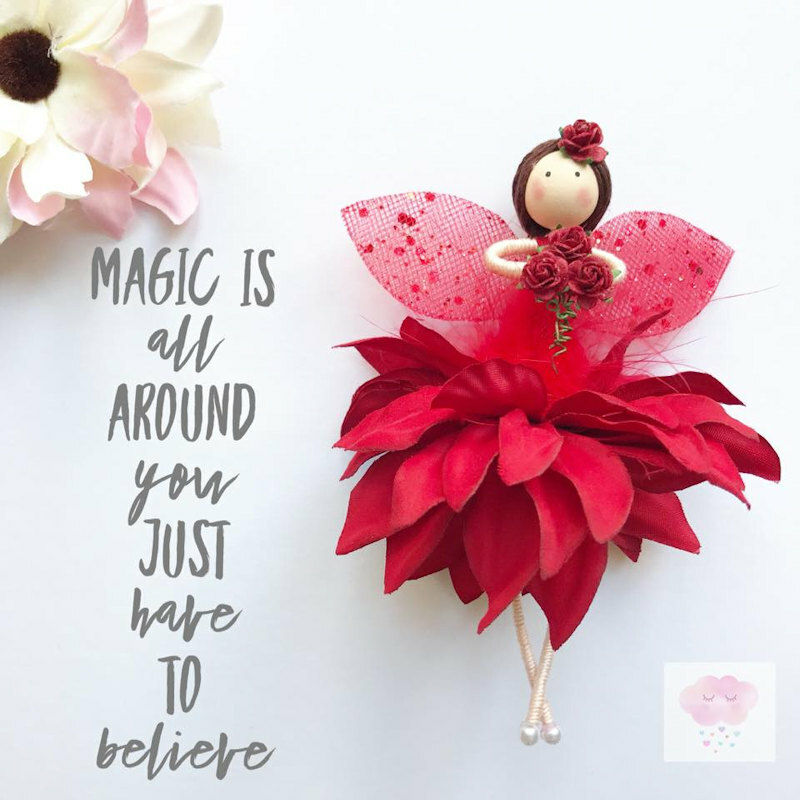 Raindrop Crafts is a handmade craft business that makes unique magical gifts including, fairies, angels, pom pom creations, peg dolls and craft kits. 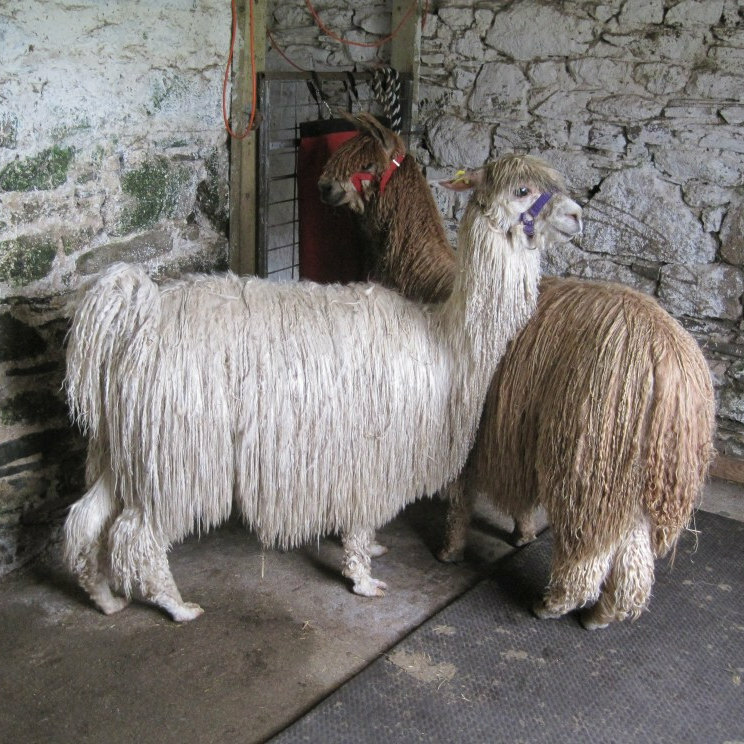 Alpaca fibre is soft & warm. The hand knitted mitts hats scarves & toys from this herd are unique,mostly in natural colours. Also yarn, finger puppets, sweaters and waistcoats, all good value. 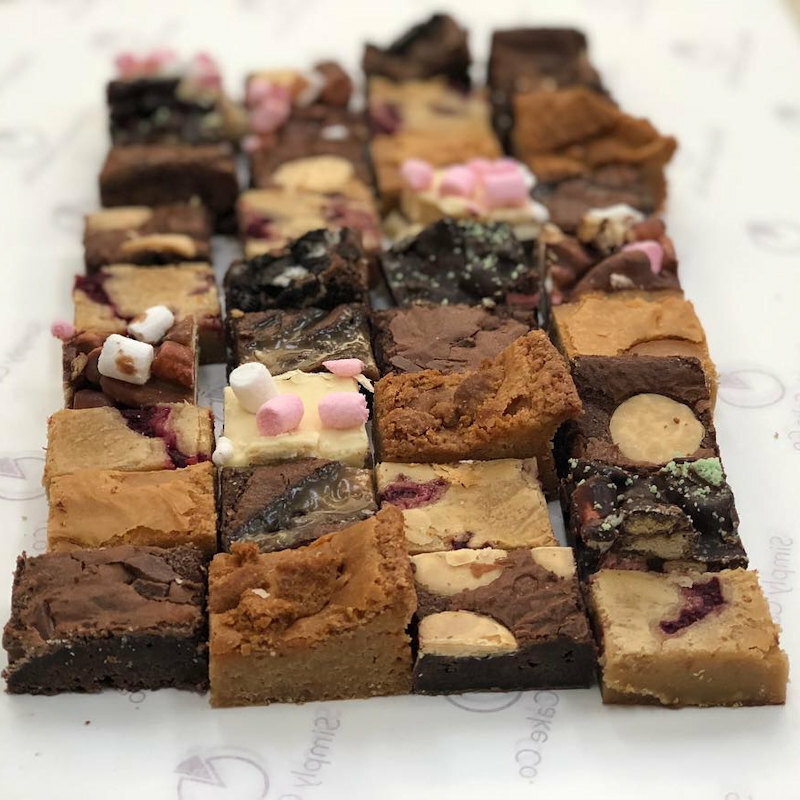 Luxury brownies and cakes, handmade in Norfolk, made with top quality Belgian chocolate, real butter and free range eggs. 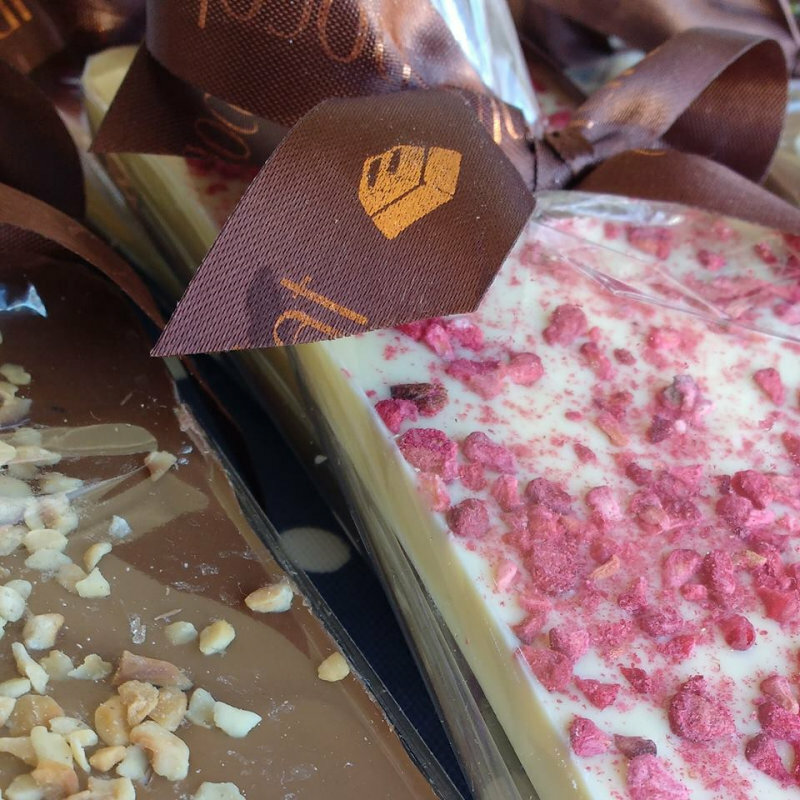 Artisan Chocolate and confectionery, all handmade in Norfolk. 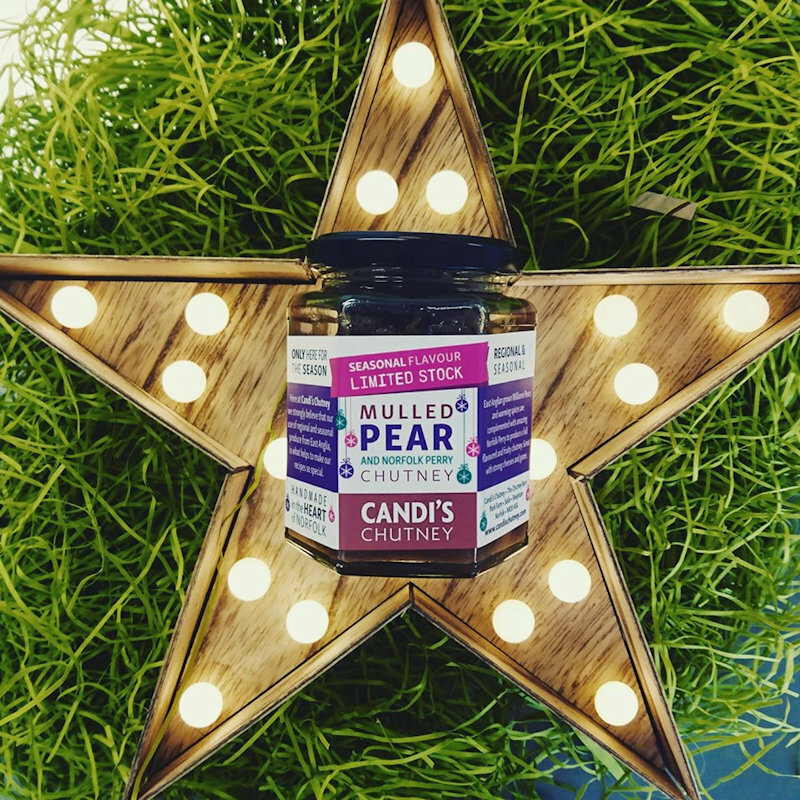 Delicious and unique edible Christmas gifts and stocking fillers. 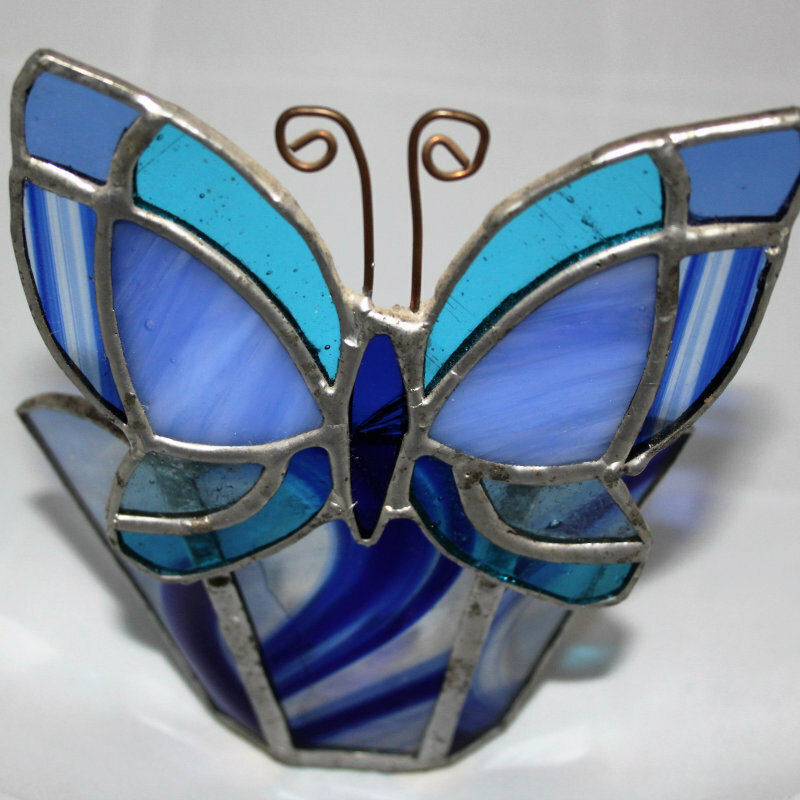 Wide range of stunning stained glass, From sun catchers, animals, lamps and christmas decorations. We are very appealing to new and also returning customers that have visited us for the past 2 years. Unique selection of twinkling light-up spirit bottles. 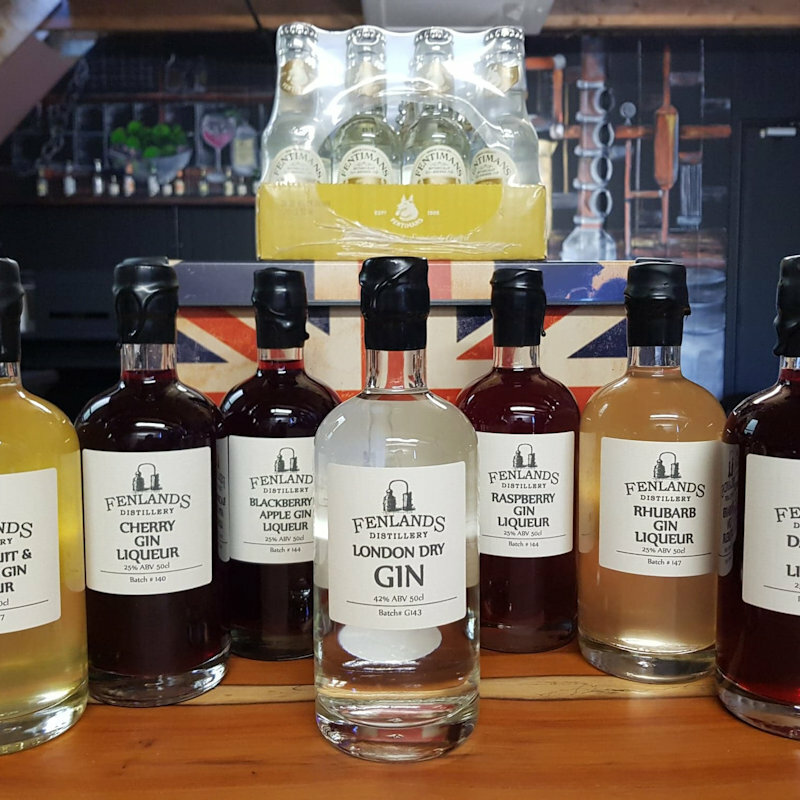 We have a wide variety of upcycled bottles including limited edition spirits. 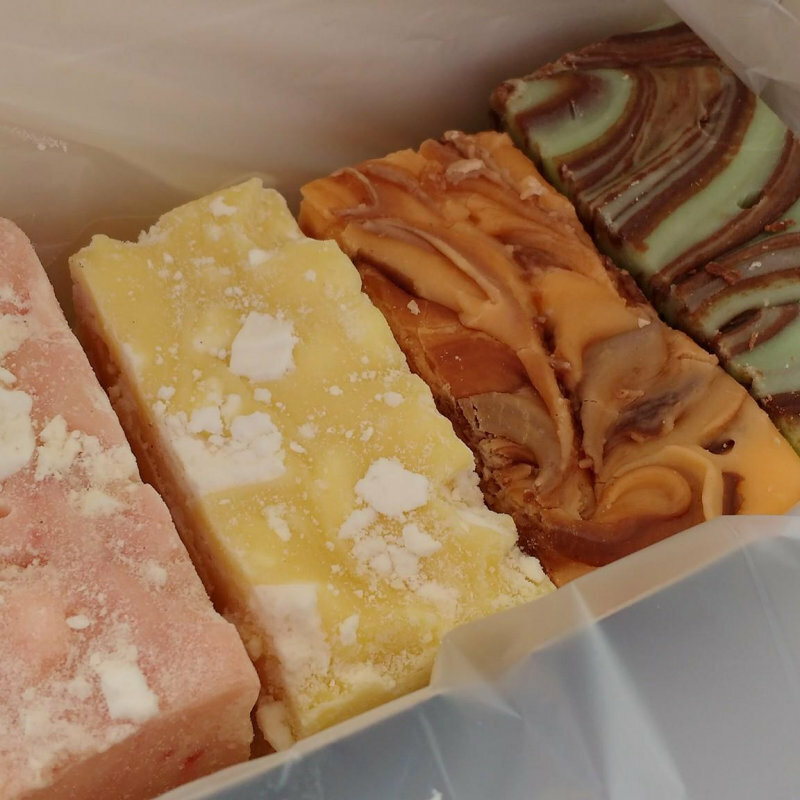 Delicious fudge, made by us in our little Norfolk kitchen. 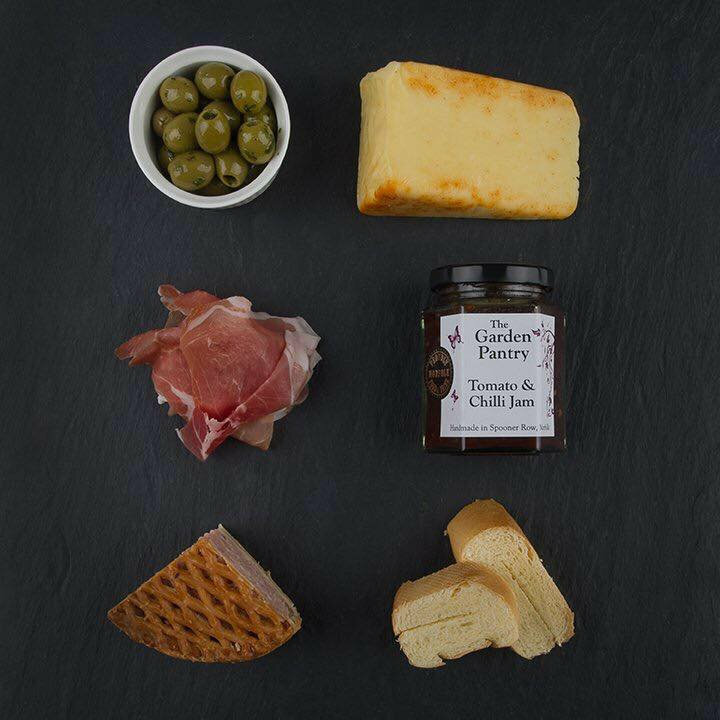 Traditional flavours, and more unique seasonal flavours available in gift boxes and hampers. 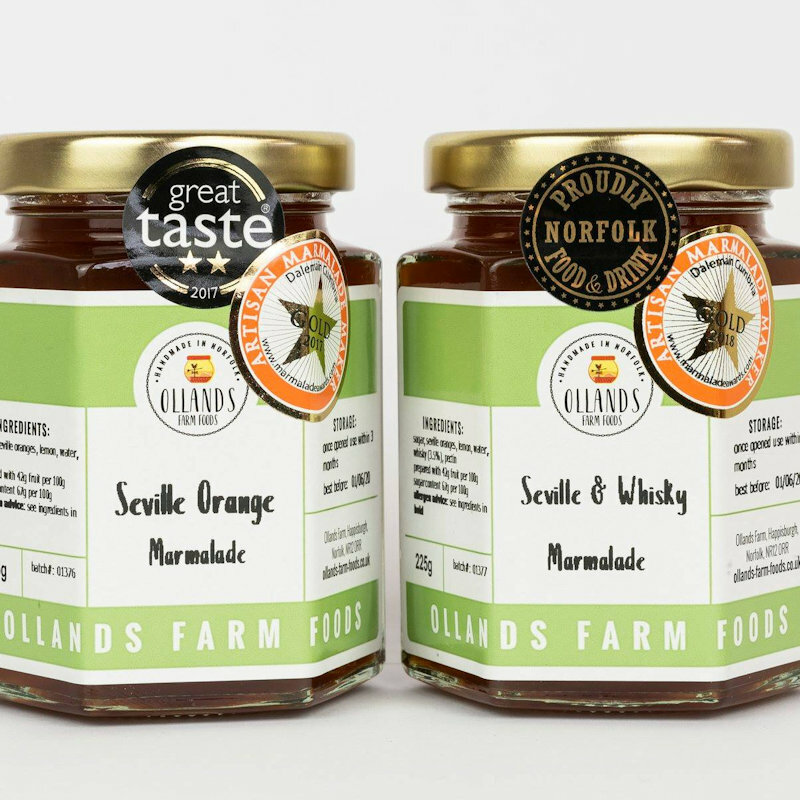 Multi award winning artisan jams, chutneys, sauces and marmalades. 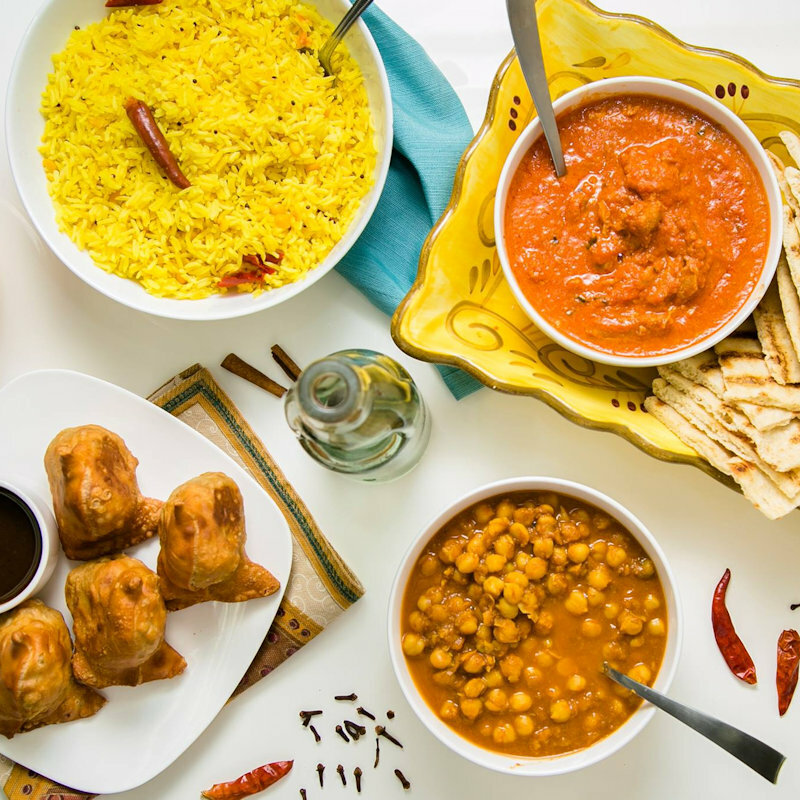 All our products are made by hand in small batches using homegrown and local ingredients. 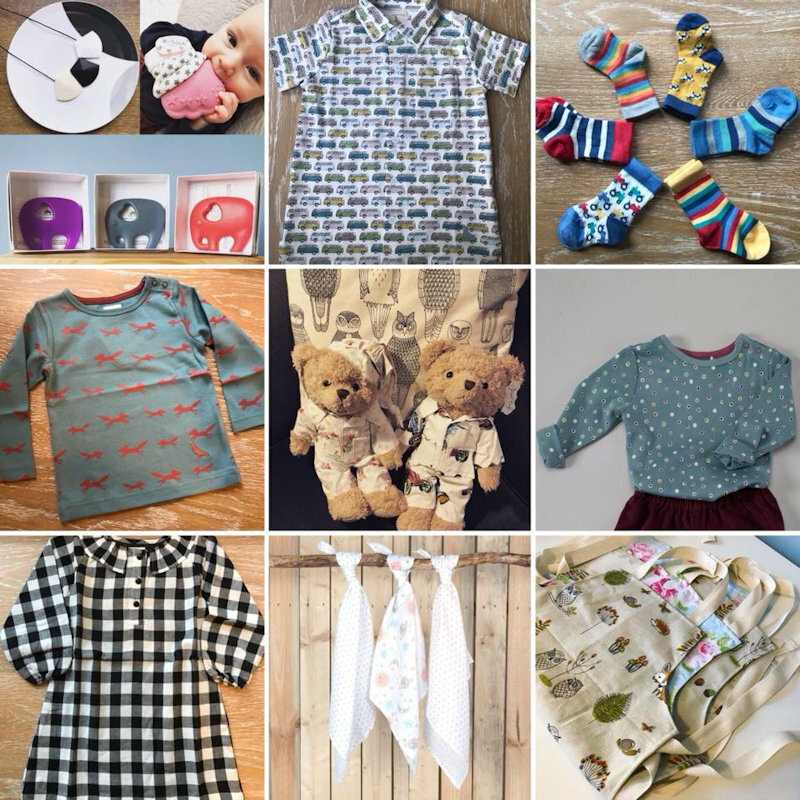 The Little Owl’s Nest is a children’s clothing boutique with a growing collection of unique British based brands. 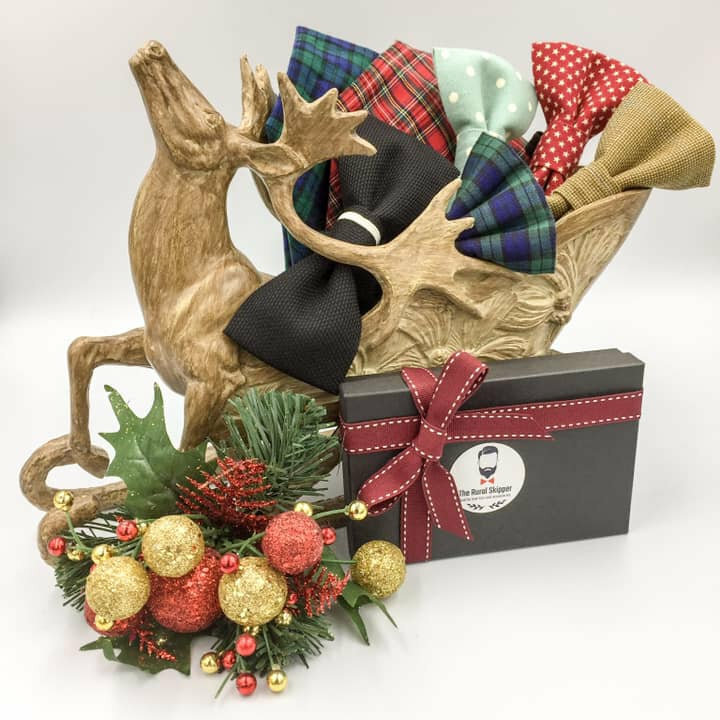 Our ranges are fun, great quality and where you’ll find that perfect Christmas gift. 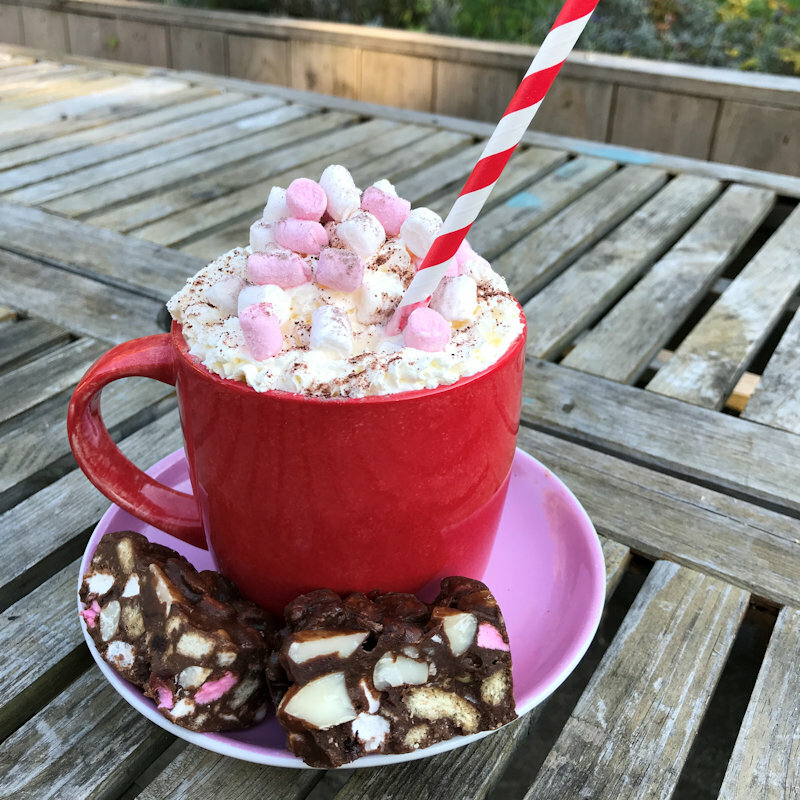 We will have selection packs,hampers and stocking fillers which make great gifts for you cider lovers and be sure to try our warm spiced cider by the cup to keep you feeling festive and warm! 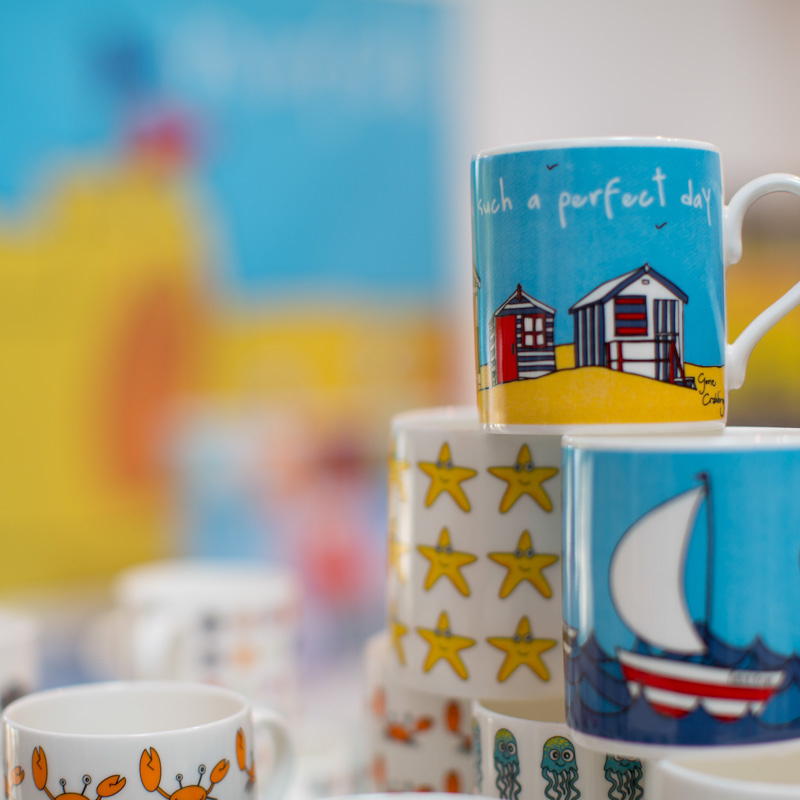 Hand made contemporary pottery for the home in coastal colours. 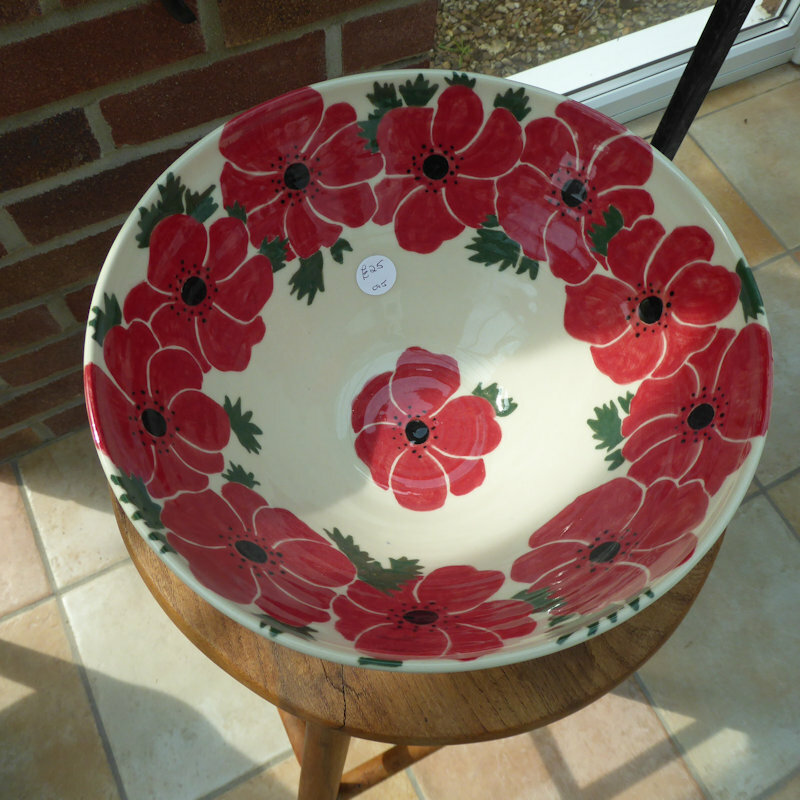 A great range of practical, useful kitchenware and really unusual gifts of quality at an affordable price. Traditional willow hurdle maker, in situ willow fencing & panels, bird feeders, lanterns and christmas wreaths. 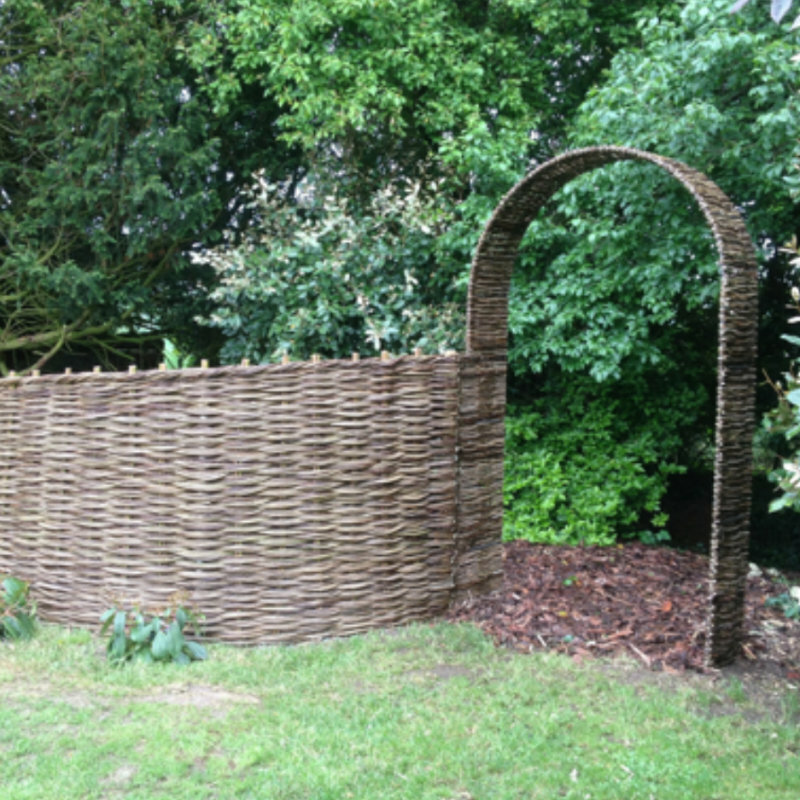 Come and see some demonstration of willow wreathes over the weekend. 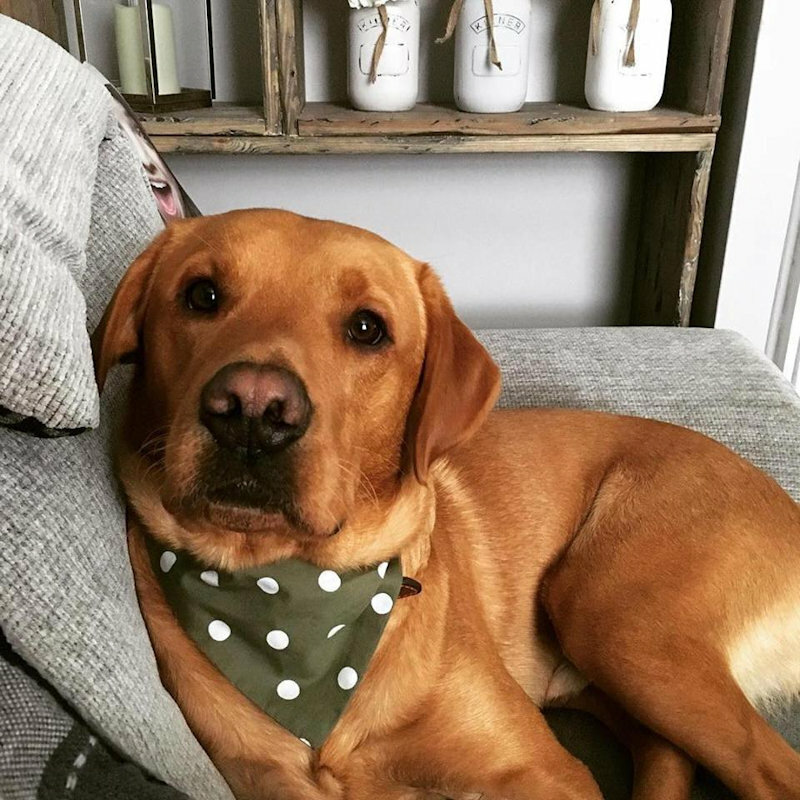 Hand Made Dog Accessories such as coats, blankets, snuggle sacks, bandanas, scarves, bow ties and toys. Unique crafts from Spare Time by Helena. Ranging from framed Textile Art, Clocks made from reclaimed wood. 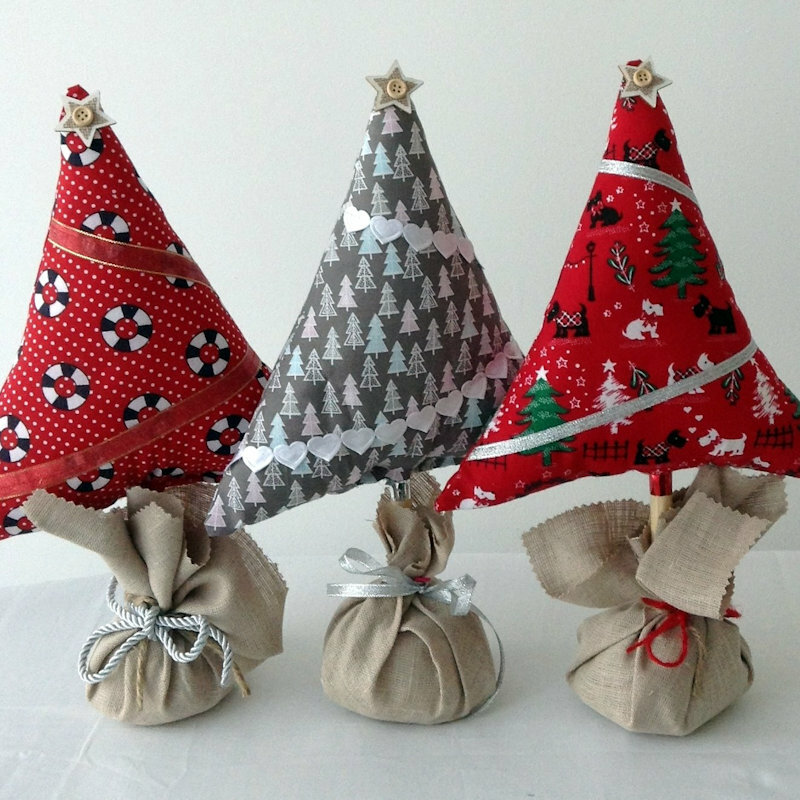 Christmas Bunting, Unique Cushions, Notebooks, Rag Wreaths and Cards. Commissions taken. 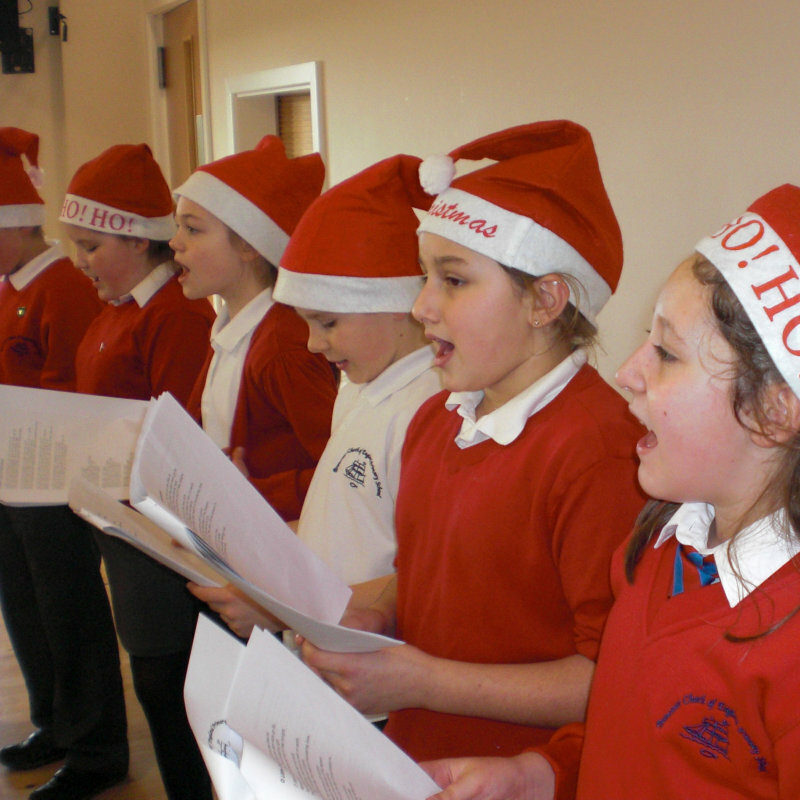 Tombola stall, run by the pupils, to raise funds for the local village school, Brancaster CE VAP School. 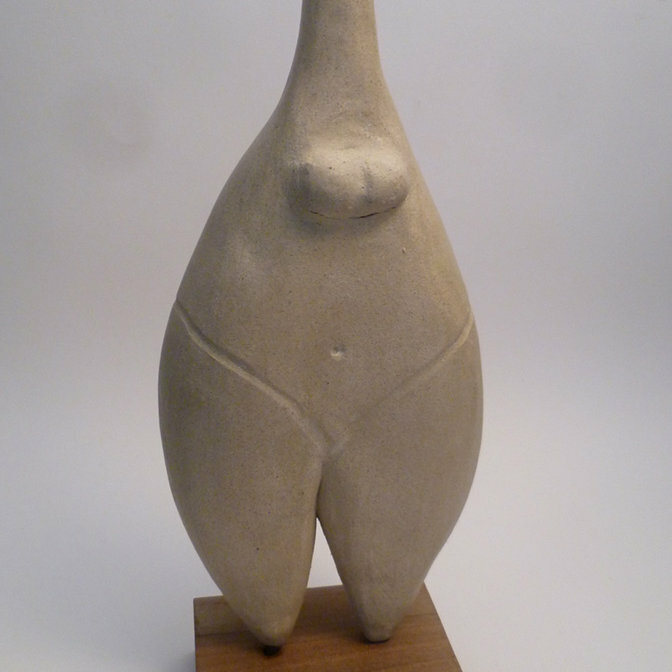 If you are looking for unique contemporary hand made ceramic sculpture, this could be it. 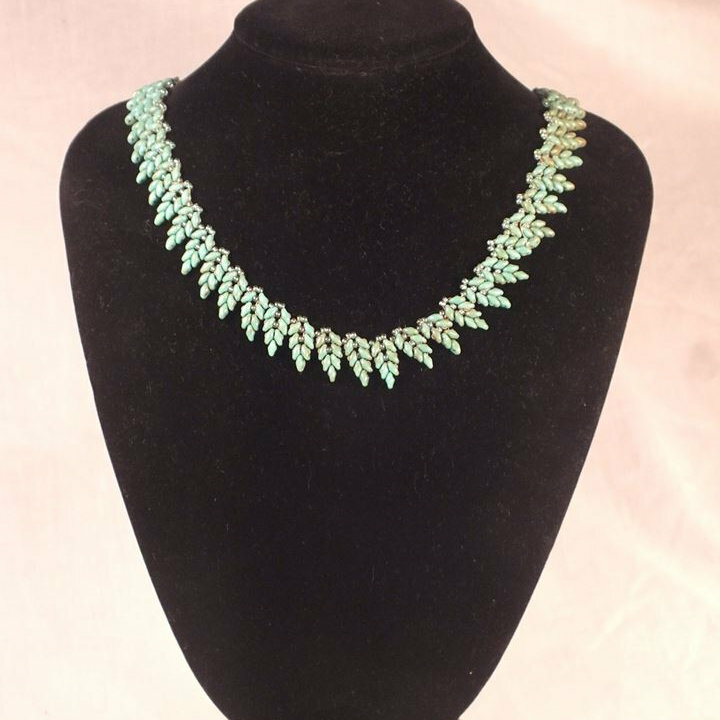 Pieces are elegant or quirky enough to make you smile. An original and affordable gift not found elsewhere. 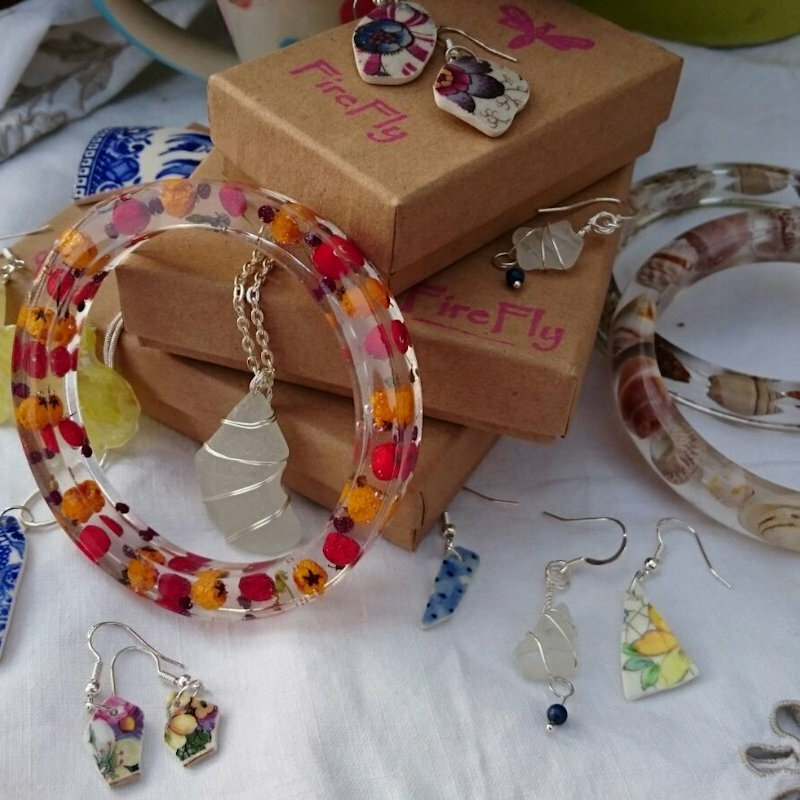 Unique jewellery & gifts using real flowers & organics set in resin, sea glass & vintage china. All collected by us on our travels then hand crafted to create completely individual pieces. 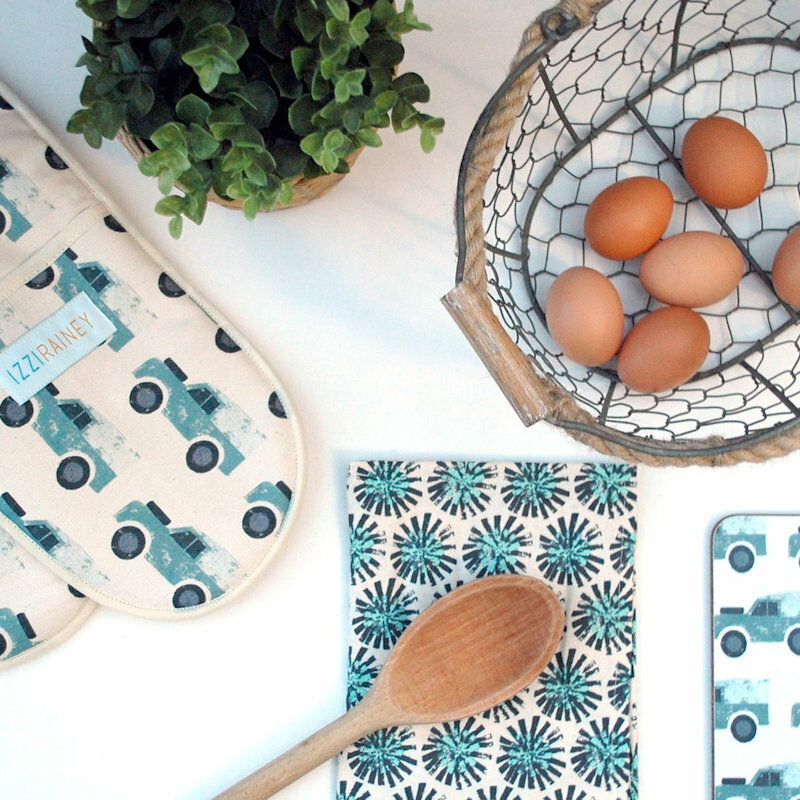 IzziRainey is a Norfolk textile company, based on a farm designing and manufacturing high quality, homeware and interior products in Norfolk and the UK. 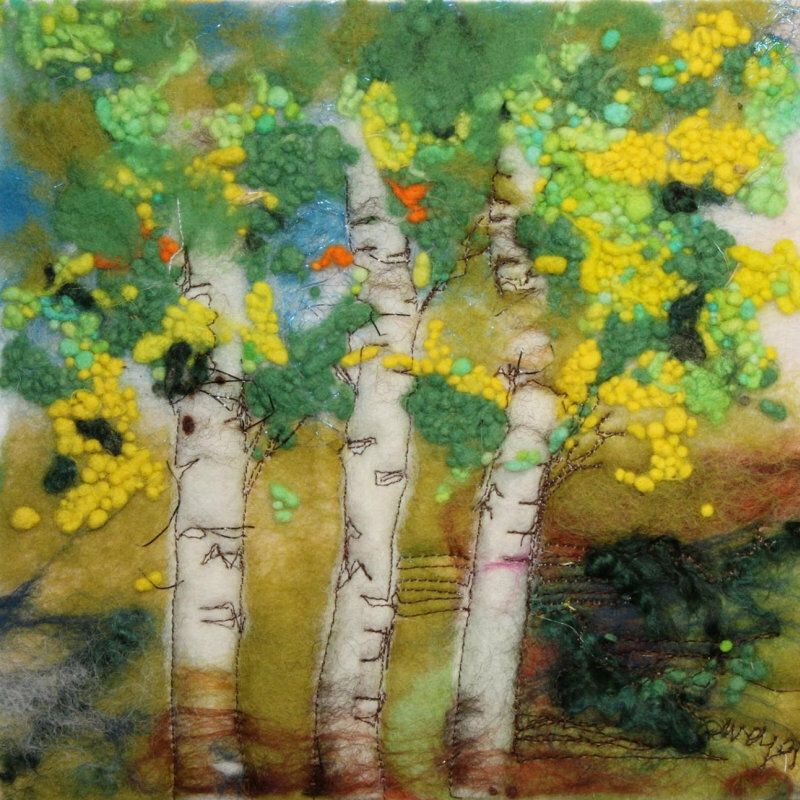 Two Marys designing and making a range of functional and decorative fused glassware using the colours and textures of our beautiful North Norfolk landscapes for inspiration. Local charity that provides a wide range of flexible and integrated health & wellbeing services for the community we serve. Handcast leadfree pewter from handmade silicon rubber moulds. Salt cellars,spoons,walnut,poppy and acorn containers. Full size langustines and hermit crabs. 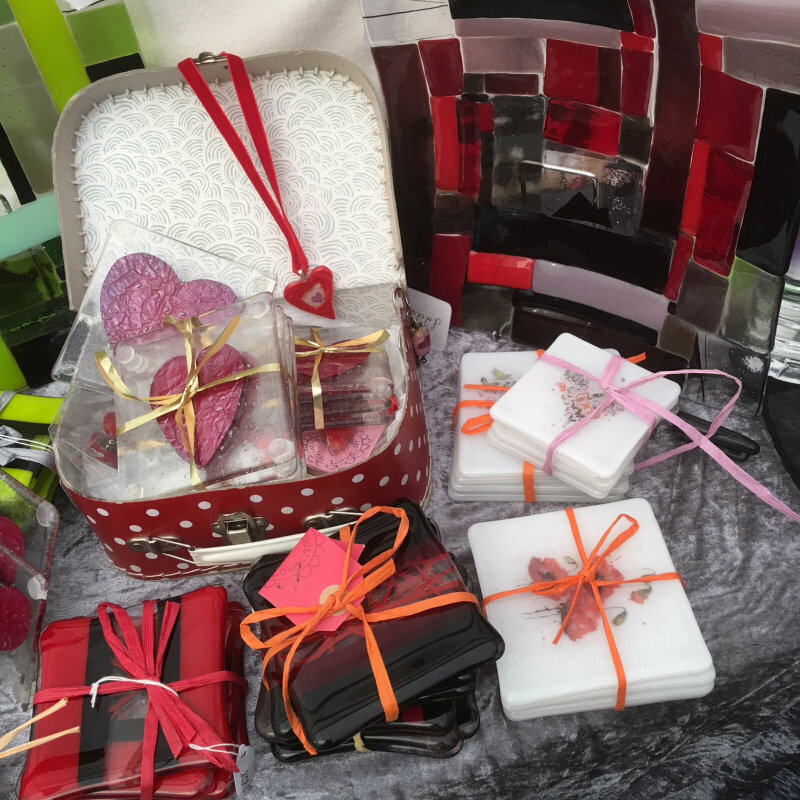 Jewellery,paperweights and more. 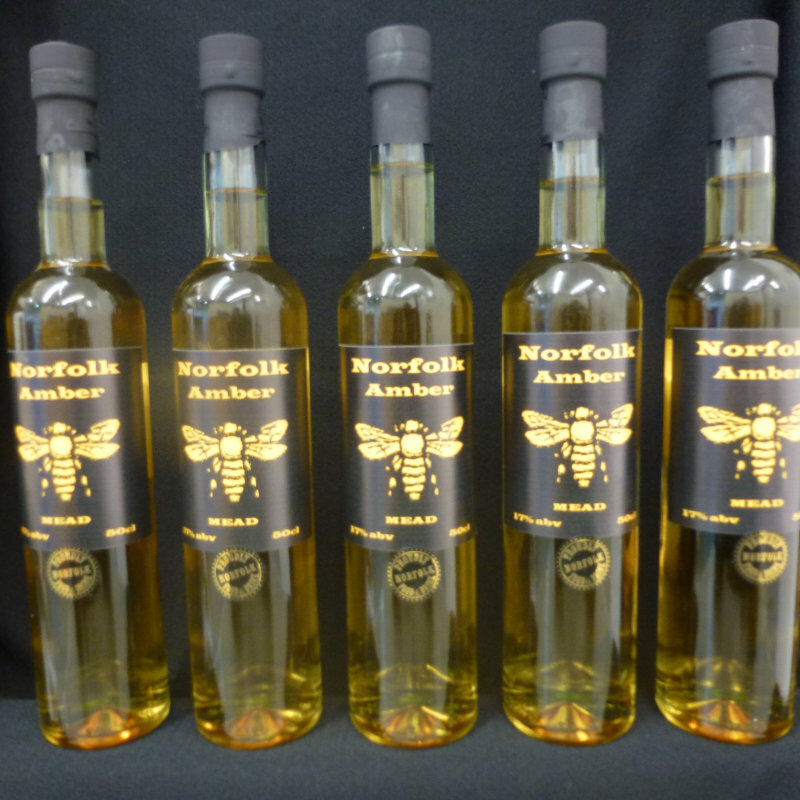 Locally brewed Mead at 17% abv which takes 9 months to ferment; honey cider at 6% abv from local apples and honey. 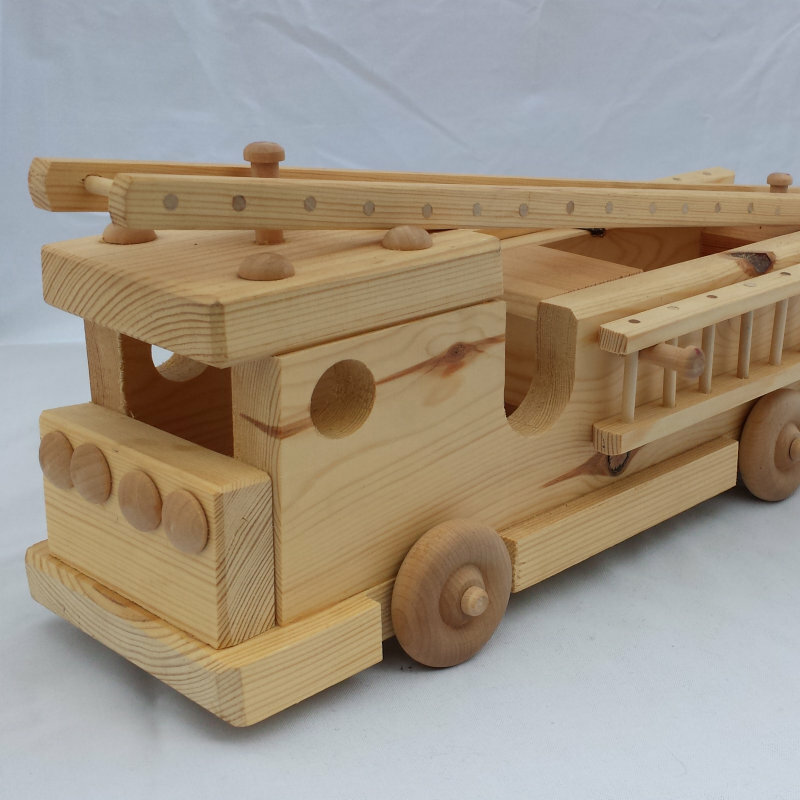 We make rustic wooden crafts, mainly out of recycled wood. 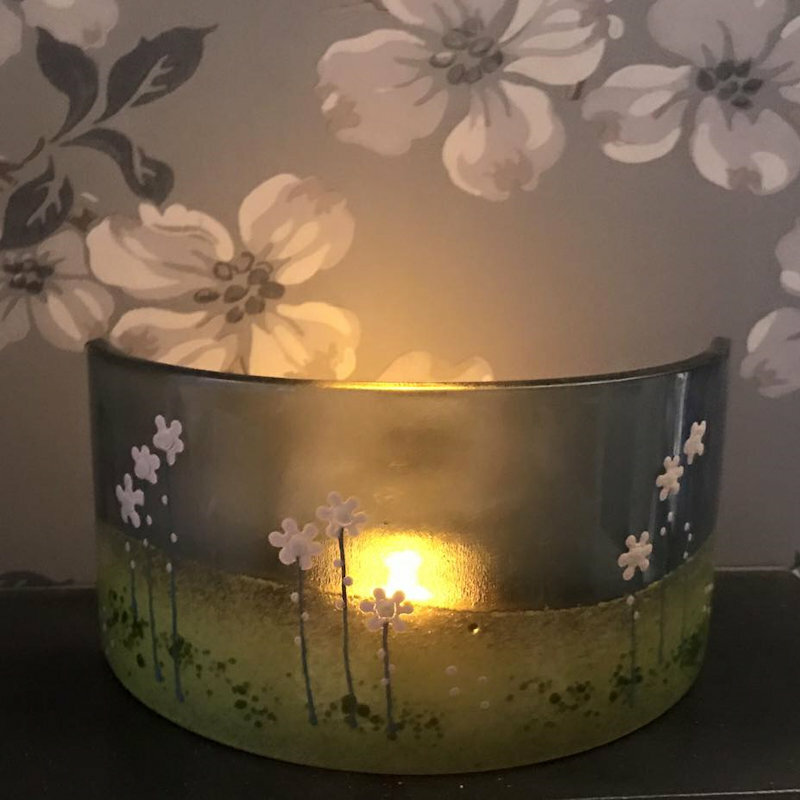 We have a selection of hand made and designed candles, clocks and vases. 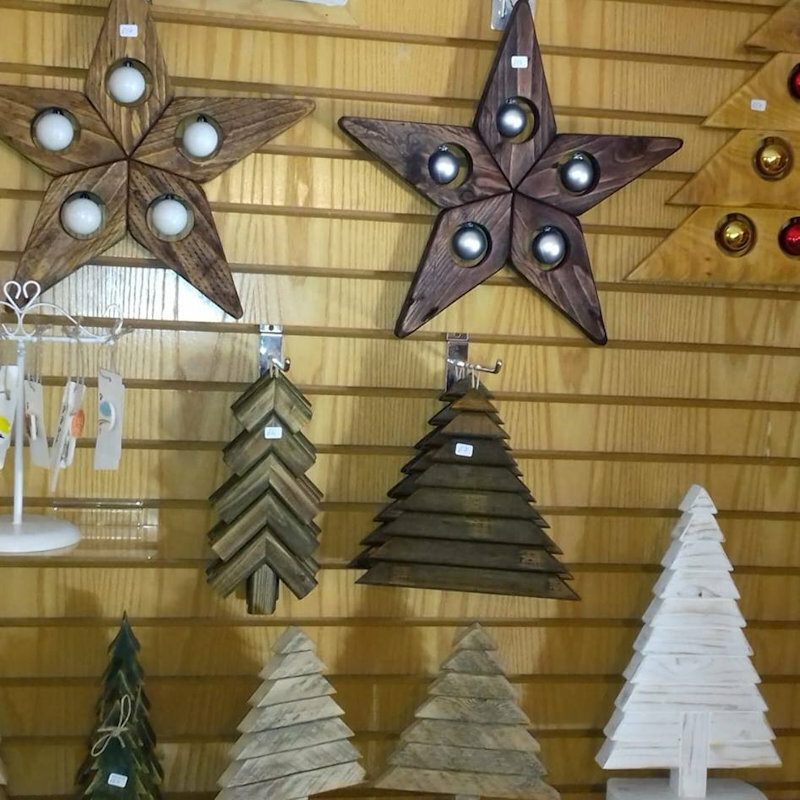 A great range of Xmas decorations, ranging from £3.50 to £20. 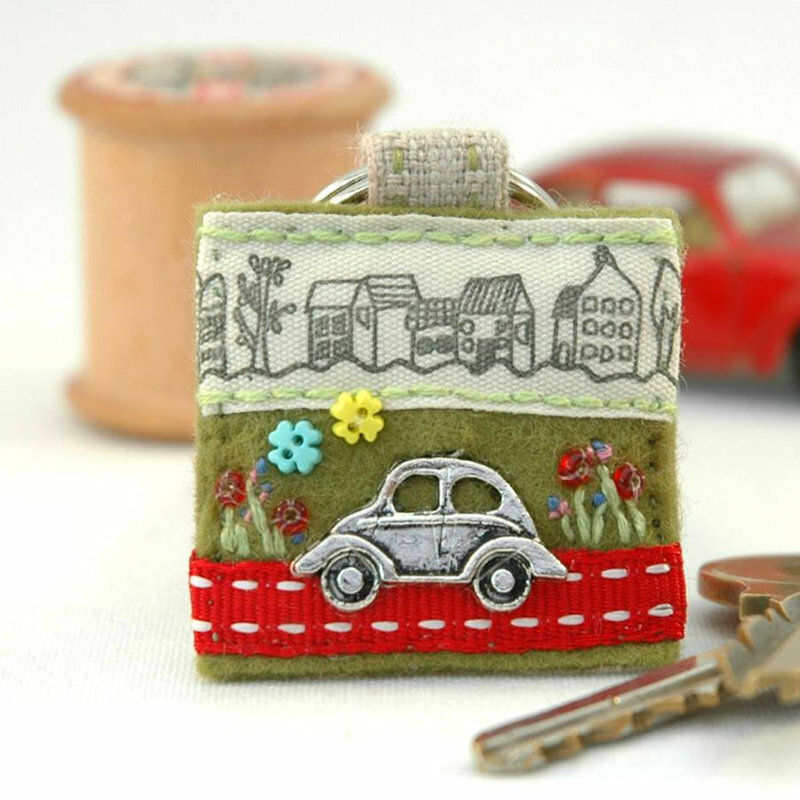 Individually designed embellished felt and fabric jewellery, accessories and pictures each sewn by hand, each unique. 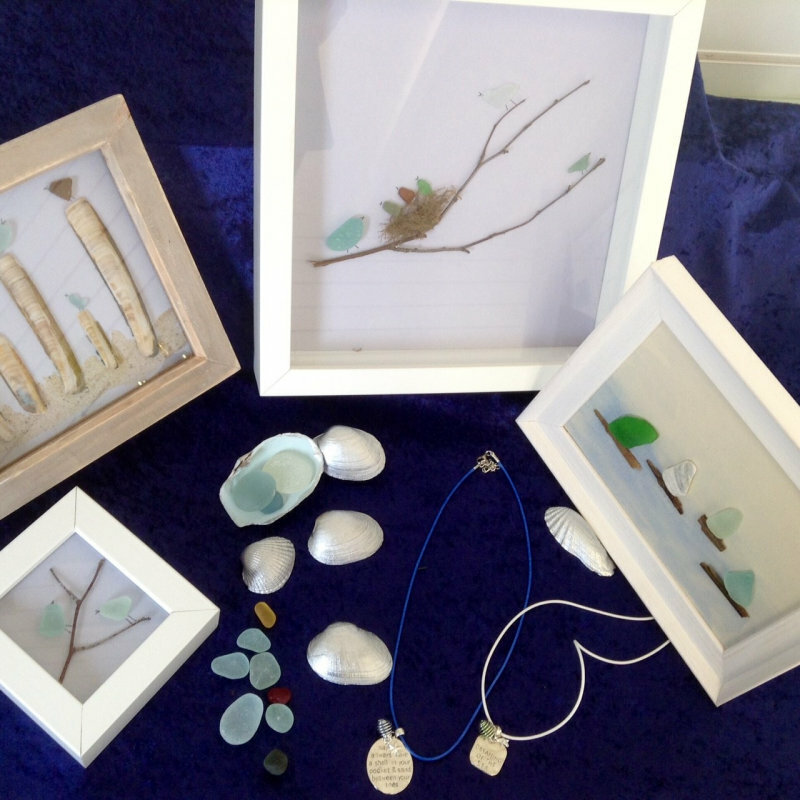 Original art work & gift items produced using acrylics, eco resin,flowers, shells & wood amongst other things! 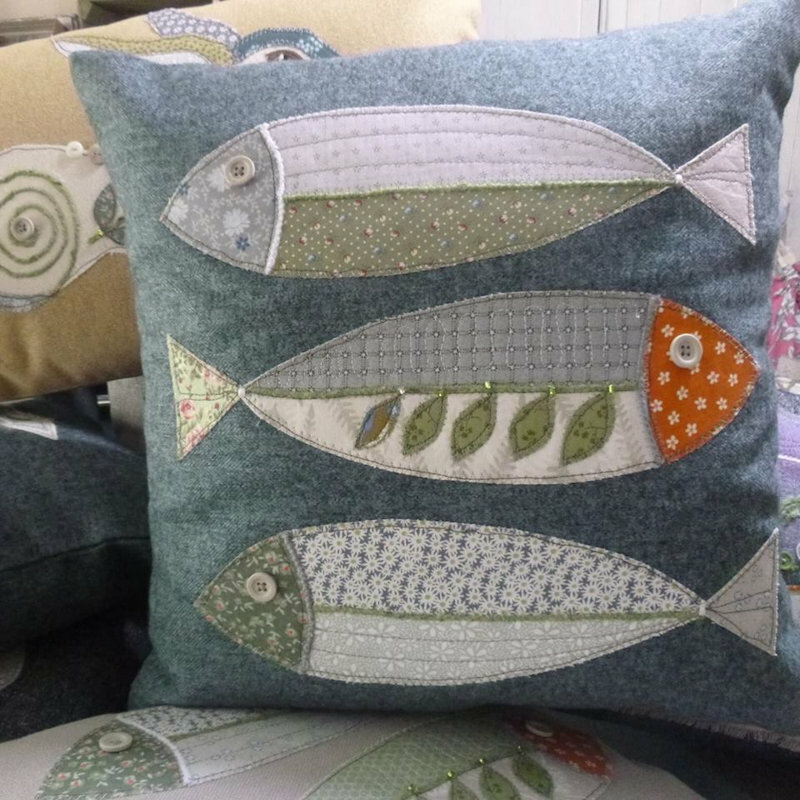 Inspired by history & nature, made in my home studio on the North Norfolk coast. Men’s luxury Socks, clothing, hats and accessories including Unsimplystitched brand. New mens brands Lords of Harlech and Mulitia including some great Coats/jackets. 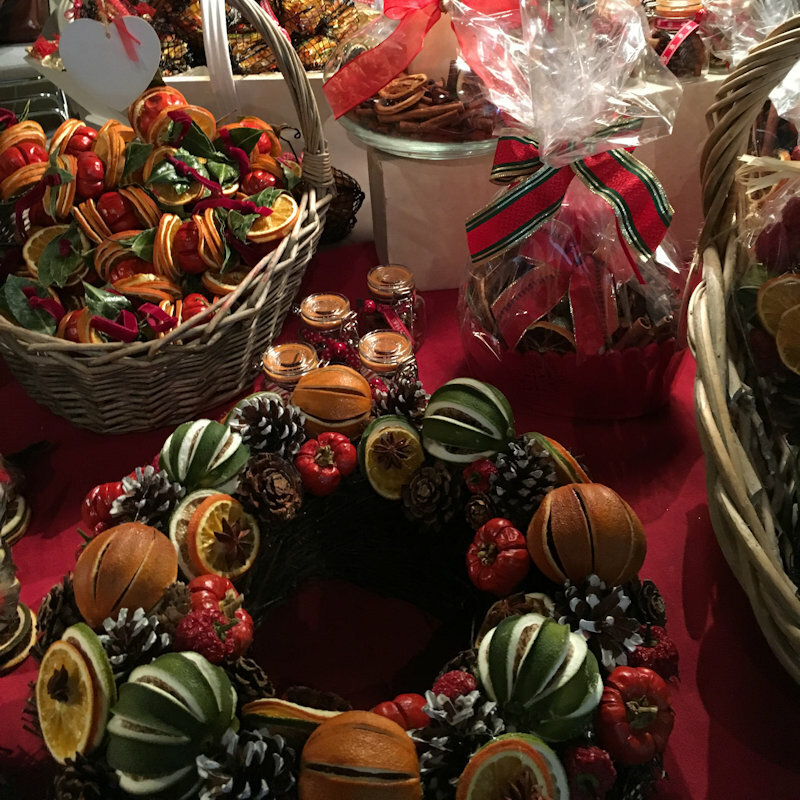 Christmas decorations, hand made with orange and cinnamon. All the decorations have a lovely orange scented fragrance. Hand made in UK. 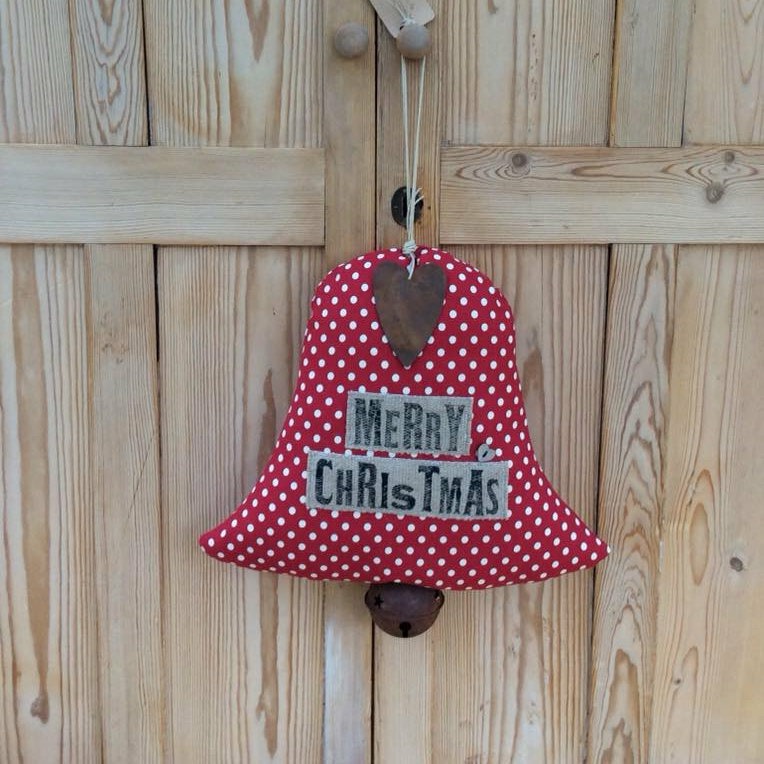 Handmade pretty, individual, lovingly crafted fabric decorations for the home throughout the year and during the Christmas season. 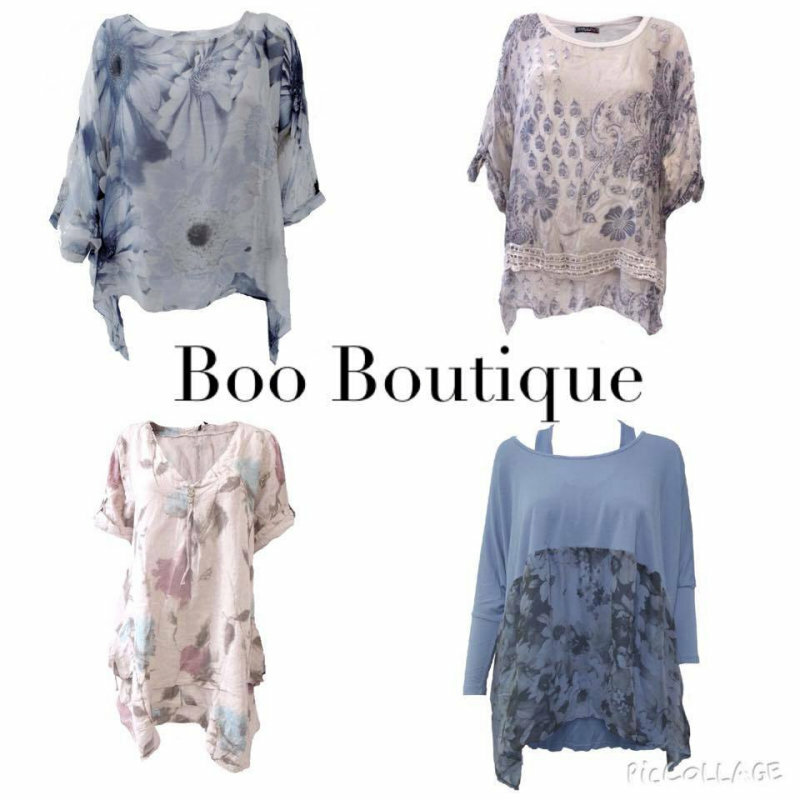 All made in a variety of beautiful fabrics & finishes. Beautiful, bespoke, hand crafted sead bead jewellery created in West Norfolk using the finest components from around the world. 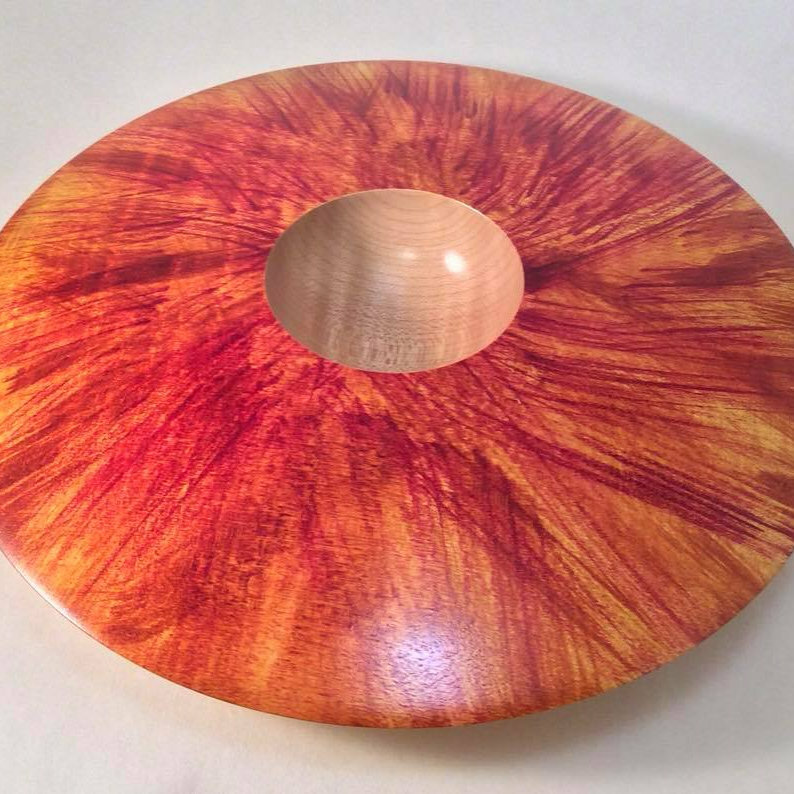 Hand crafted item from sustainable sources in wood and wool. Pole lathe turned stools and chairs plus other small woooden items. Sculptures in needle felt of animals, birds and dogs. A designer of contemporary bow ties, pocket squares, cravats, cummerbunds and accessories. Each item is beautifully packaged in gift boxes. 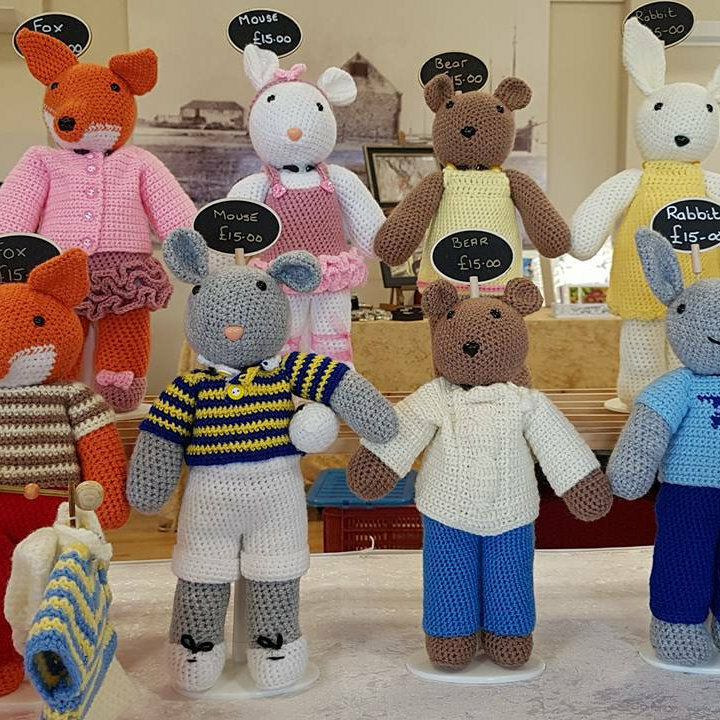 Hand crocheted animals, birds, dolls and bears. CE marked. 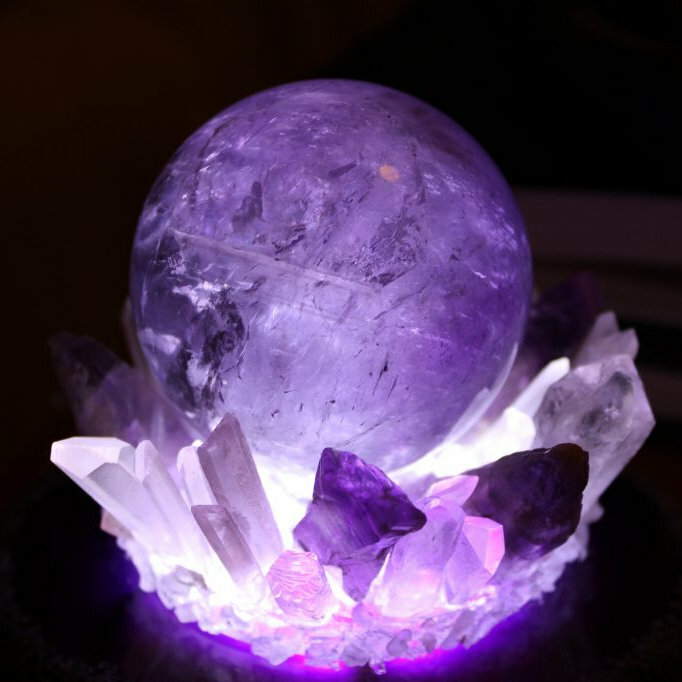 Unique items and commissions undertaken. All made by me. 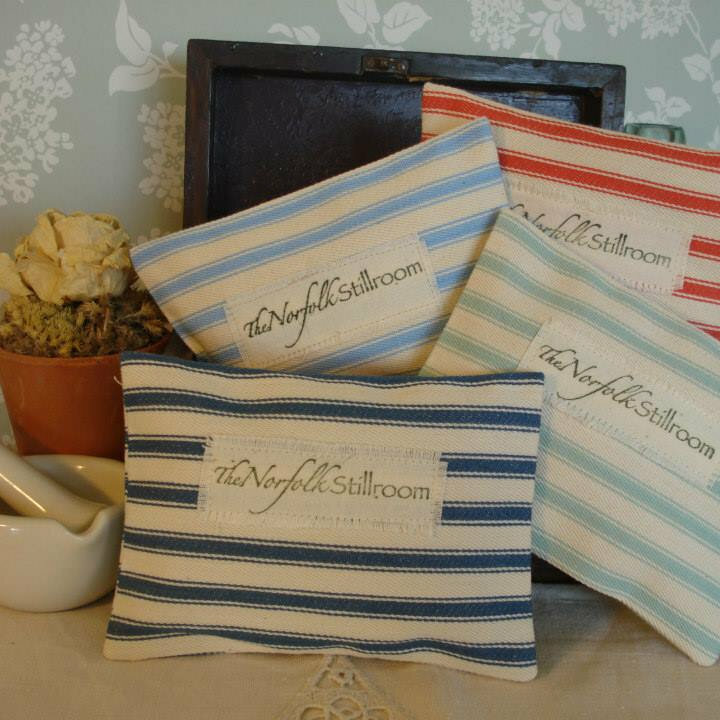 Soft furnishings and fabric accessories for children and adults uniquely designed and hand made in North Norfolk. 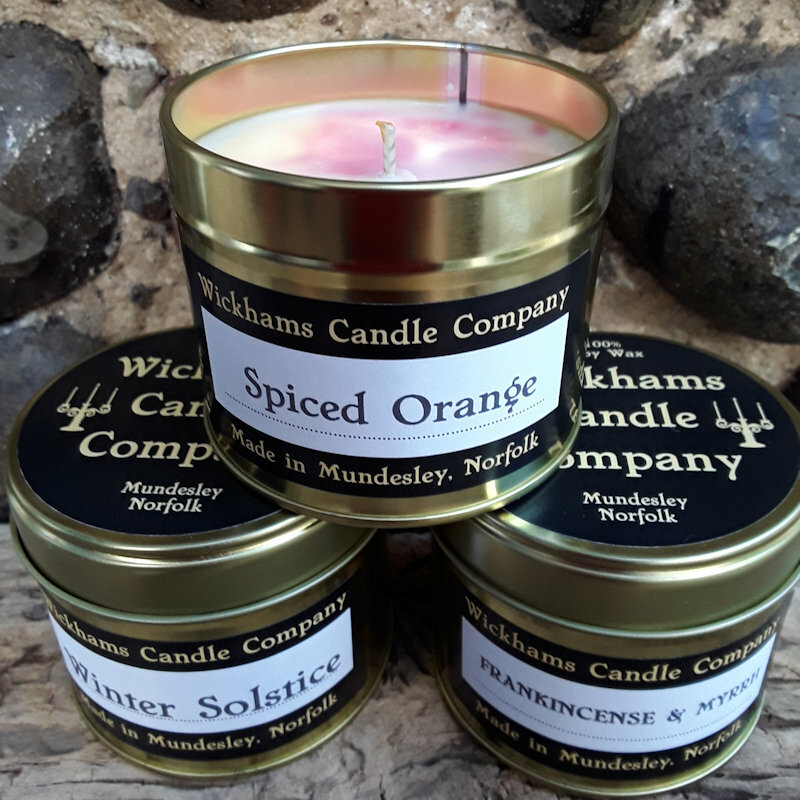 Wickhams Candle Company is a Norfolk based business and all our candles are hand-made at our home in Mundesley. 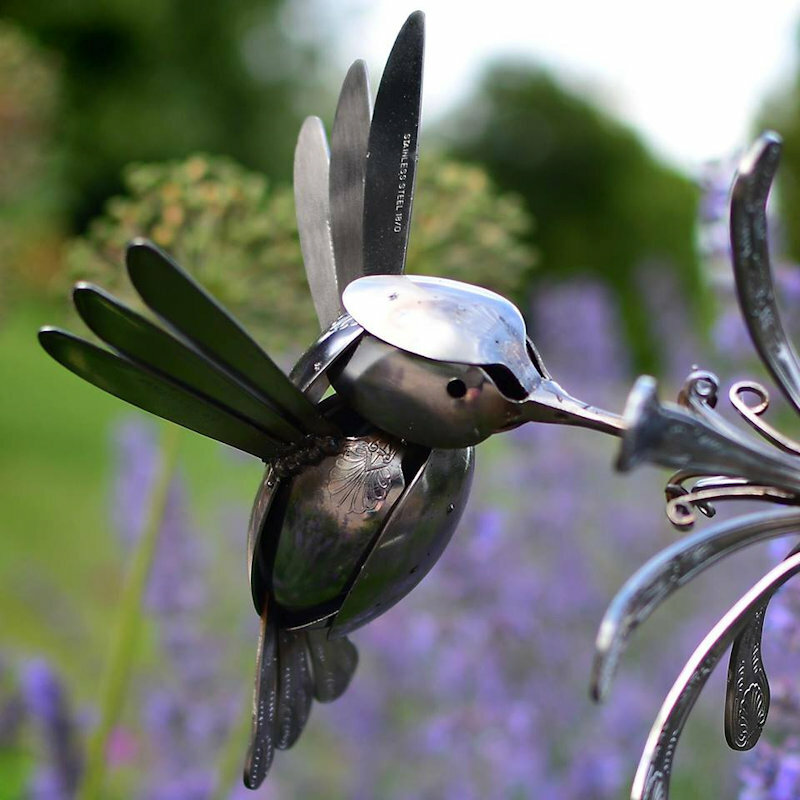 Beautifully handcrafted sculptures for the home and garden made from recycled cutlery and other upcycled materials. 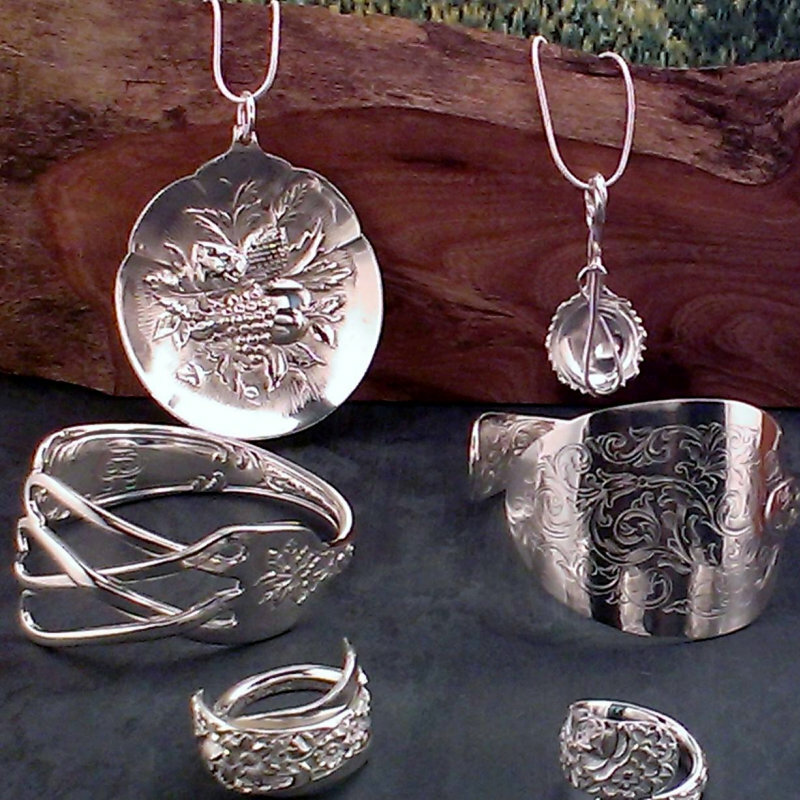 Each piece is totally unique and makes a perfect Christmas gift or personal treat! 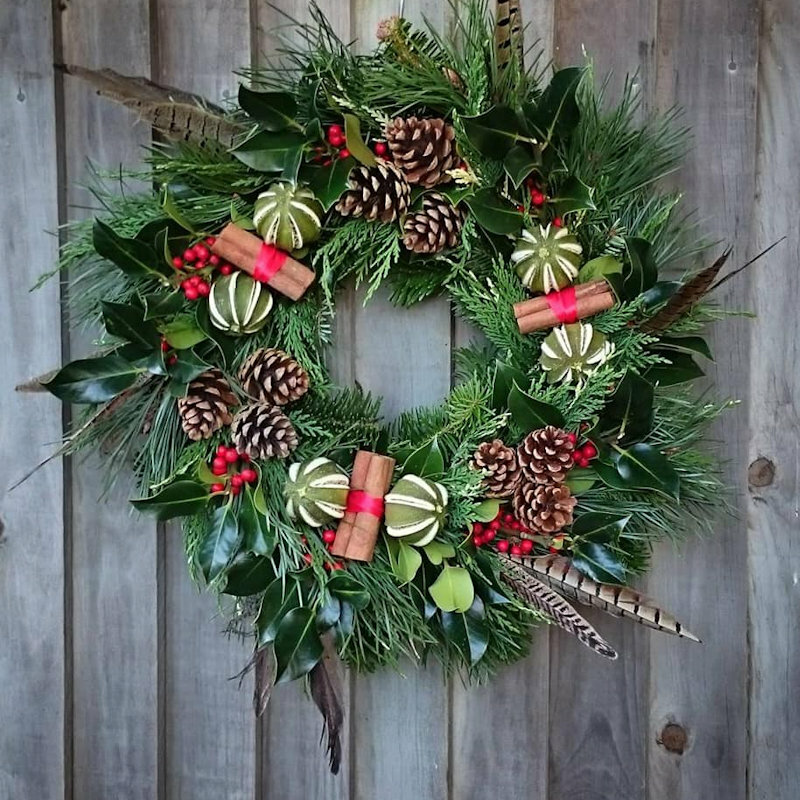 We sell luxury, handcrafted Christmas wreaths & table decorations, & country-style planted containers for the house and garden. 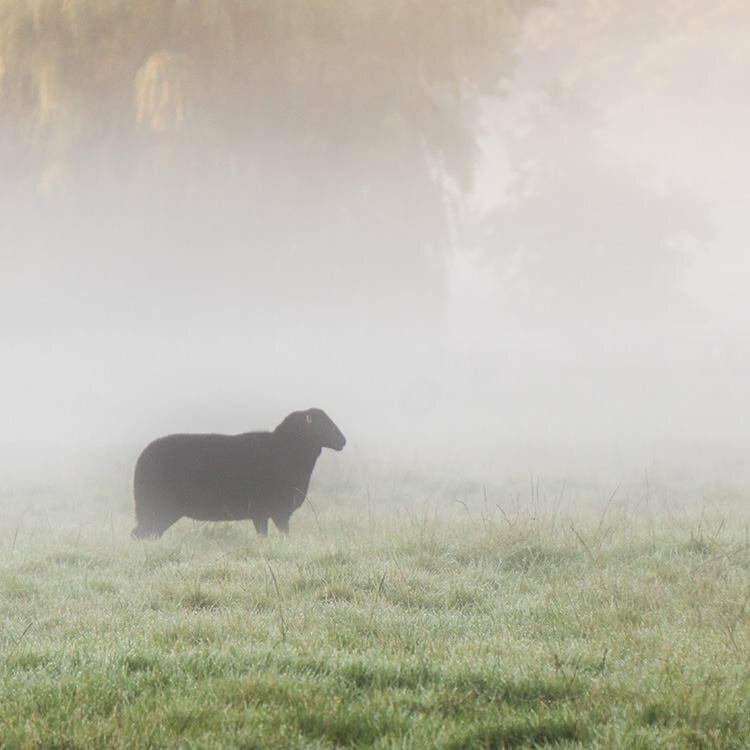 Our products are inspired by the beauty of the Norfolk countryside. 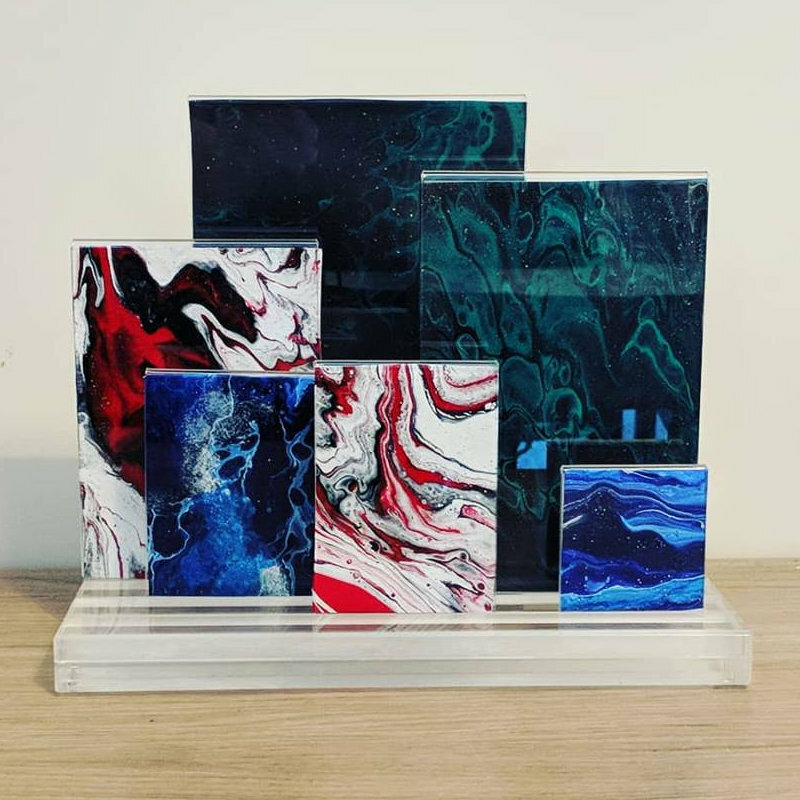 Unique, handmade, contemporary fused glass art and giftware at affordable prices. 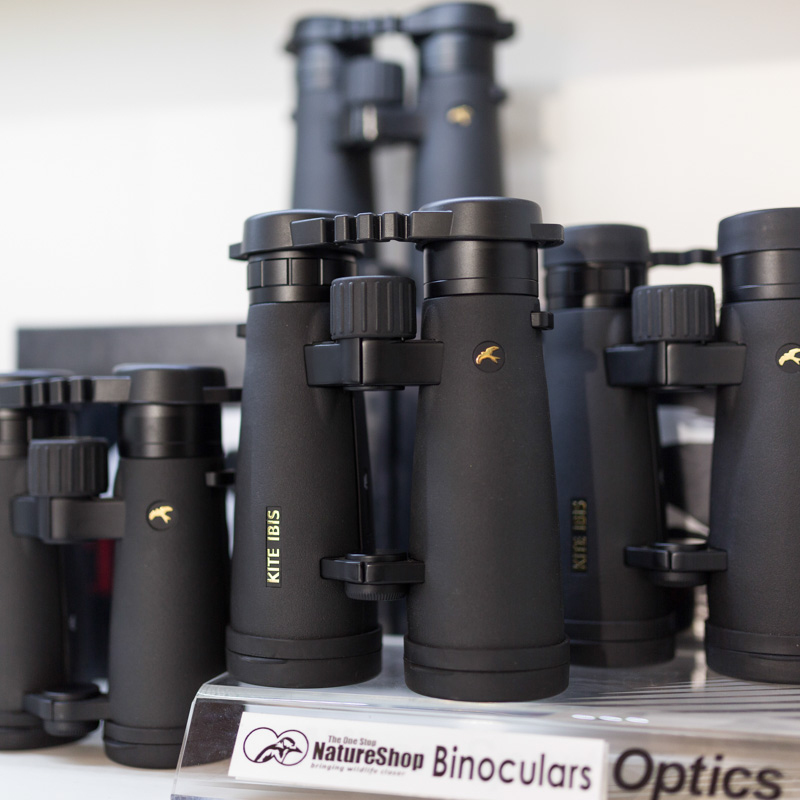 Prices range from £1 to £1000 with a great selection in between. Personalised/commissions also available to order. 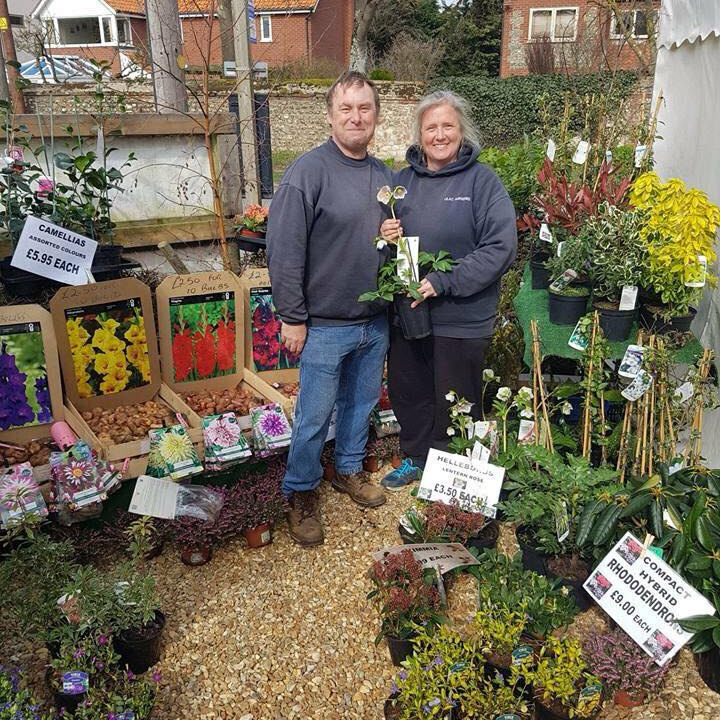 Lilac Nurseries is a long established business making and selling holly wreaths we also sell our own pot grown hyacinths and narcissus and planted Christmas baskets,bowls and tubs for Christmas gifts. 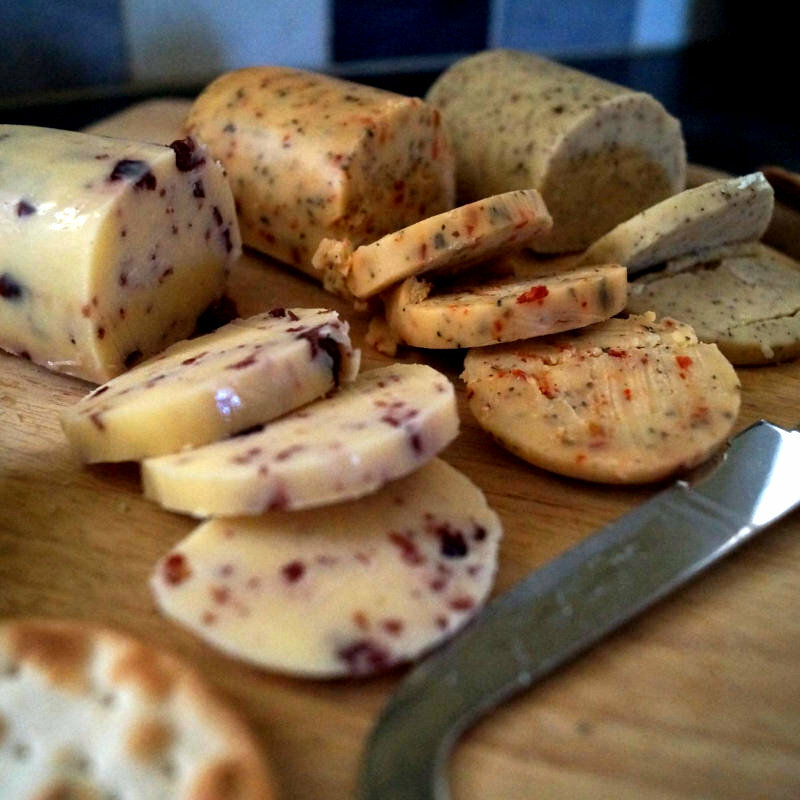 Come along and sample our delicious smoked and flavoured cheeses, we have a wide range, smoked,fruity, spicy, garlic to name a few. All made on our farm by the family. 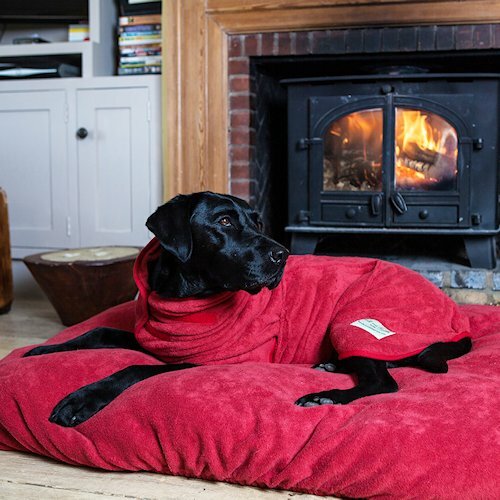 Luxury double thickness cotton towelling dog drying coats, drying mitts, sofa throws and dog bed Covers. Practical and stylish solutions for wet dogs. 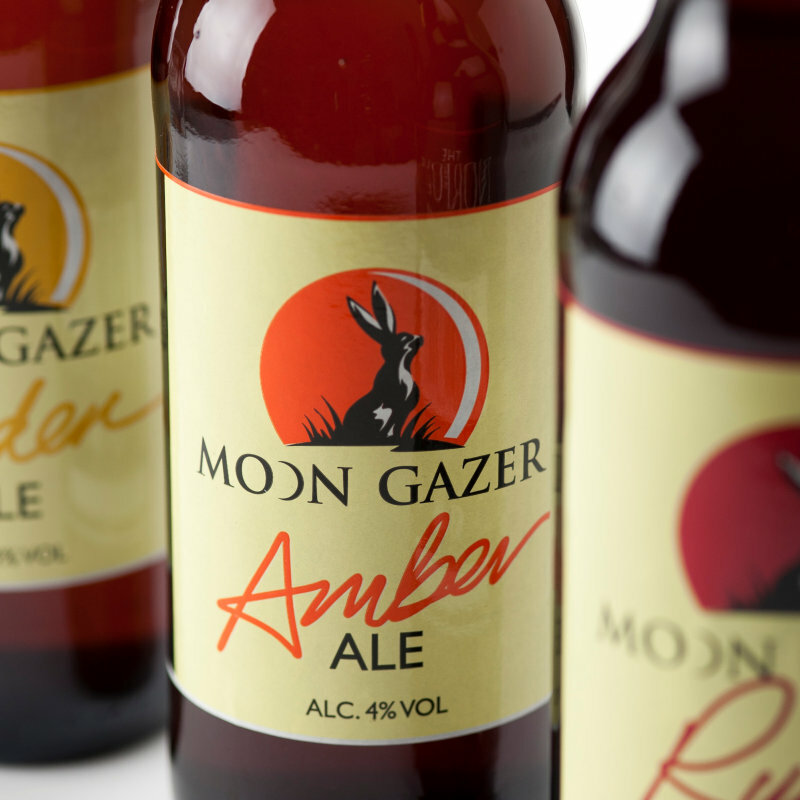 Distinctive and tasty bottled ales and lagers, brewed locally in north Norfolk using water from the brewery’s own well, East Anglia’s finest malting barley Maris Otter and hops from around the world. 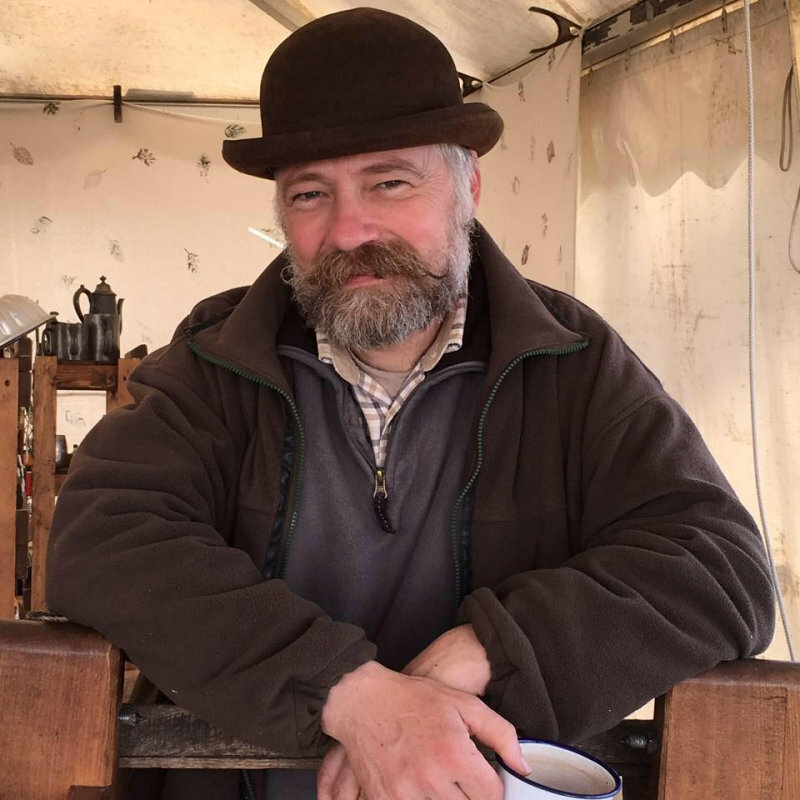 Rob is an artistic blacksmith, based in Dereham, Norfolk. 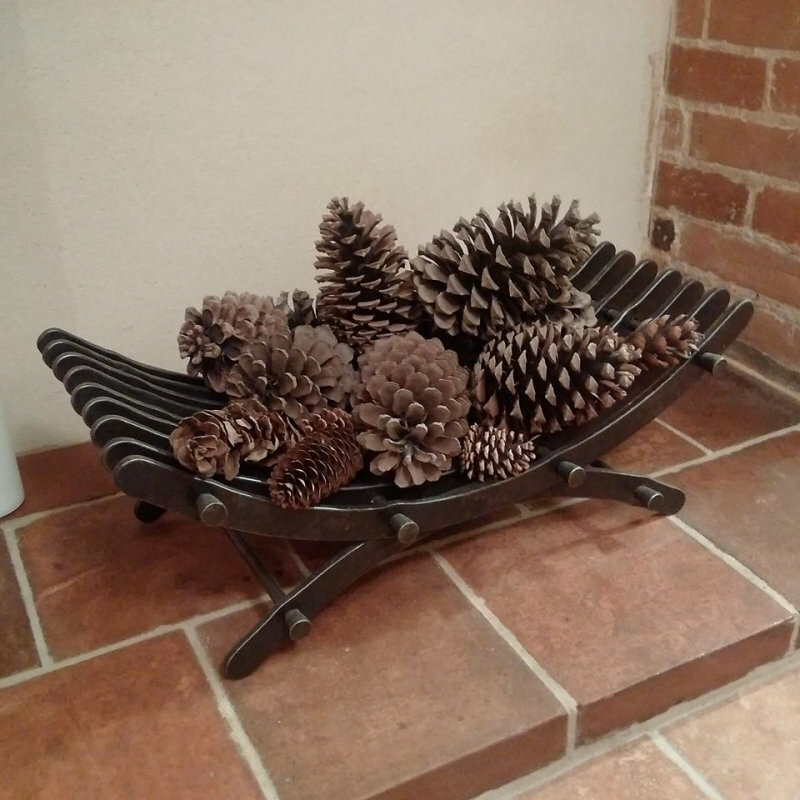 He produces, high quality, hand forged items, both decorative and functional. He gives the same attention to detail on both large or small orders.